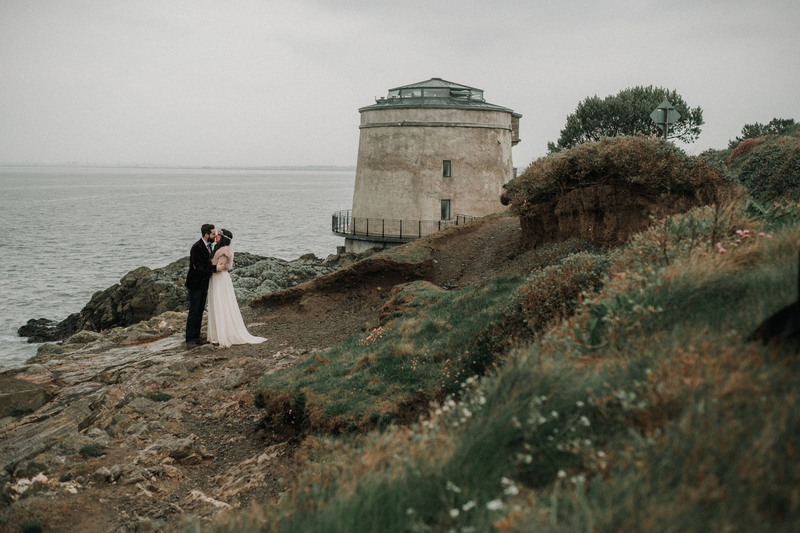 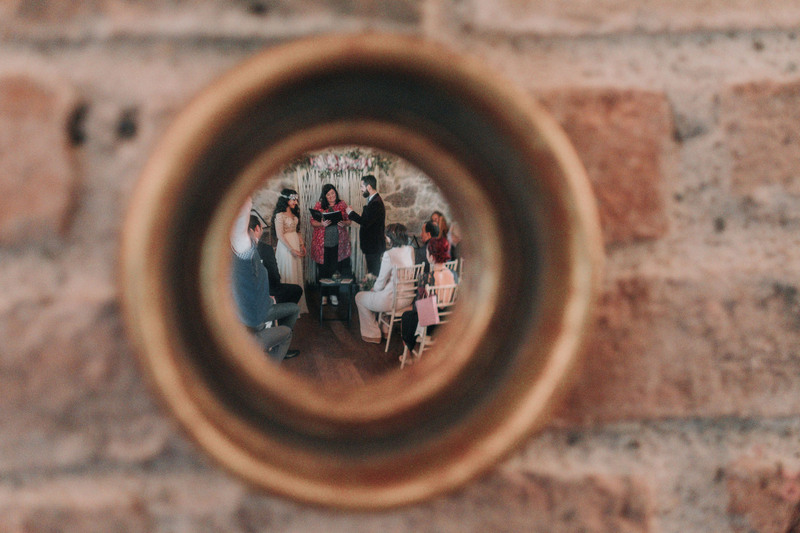 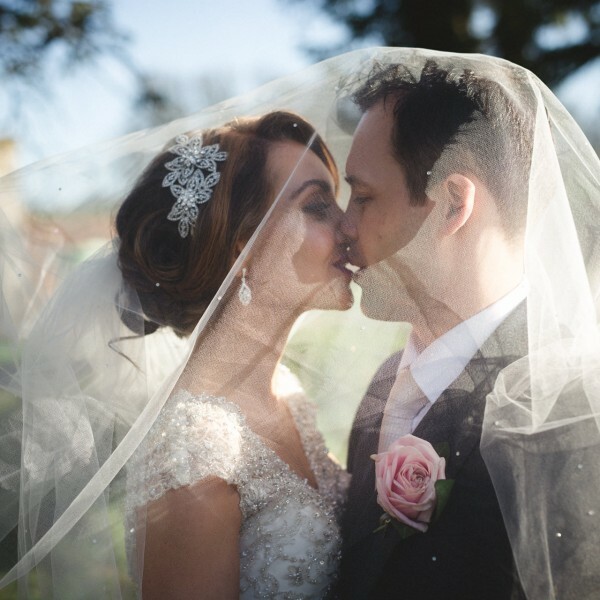 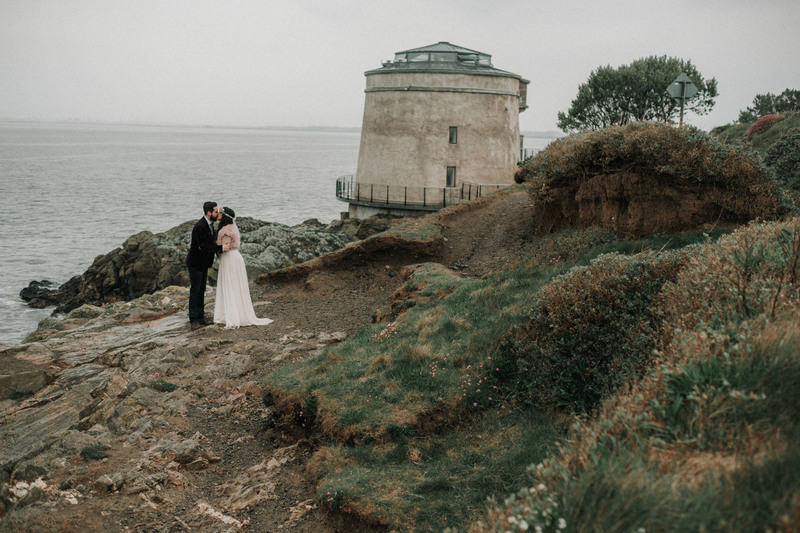 This beautiful Martello tower howth wedding, really encapsulated the likeness of the new bride and groom, Alexandra and Alessandro. 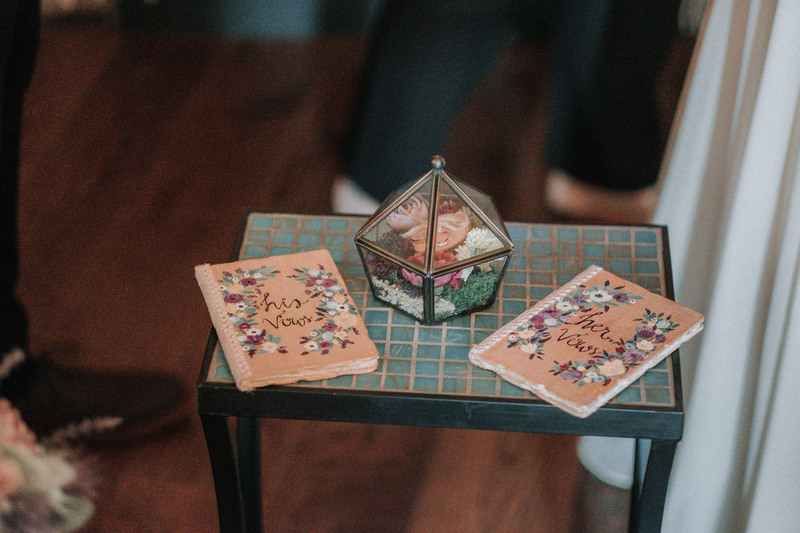 Attention to detail was prominent, and much thought into what represents them as a couple, went into the planning of their wedding. 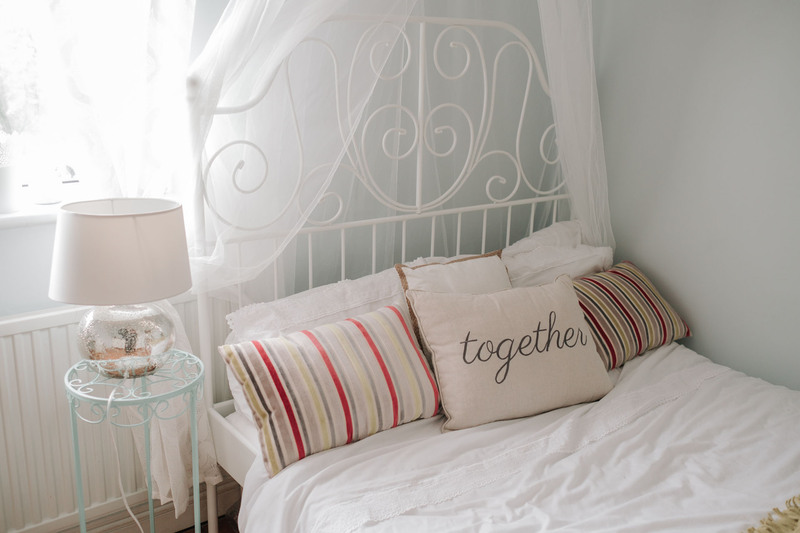 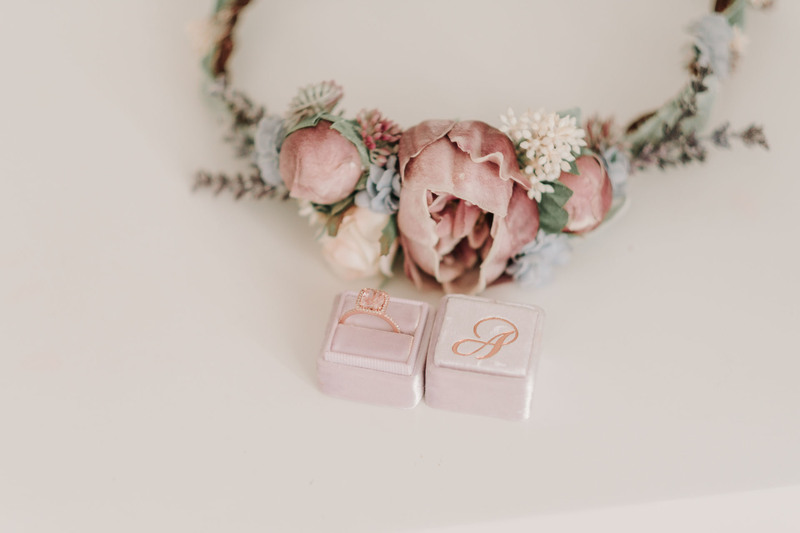 So much so, their celebrations has been divided into 2 very colorful and intimate blog posts. 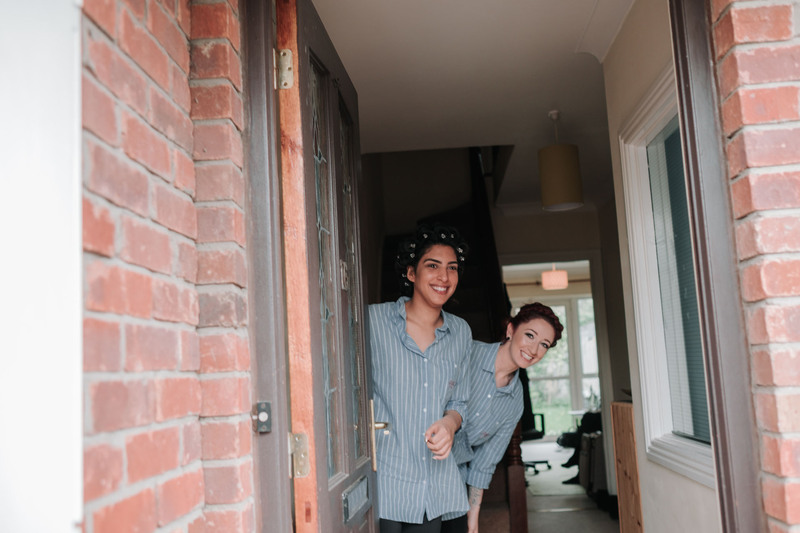 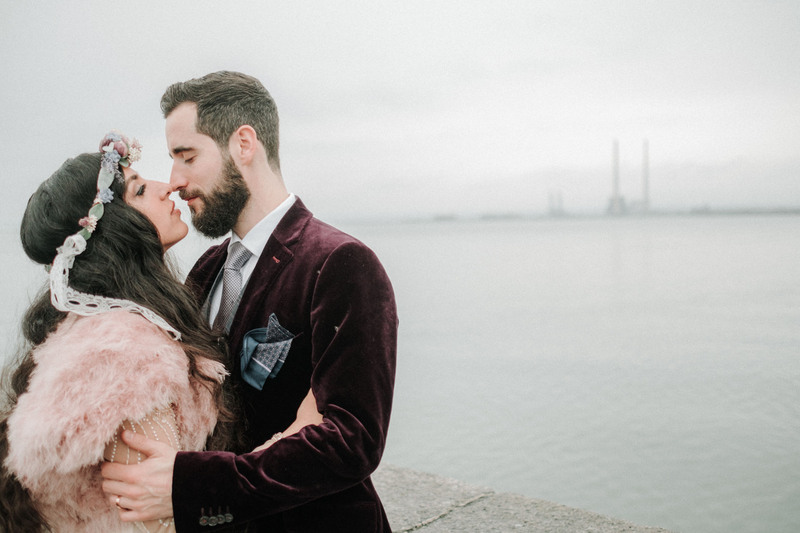 Their wedding day started off at the couples home in Clontarf. 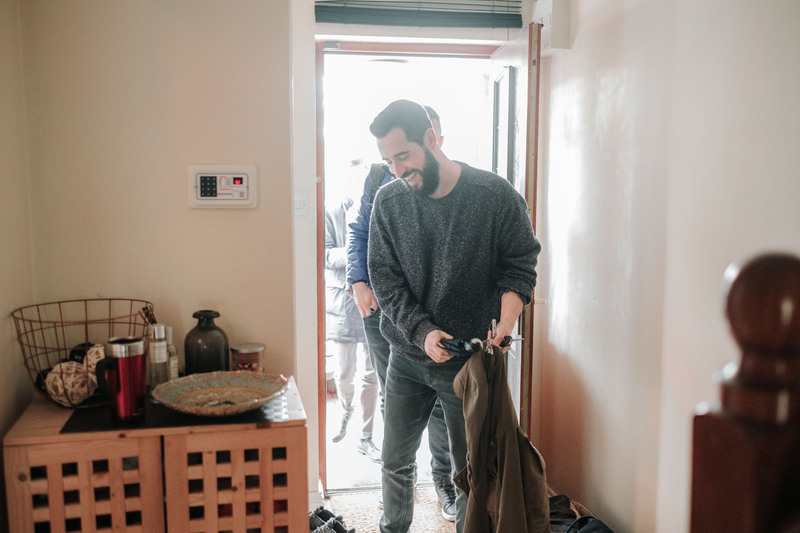 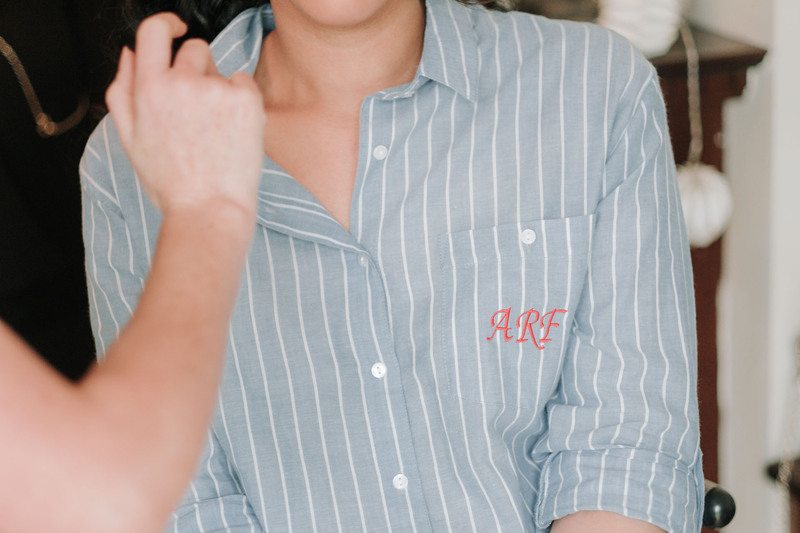 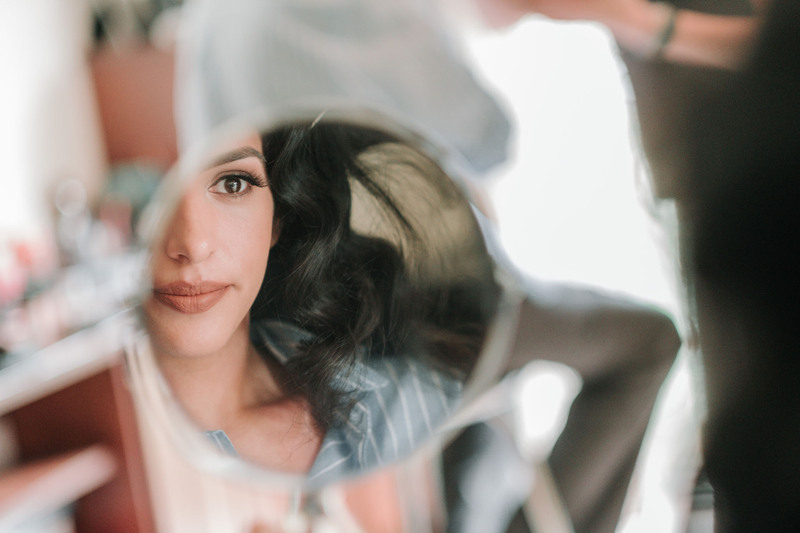 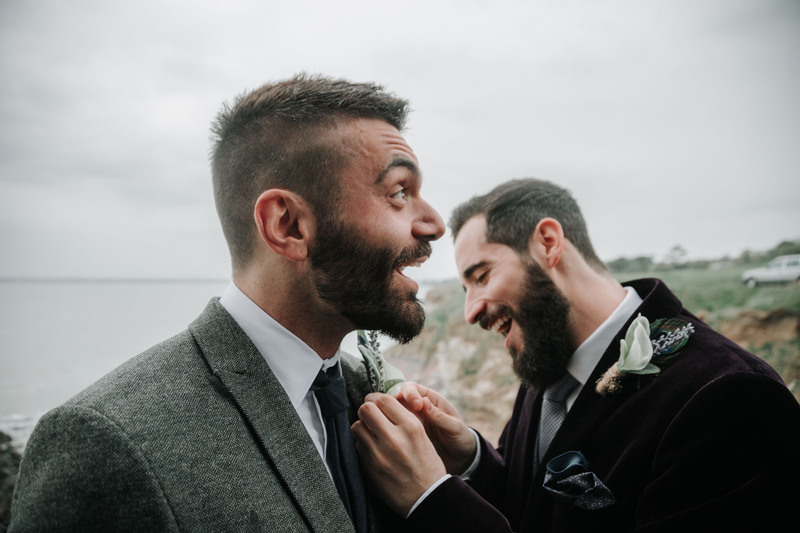 The groom never saw his bride in her wedding dress prior to their service, but they did spend some of the morning preparations together which was a nice change to see. 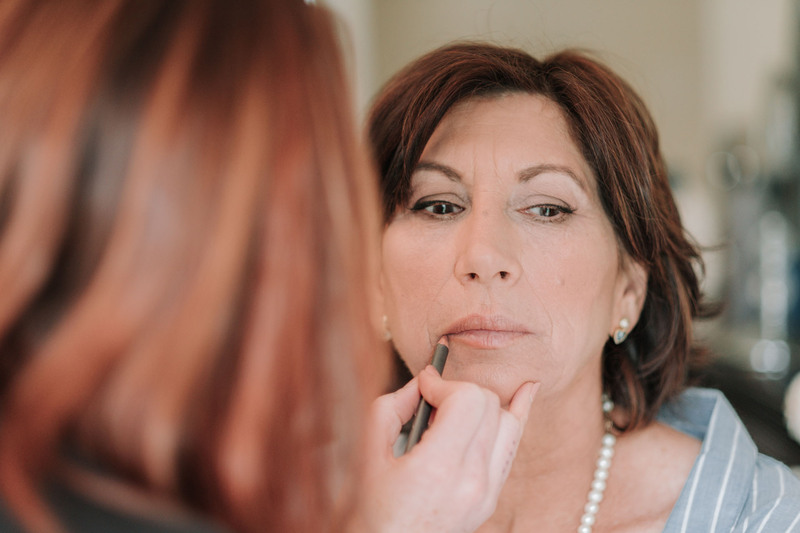 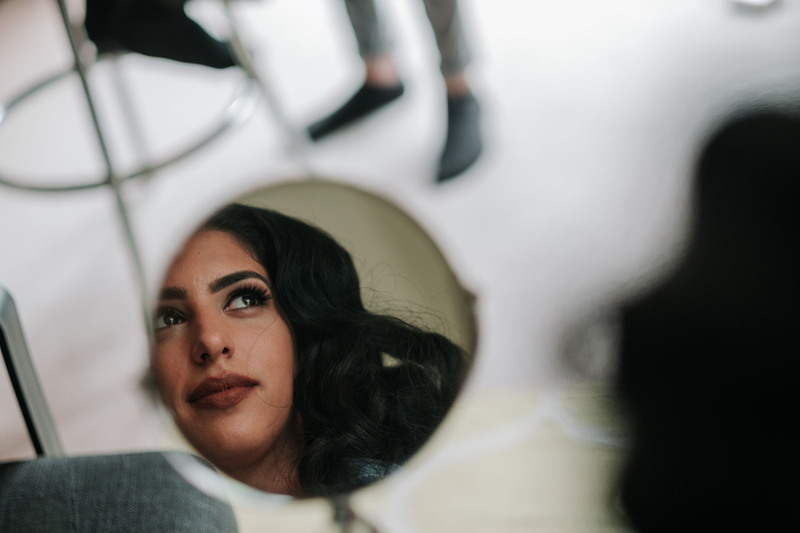 He even watched romantically as she had the finishing touches applied to her makeup. 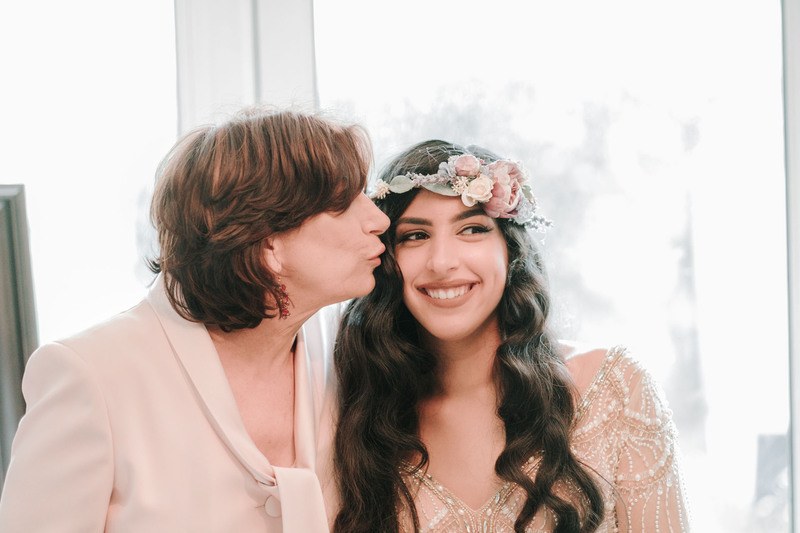 Alexandra then spent the morning with her mother and her two lovely bridesmaids who flew in from Spain for the celebrations. 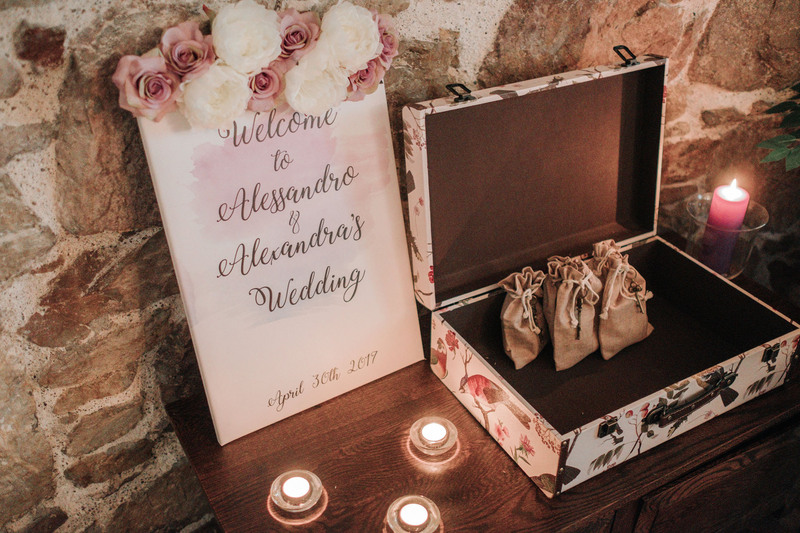 The girls helped take care of last minute details, even sneaking off to write Alexandra a letter to gift to her later on. 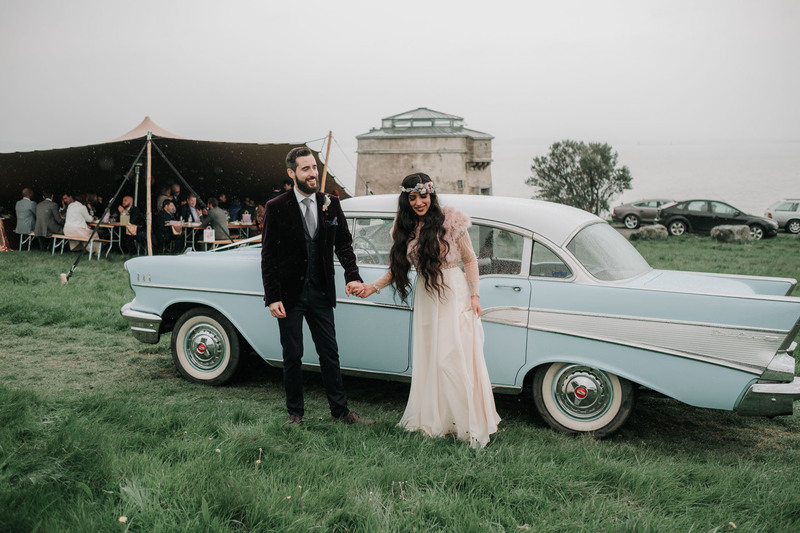 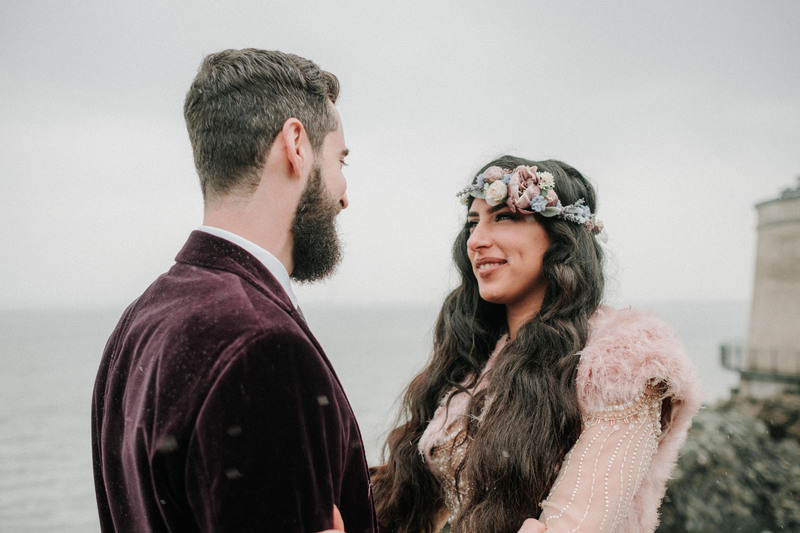 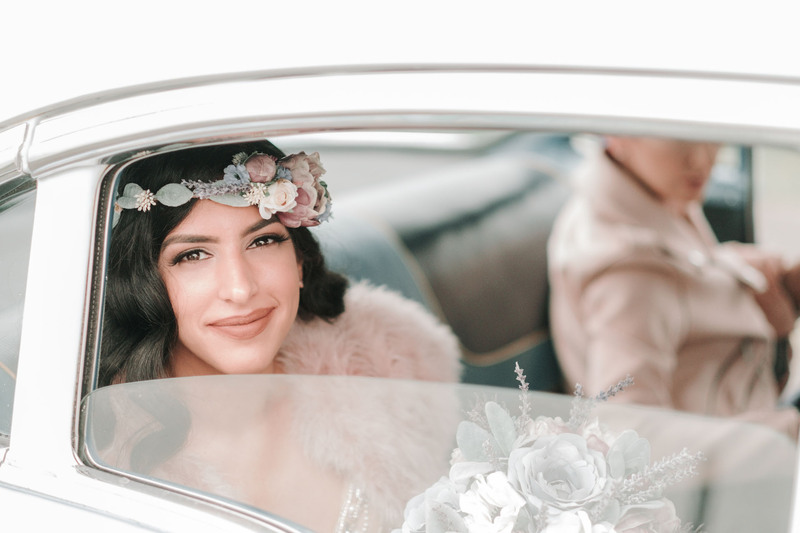 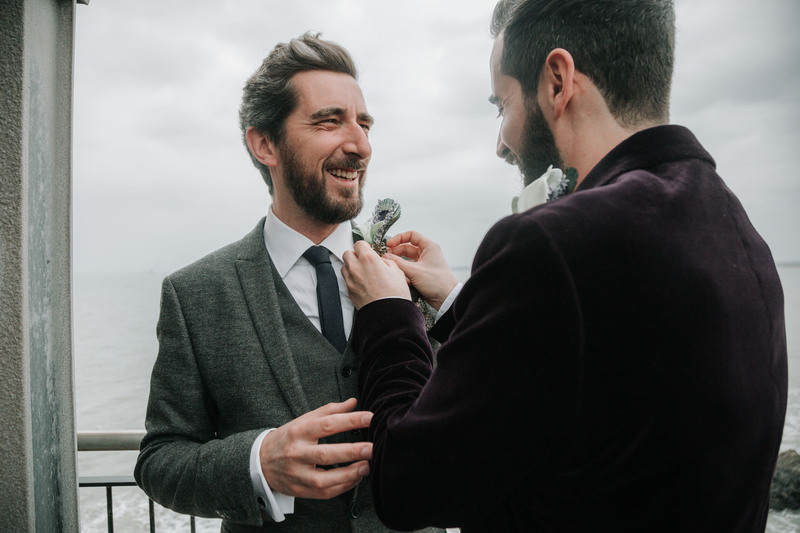 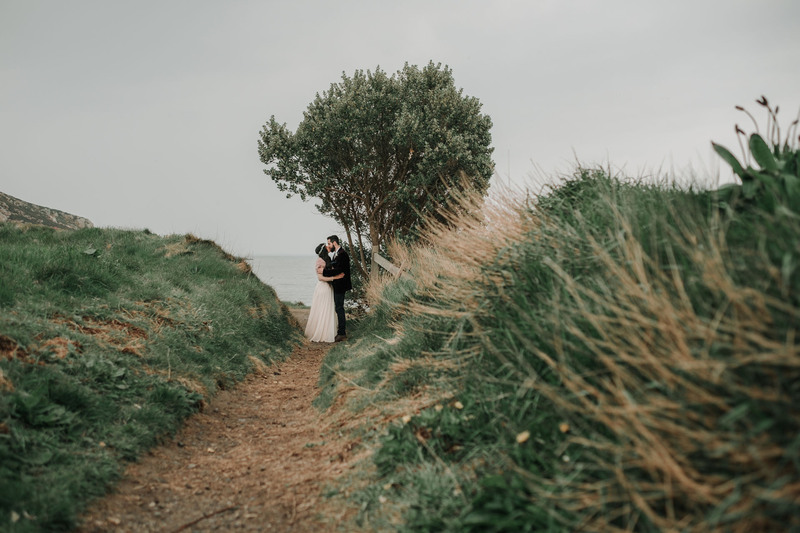 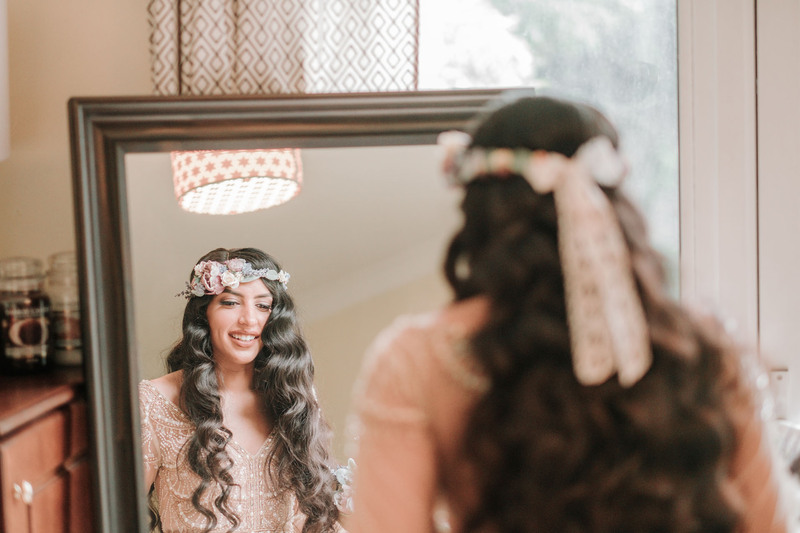 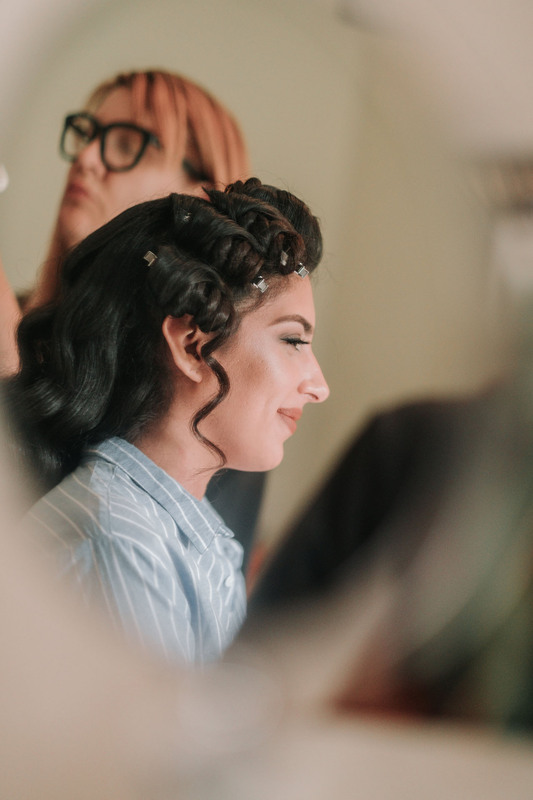 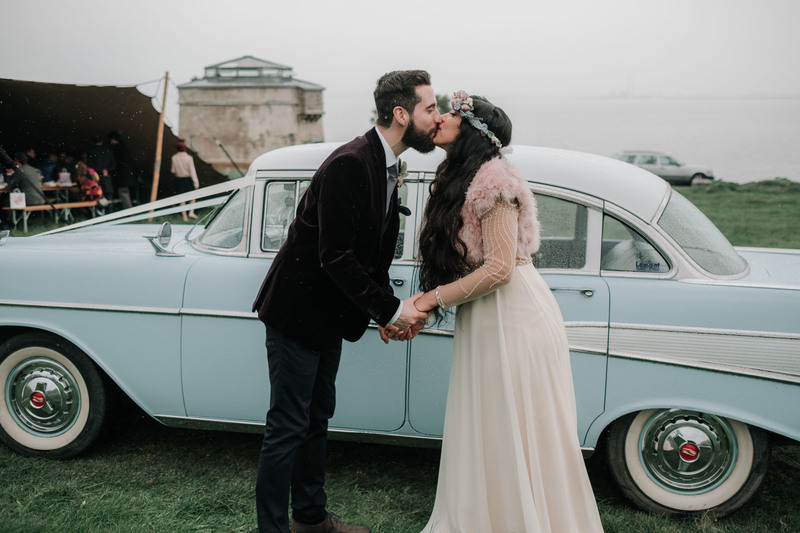 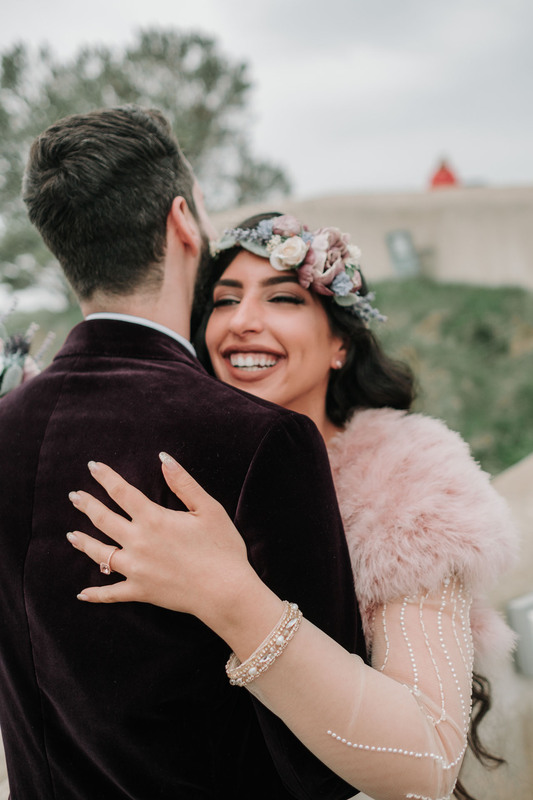 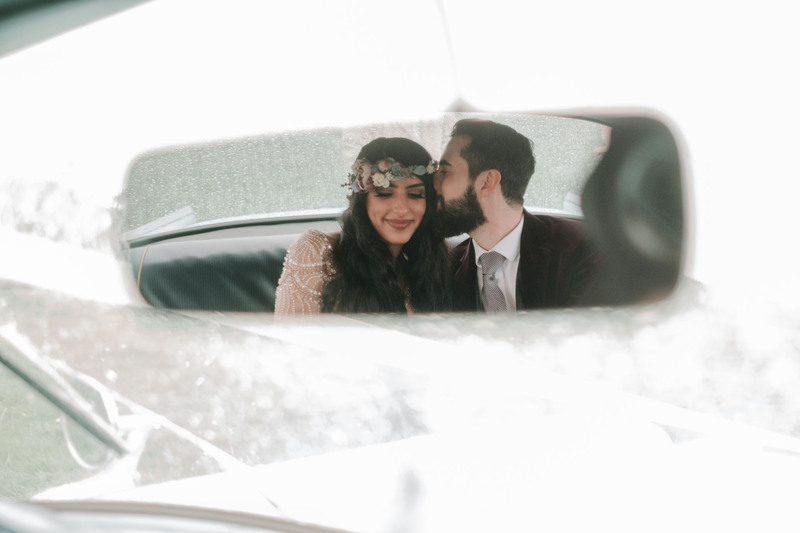 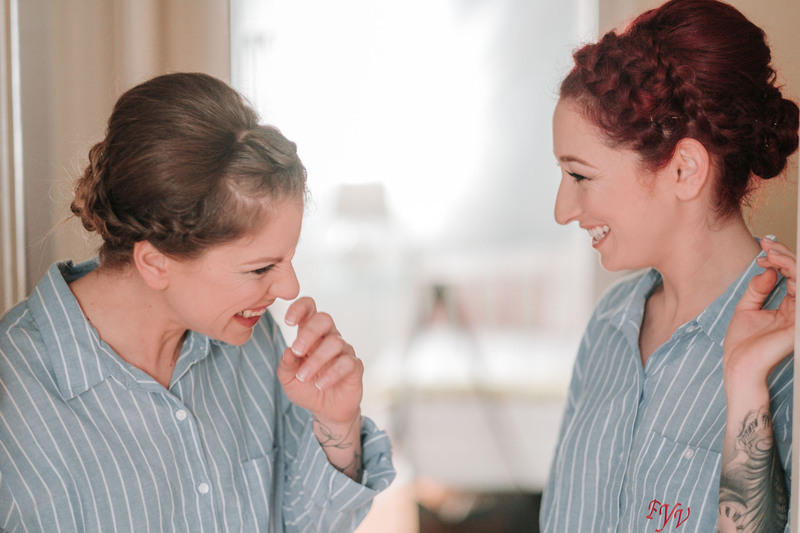 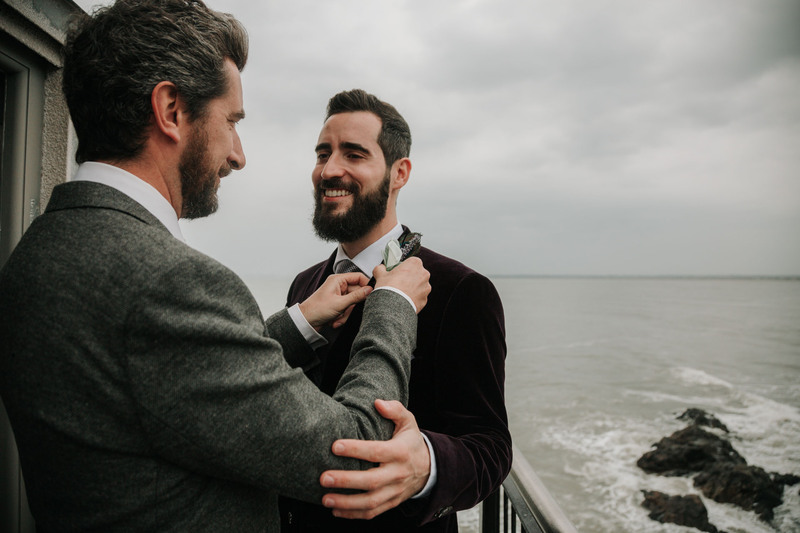 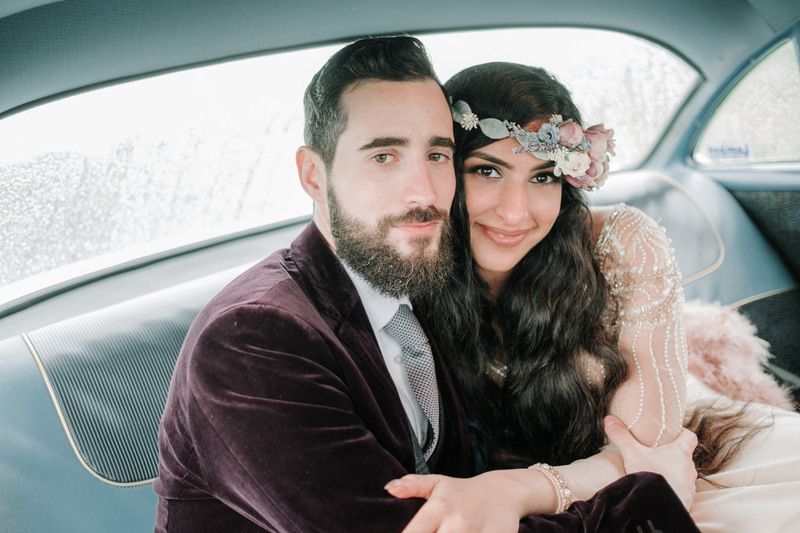 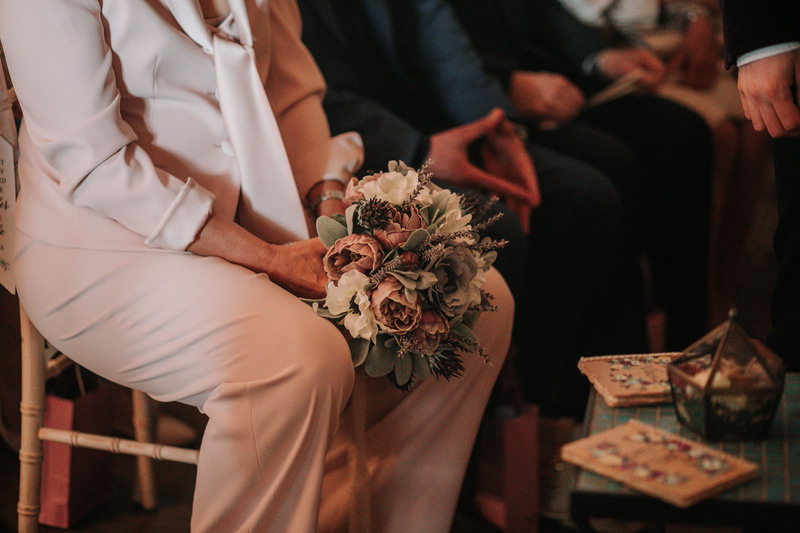 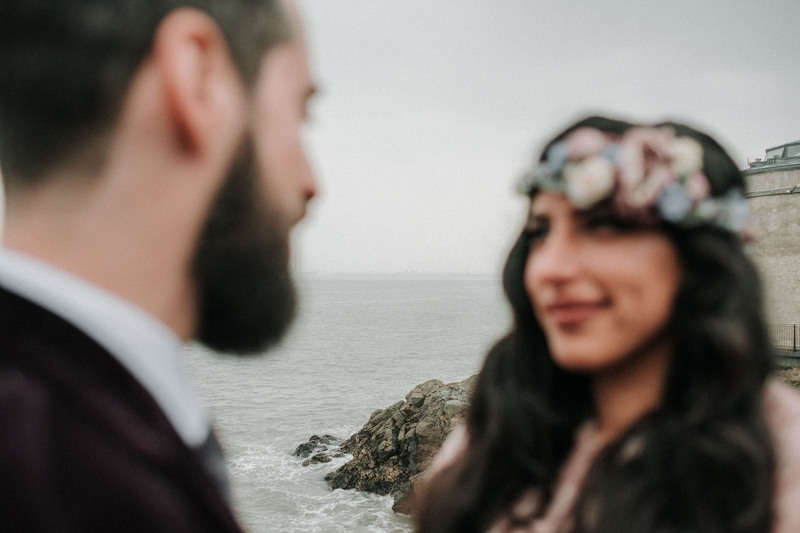 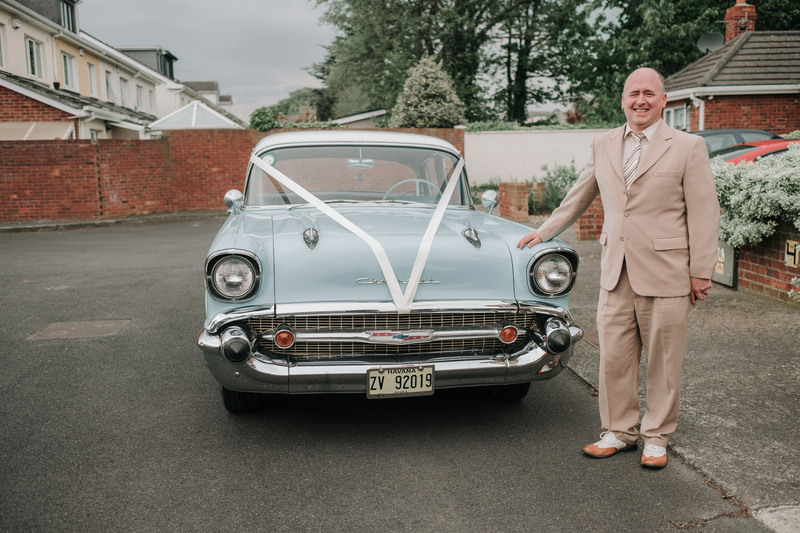 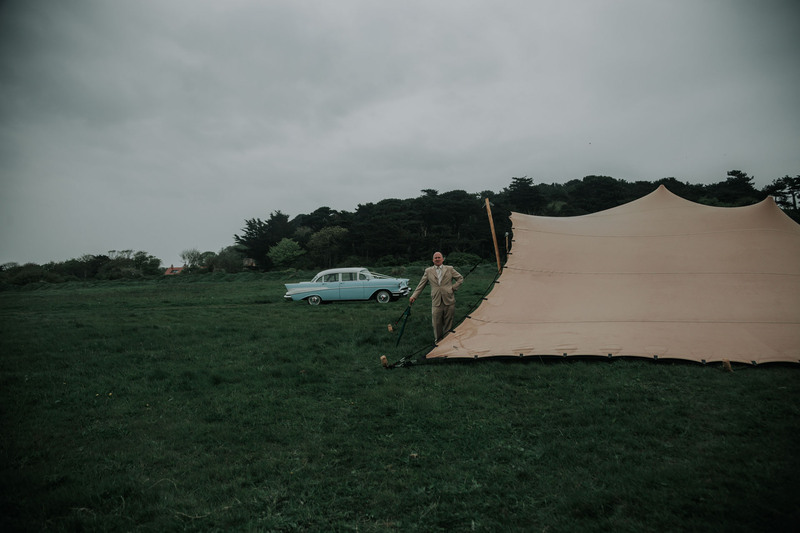 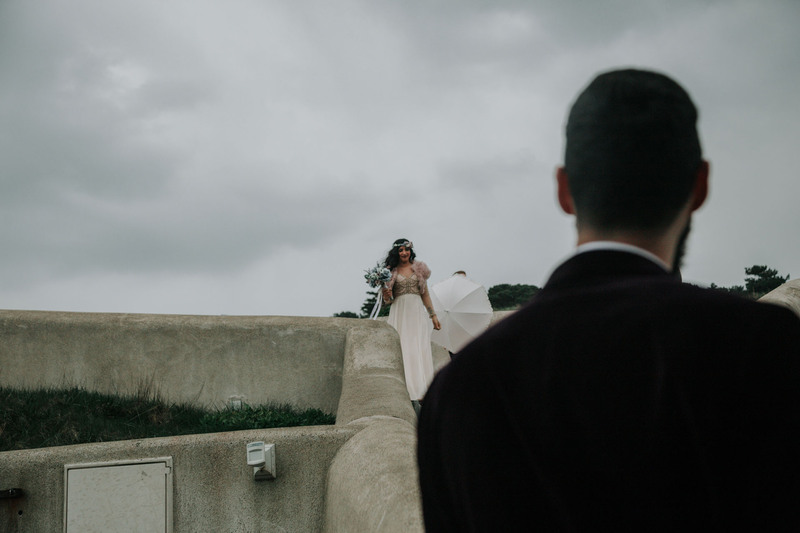 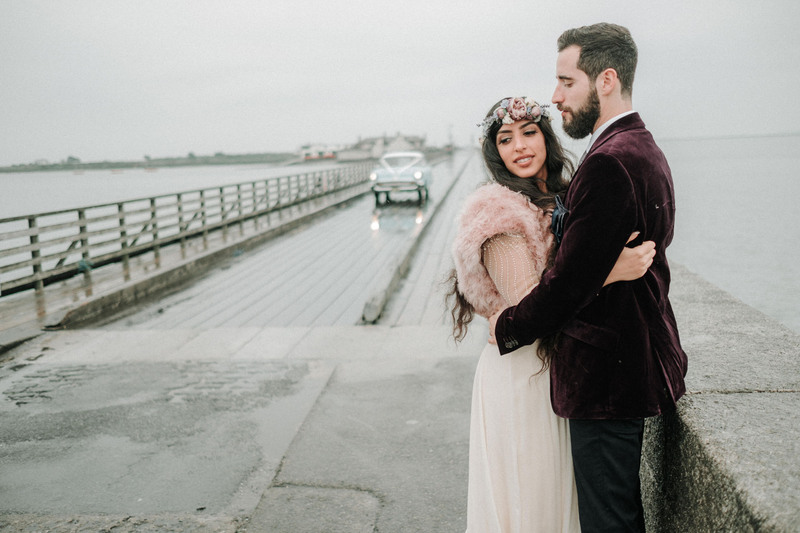 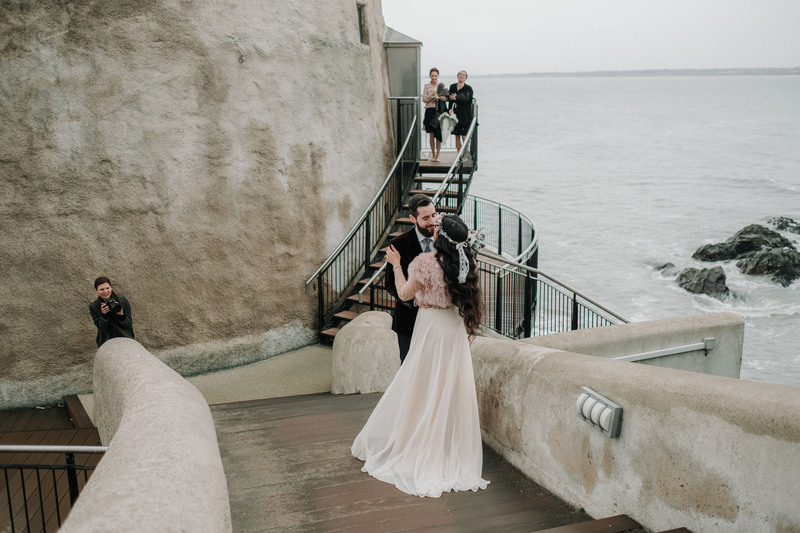 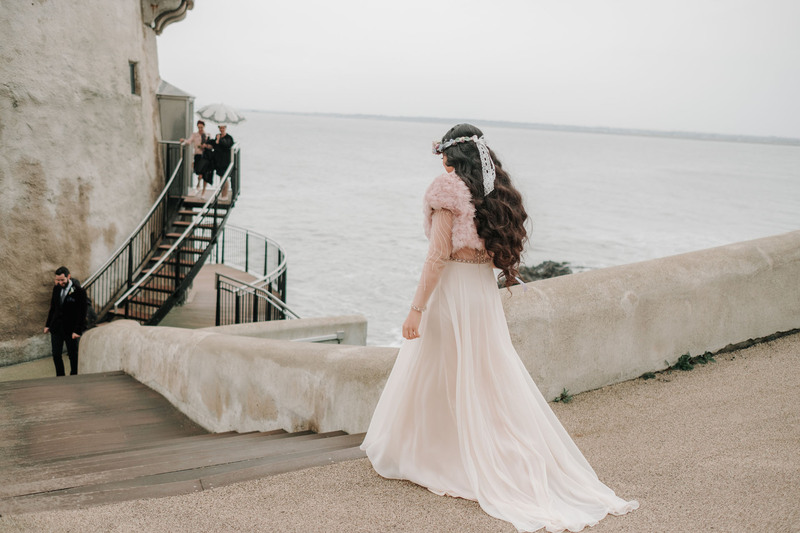 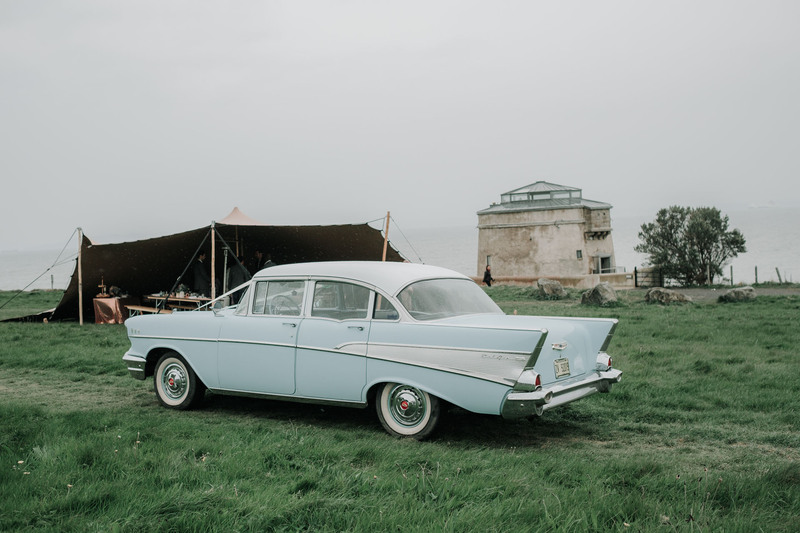 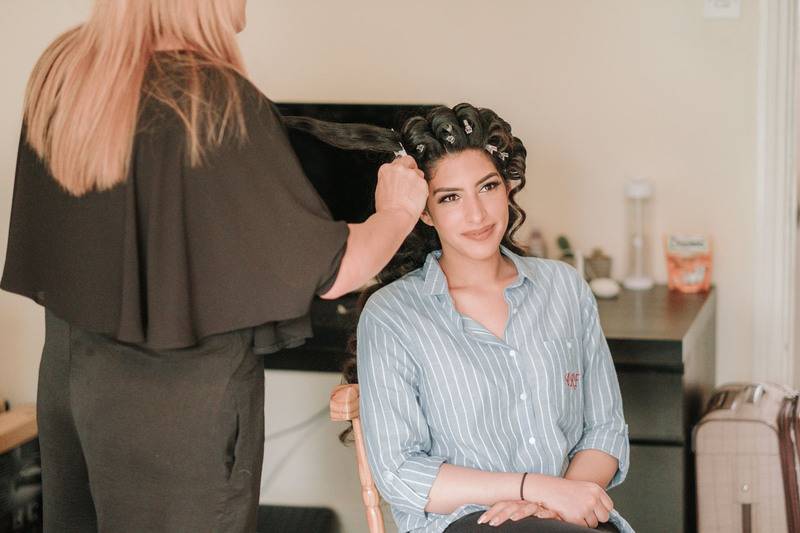 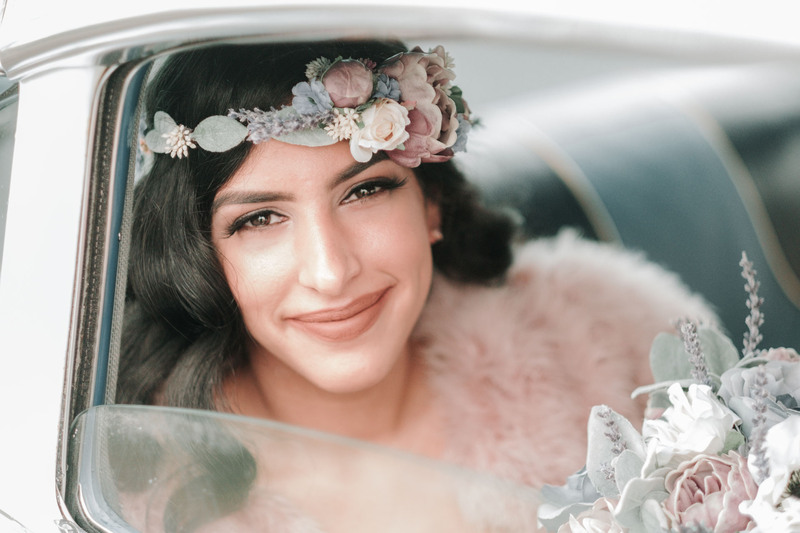 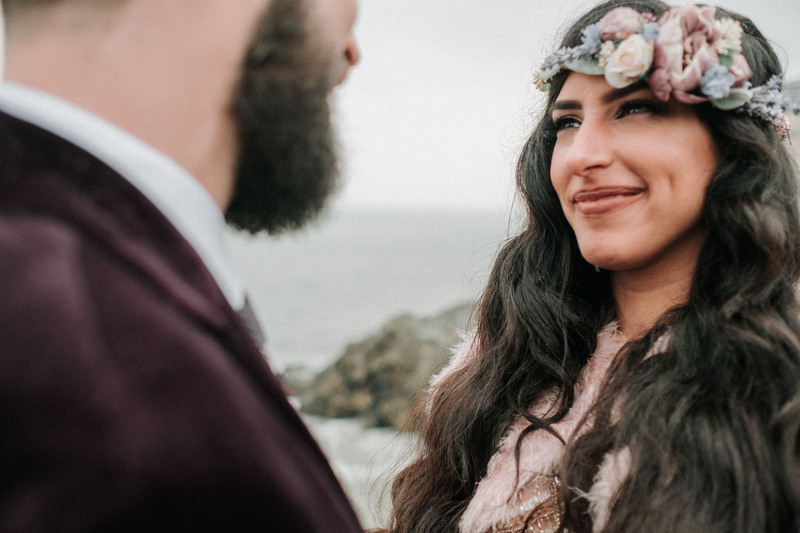 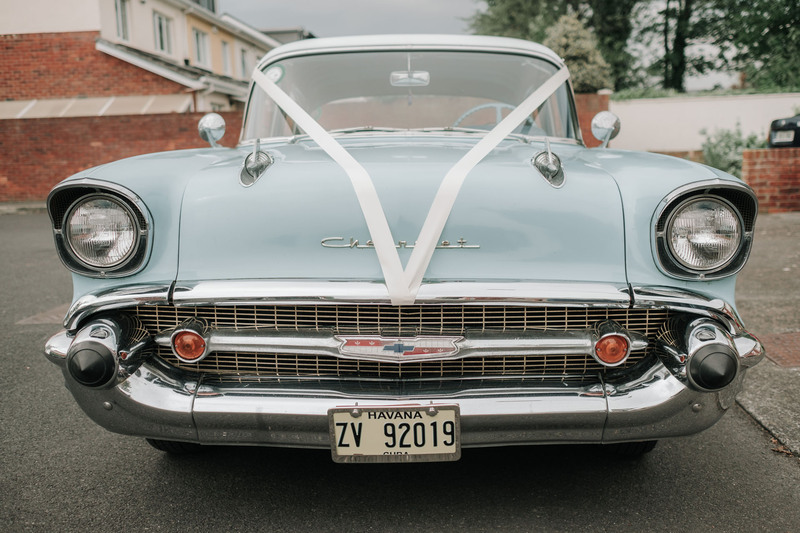 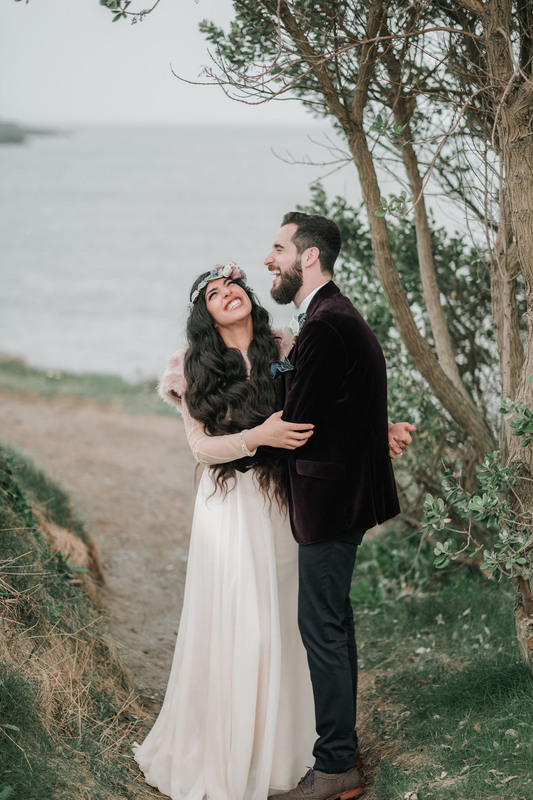 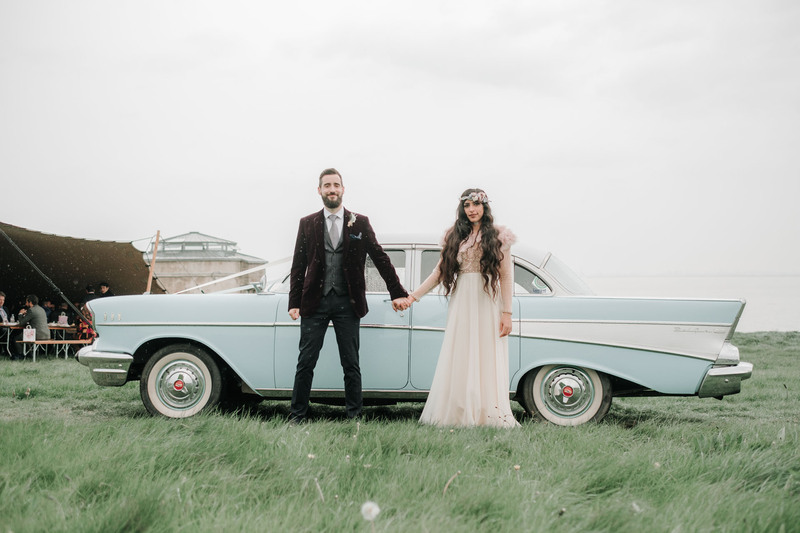 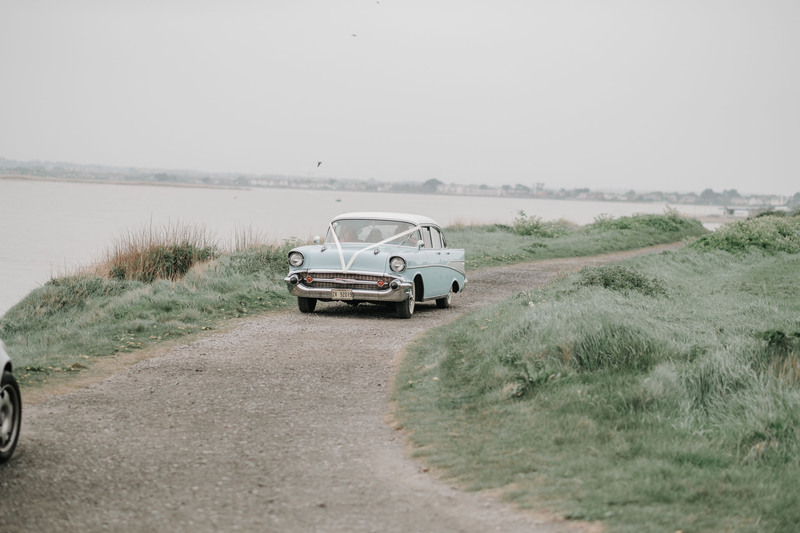 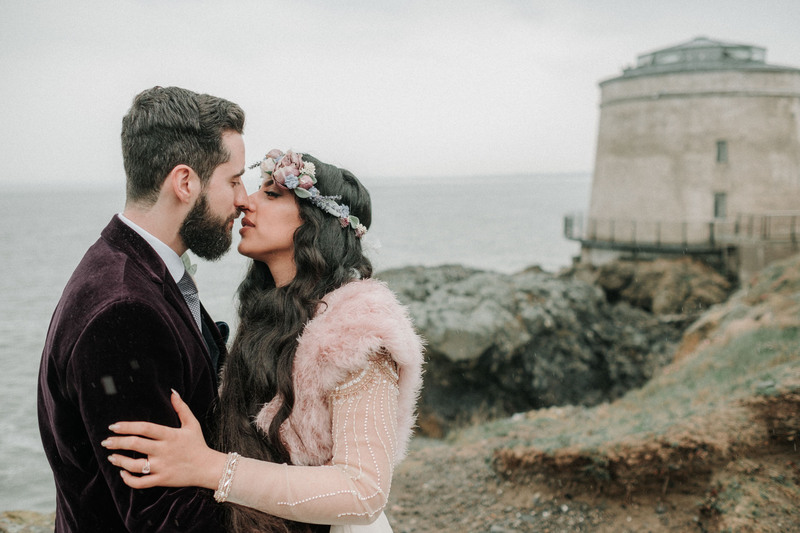 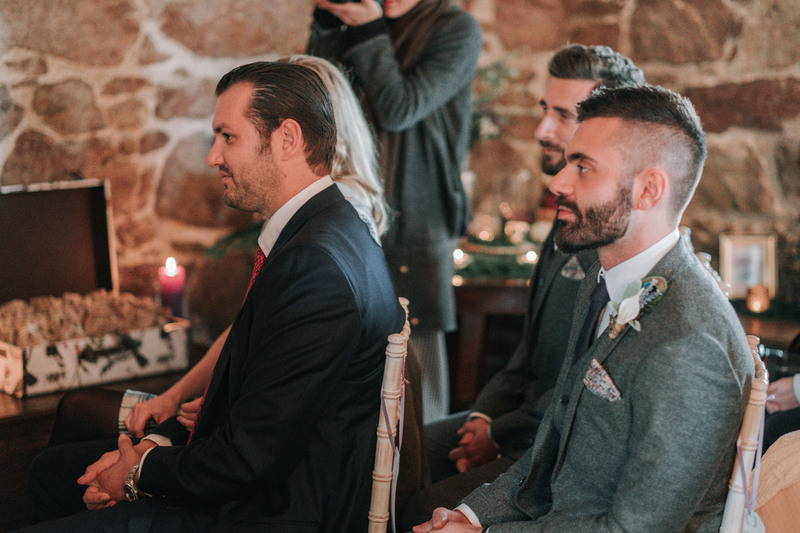 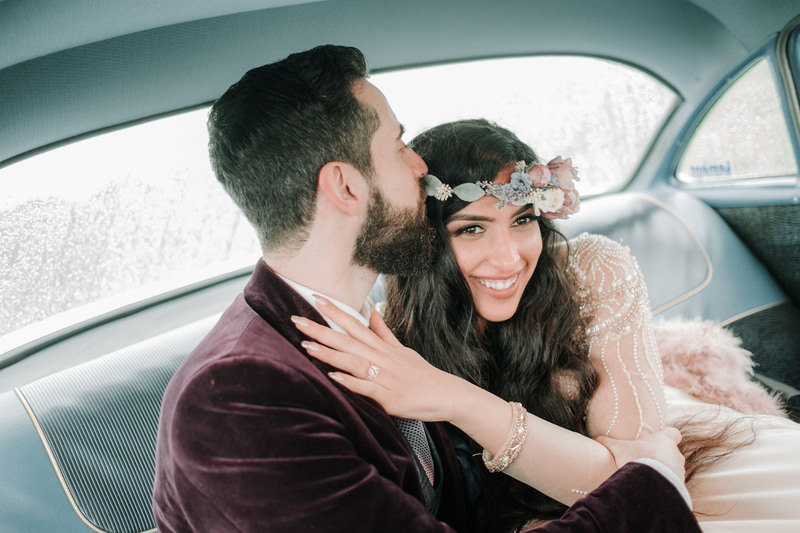 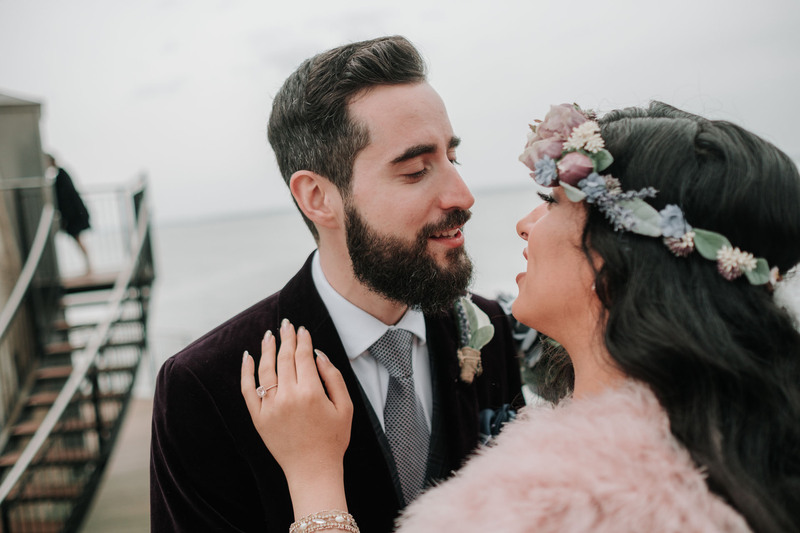 We knew this Martello Tower Howth wedding would be a wedding for the books when a vintage baby blue convertible Cadillac came to pick up Alexandra and her wedding party. 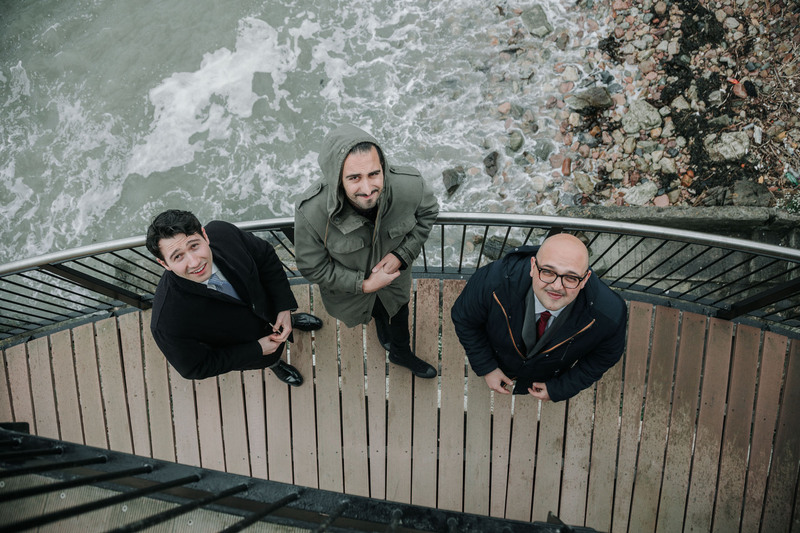 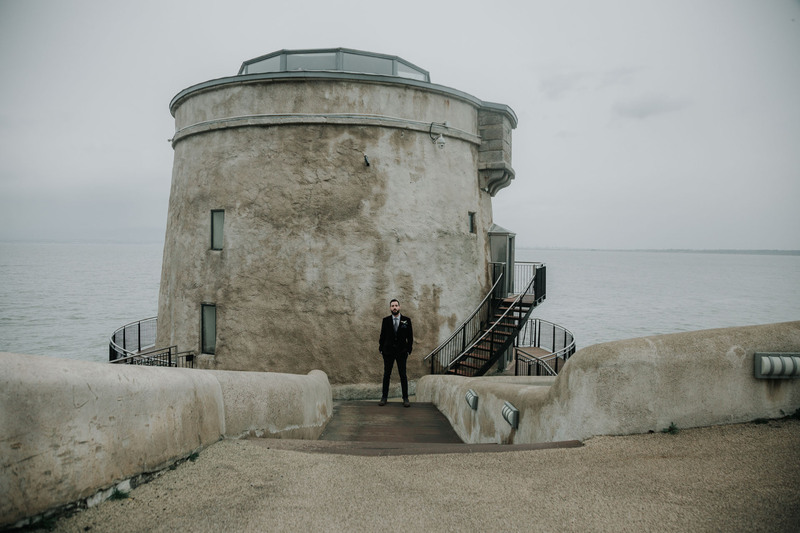 At this point Alessandro was already waiting at the Martello Tower. 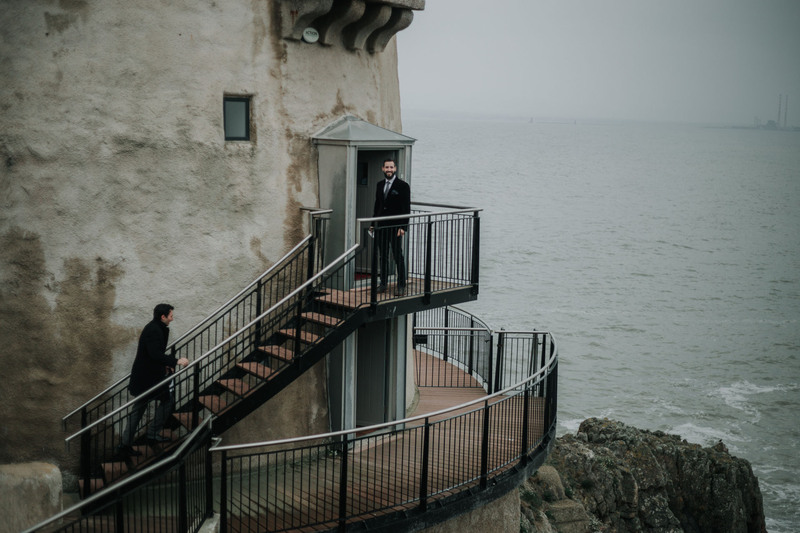 Yes, a tower. 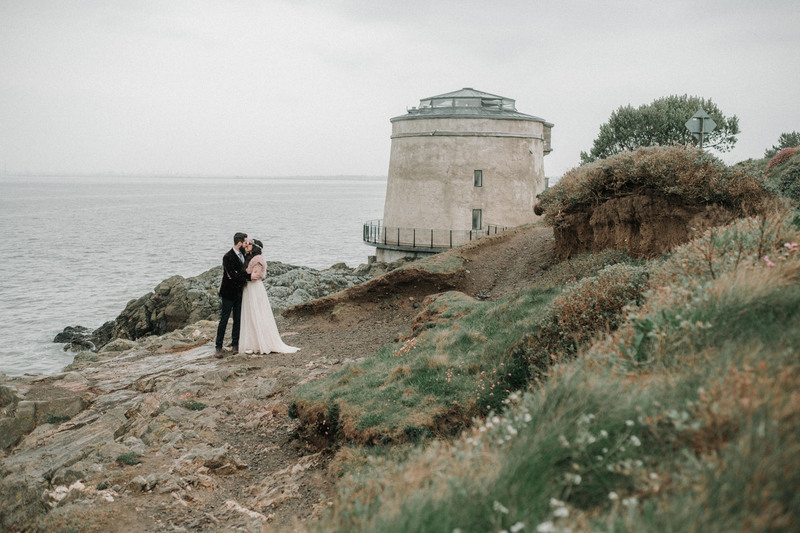 Perched along the wild Irish Coast line along Dublin’s North side, and surrounded by the excitable sea which was crashing around the towers base. 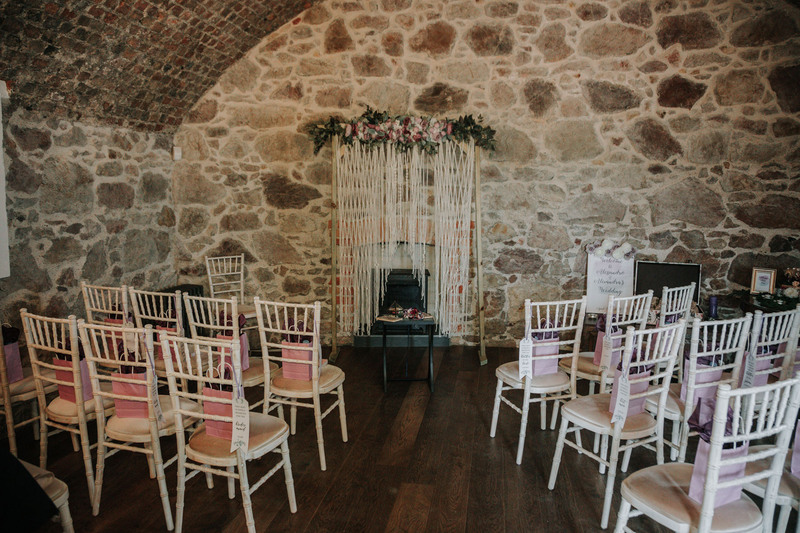 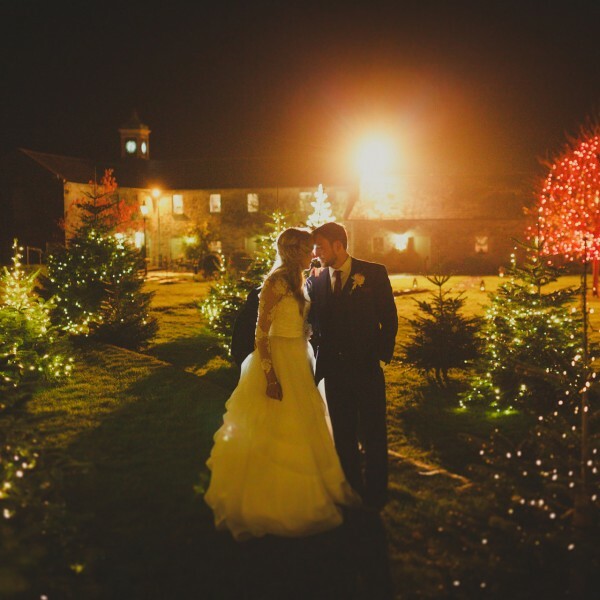 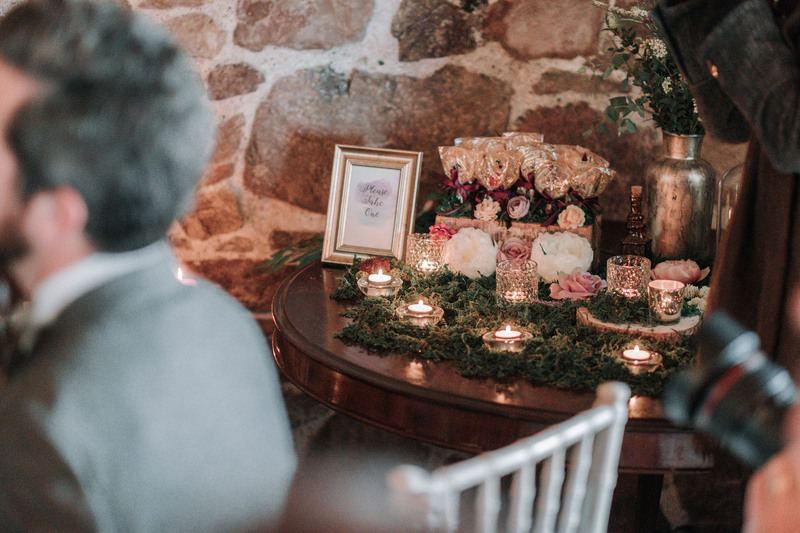 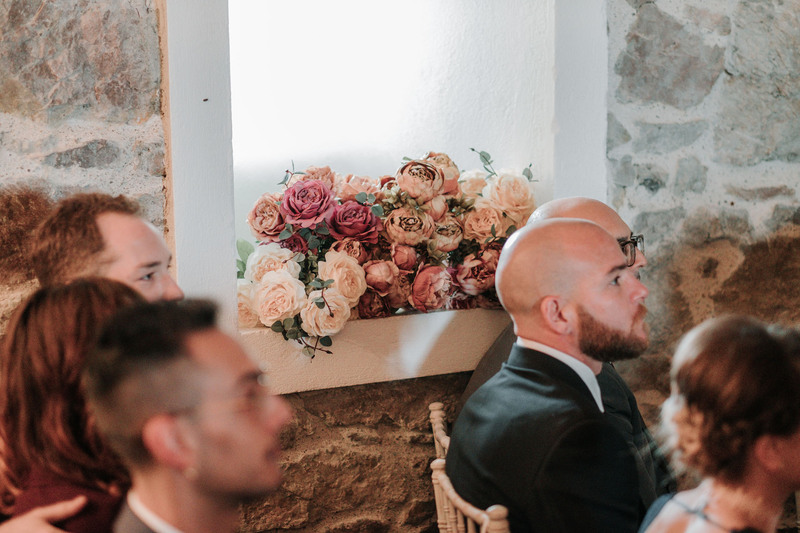 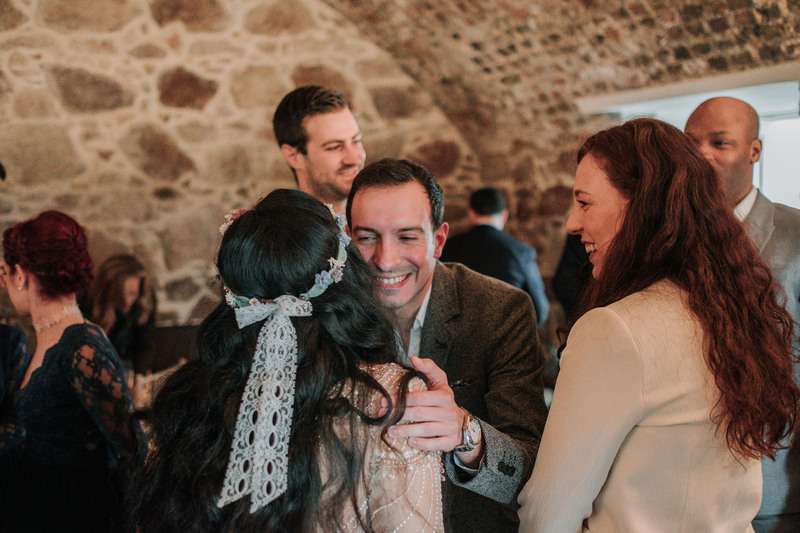 Inside the stone built, early 18th century tower, the groom waited patiently, greeting arriving guests and taking care of his own final preparations. 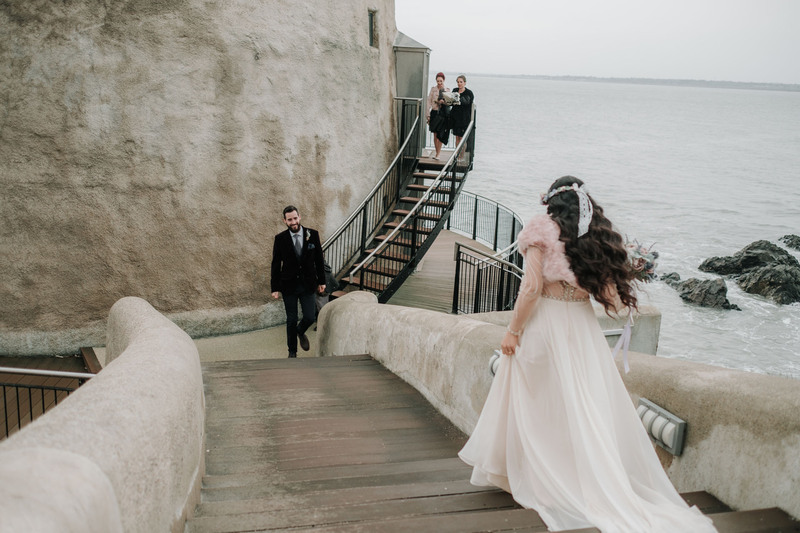 The couple decided on a very intimate and private first look, outside the tower along its steps. 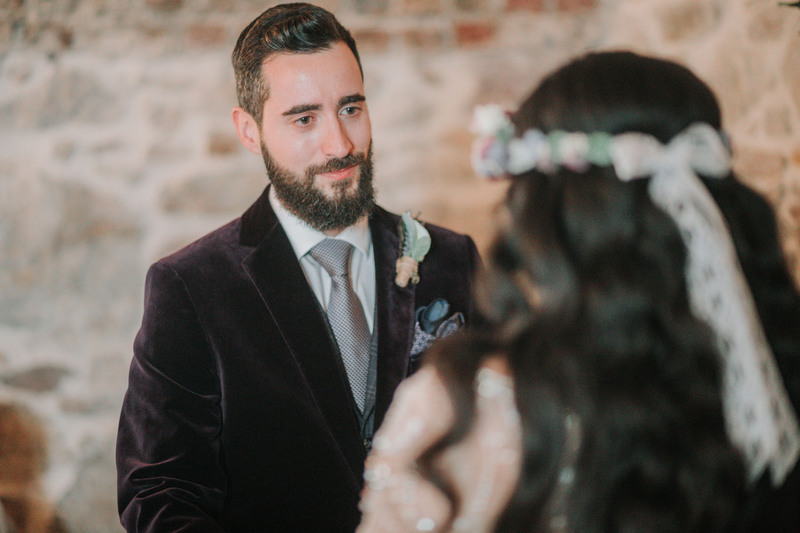 There, Alessandro saw his bride for the first time. 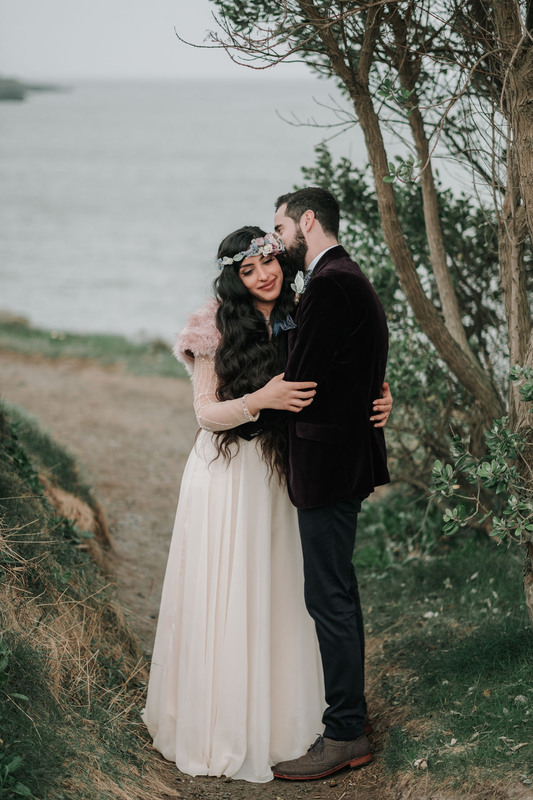 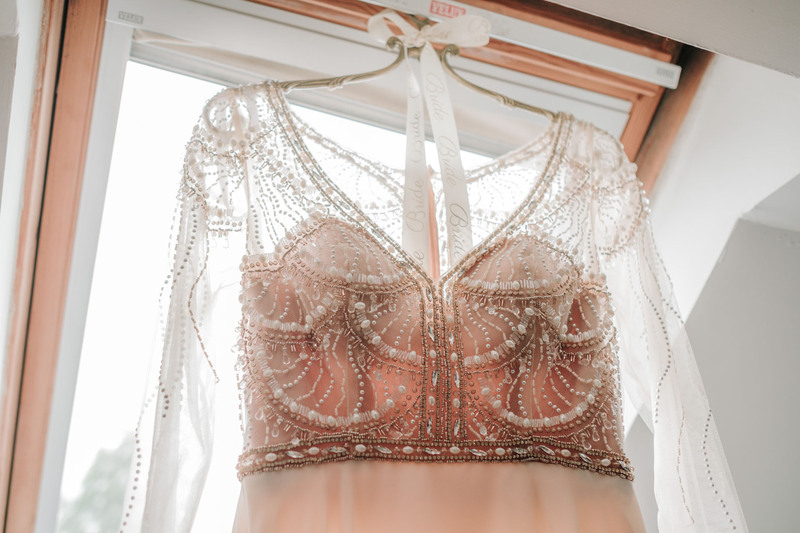 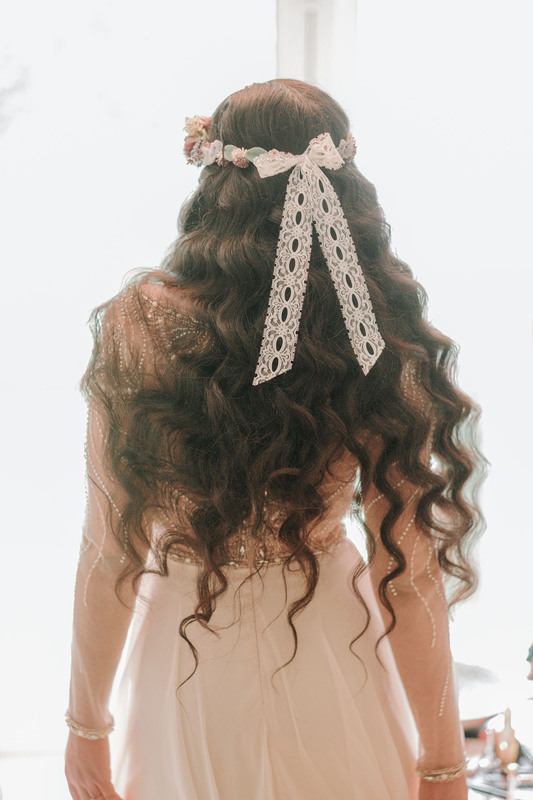 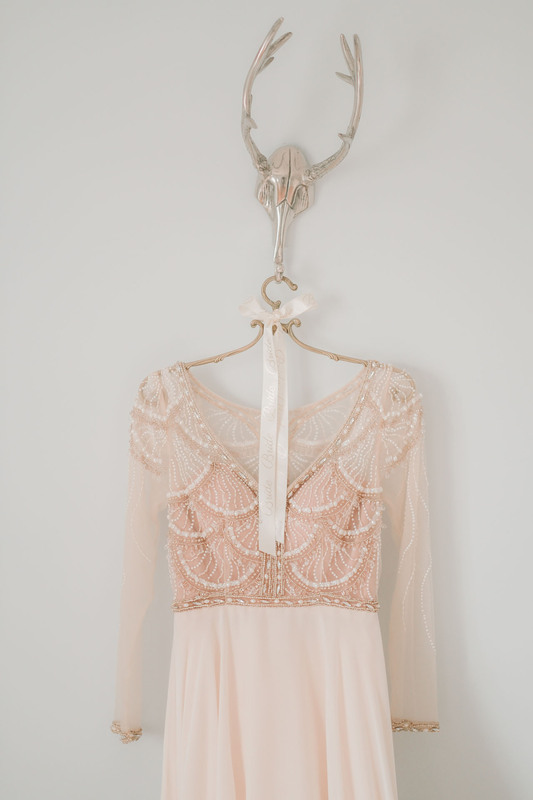 She wore a flowing chiffon cream dress with stunning detailed beading and a vintage faux fur throw around her shoulders. 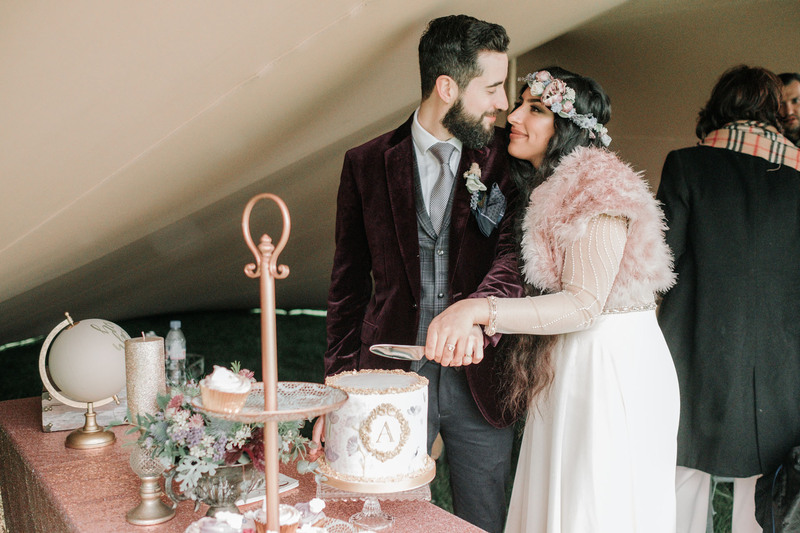 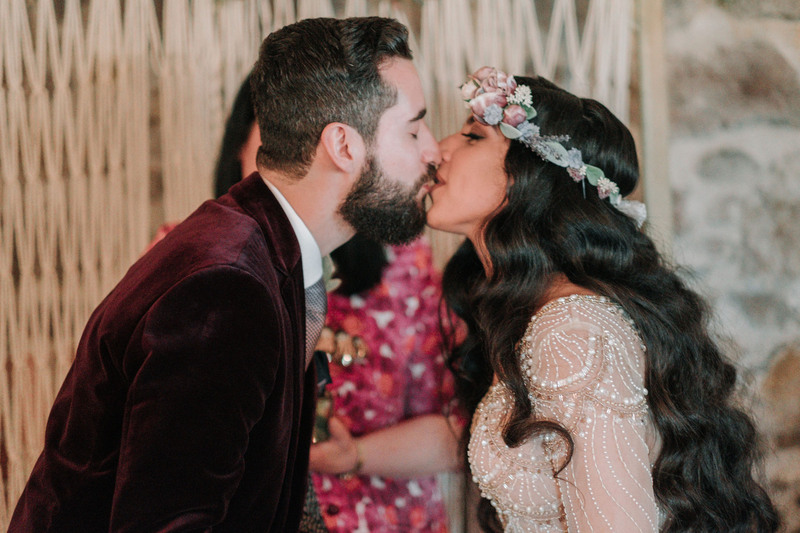 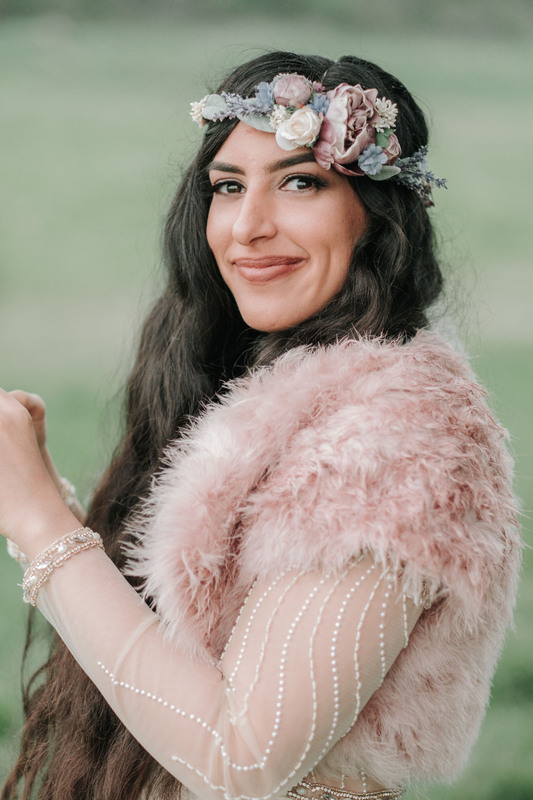 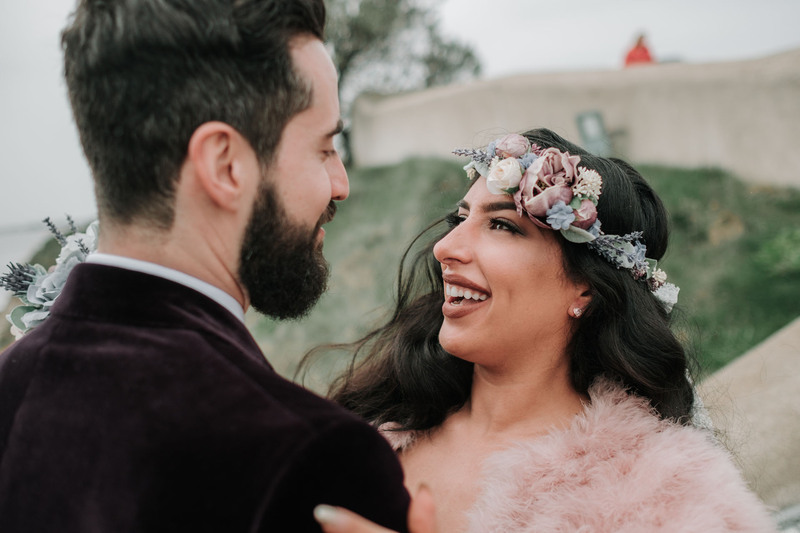 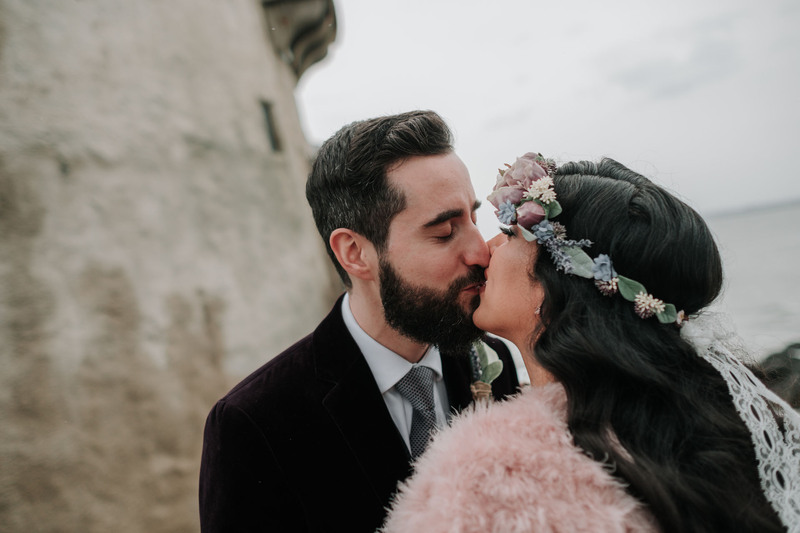 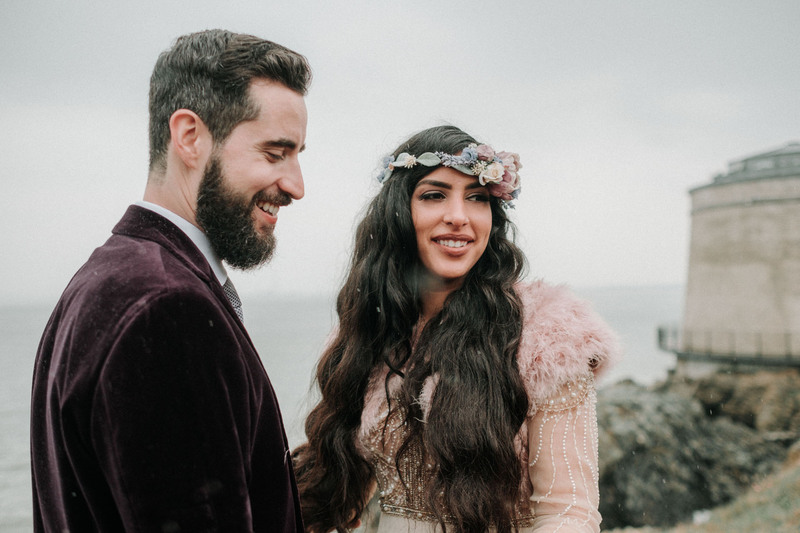 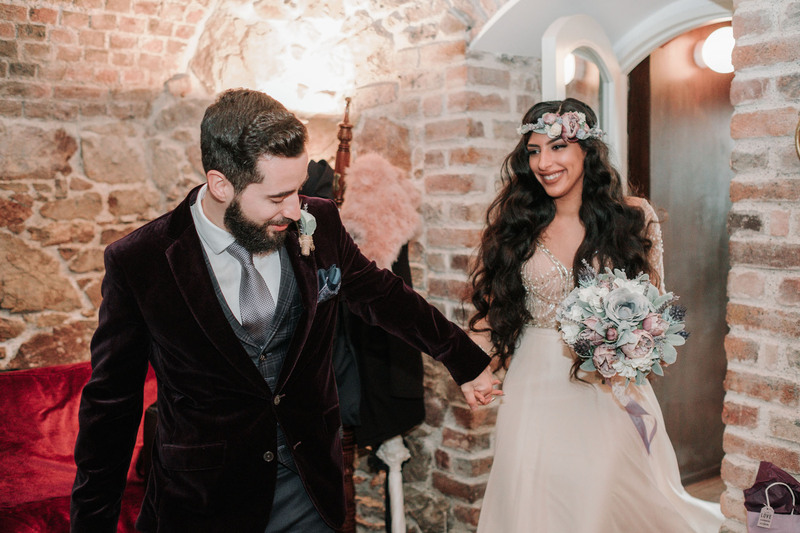 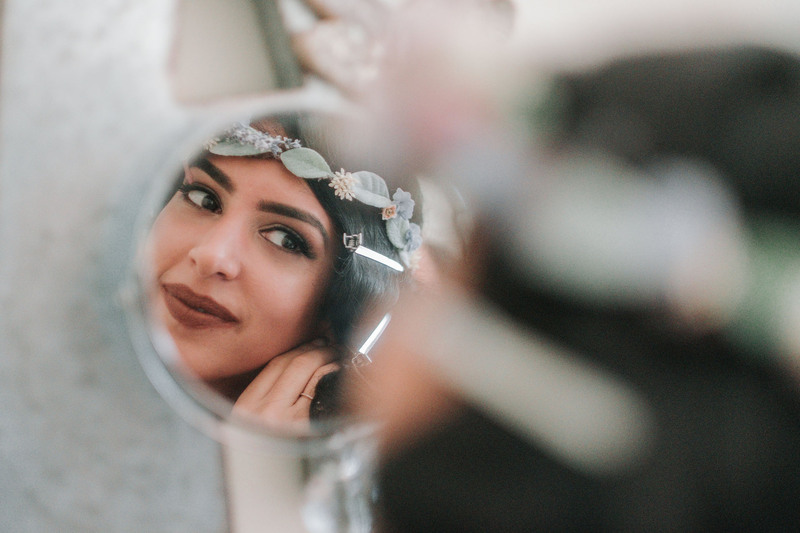 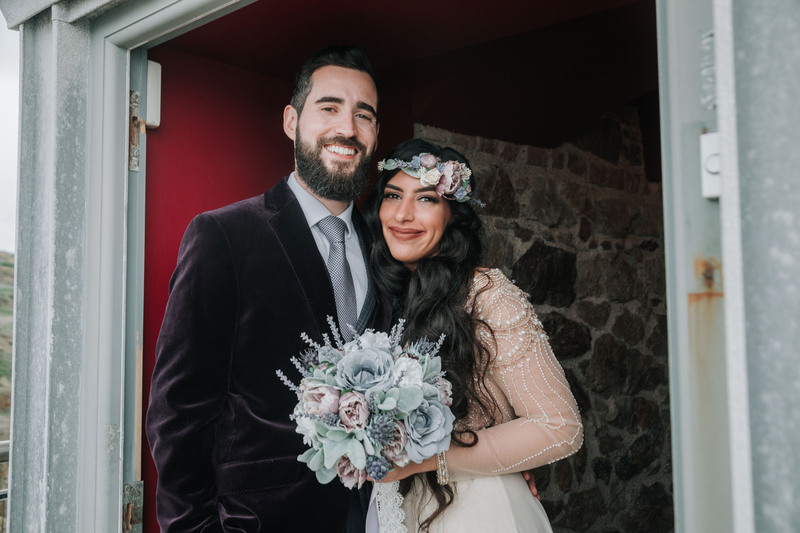 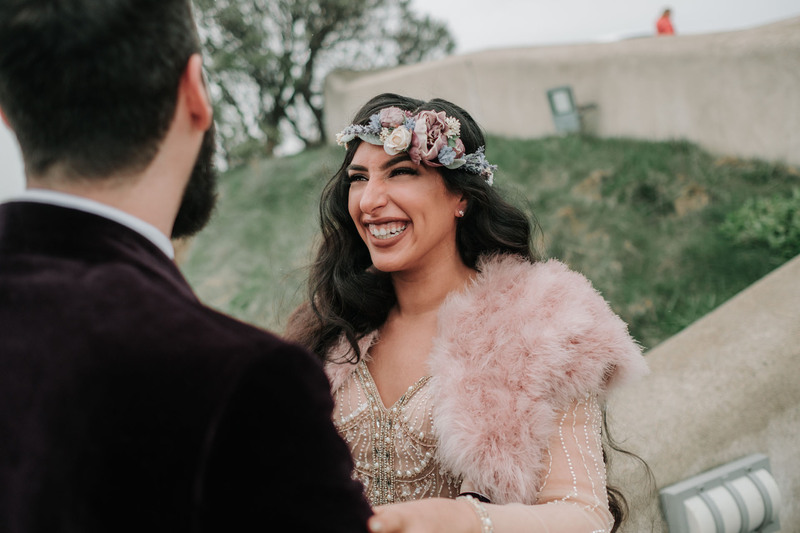 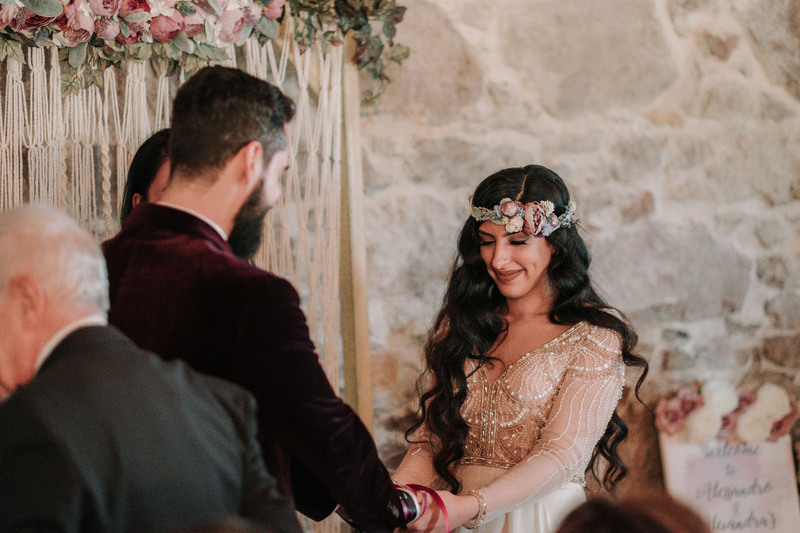 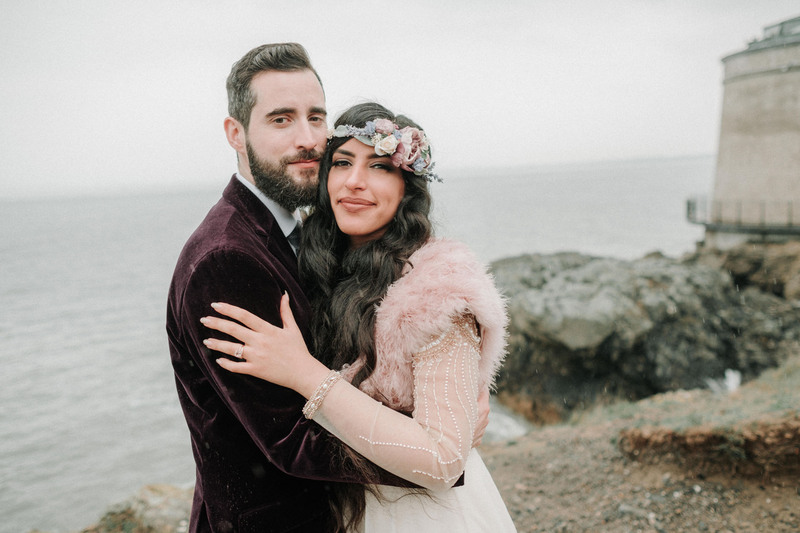 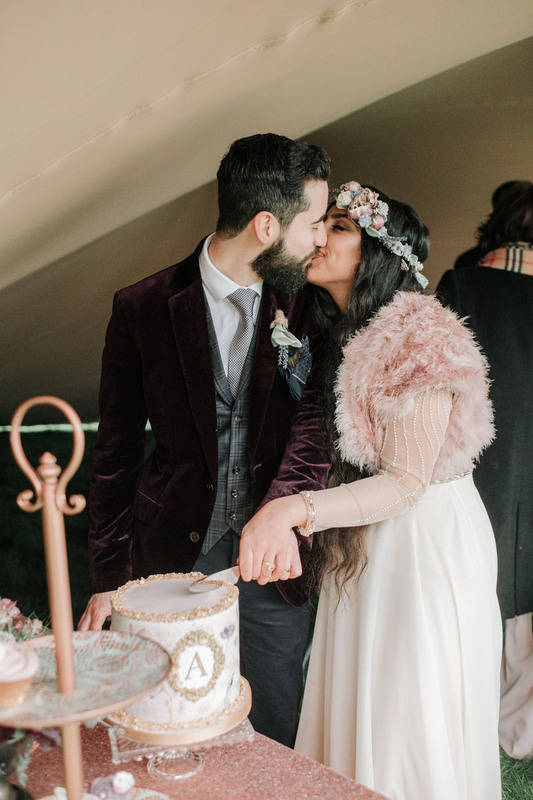 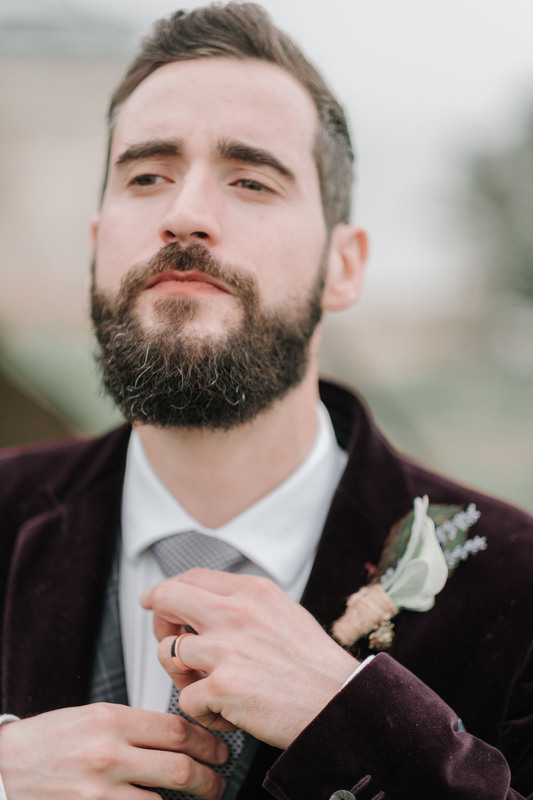 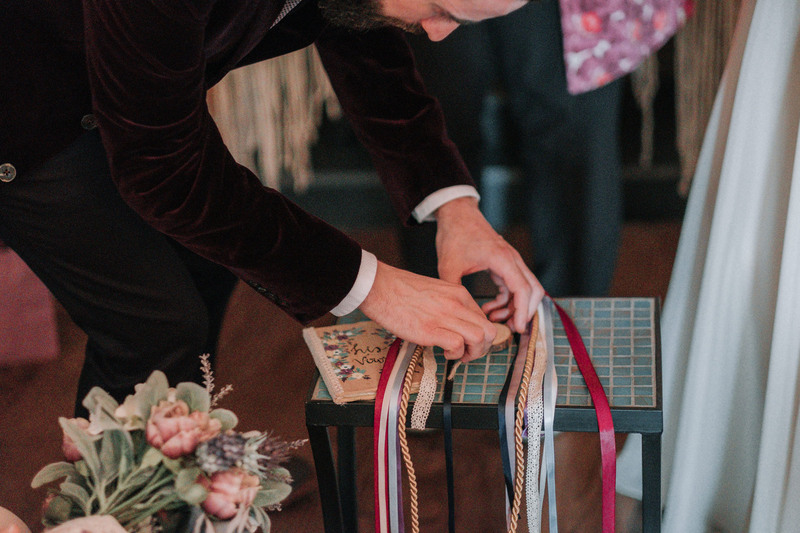 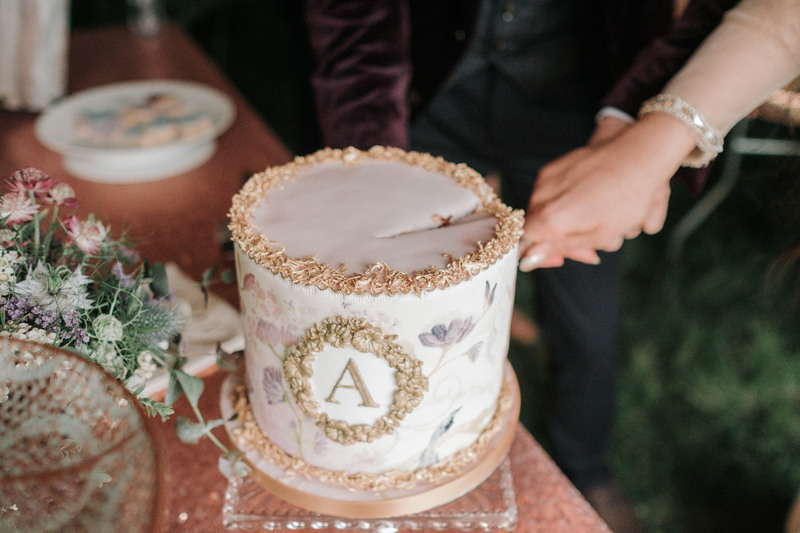 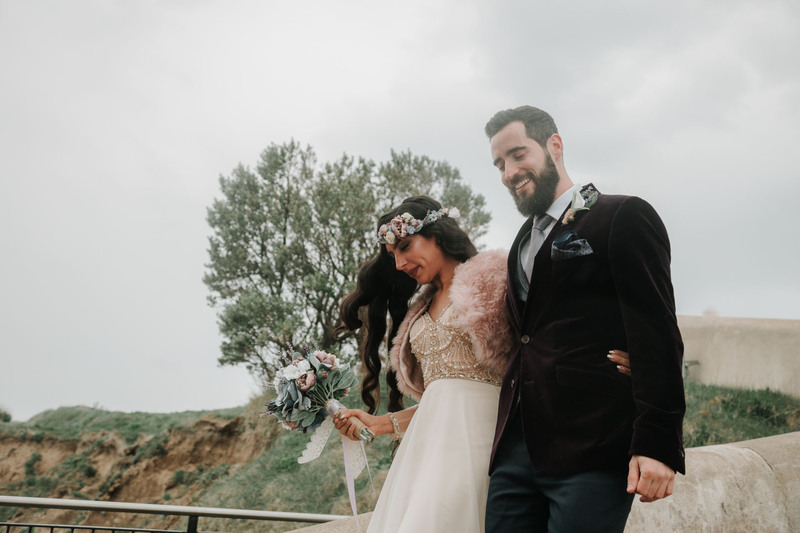 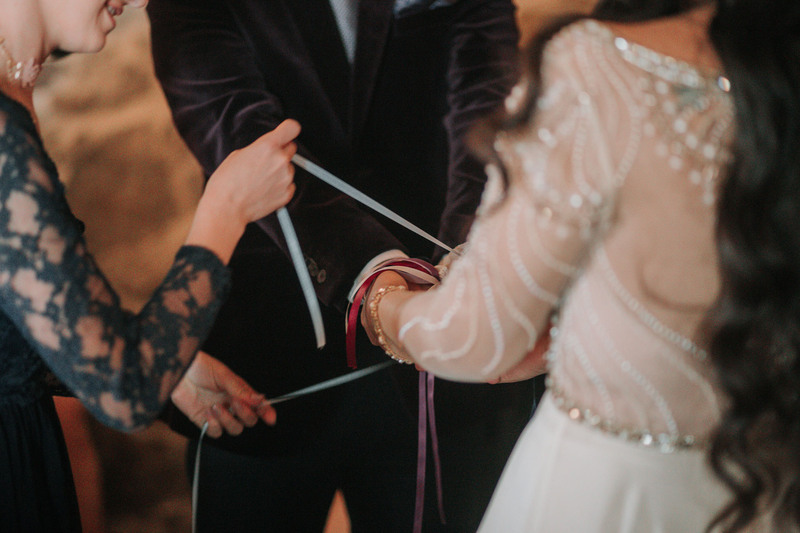 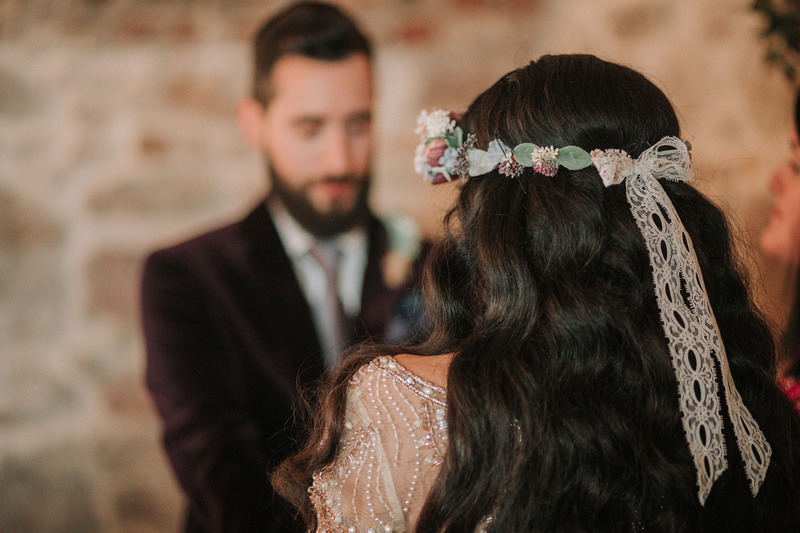 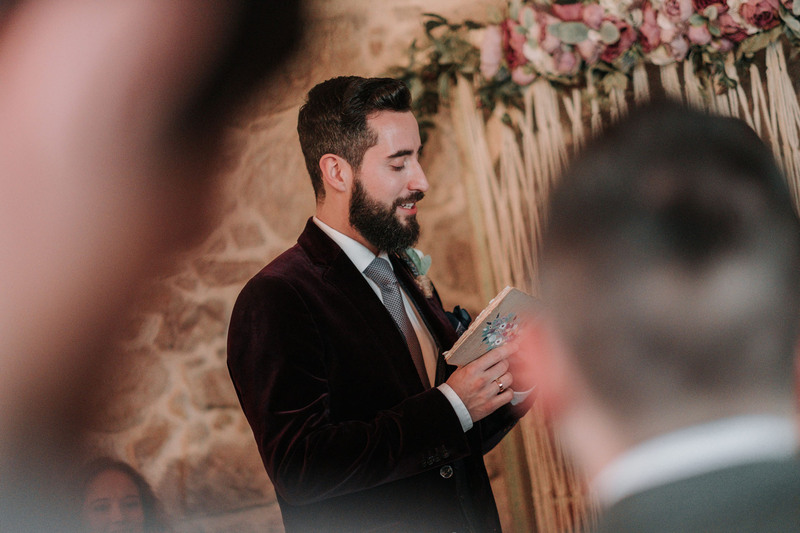 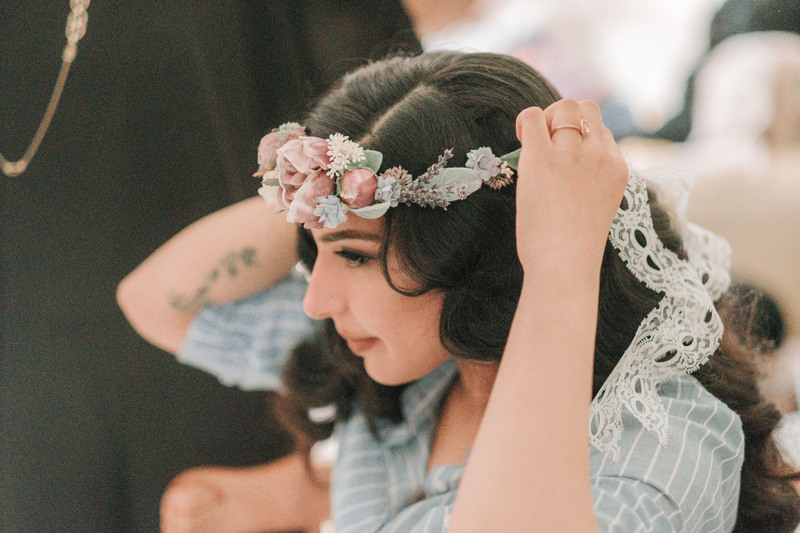 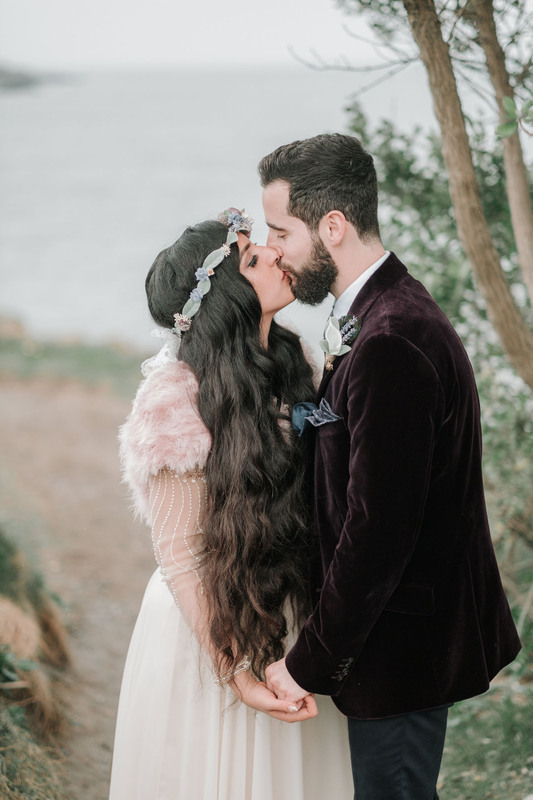 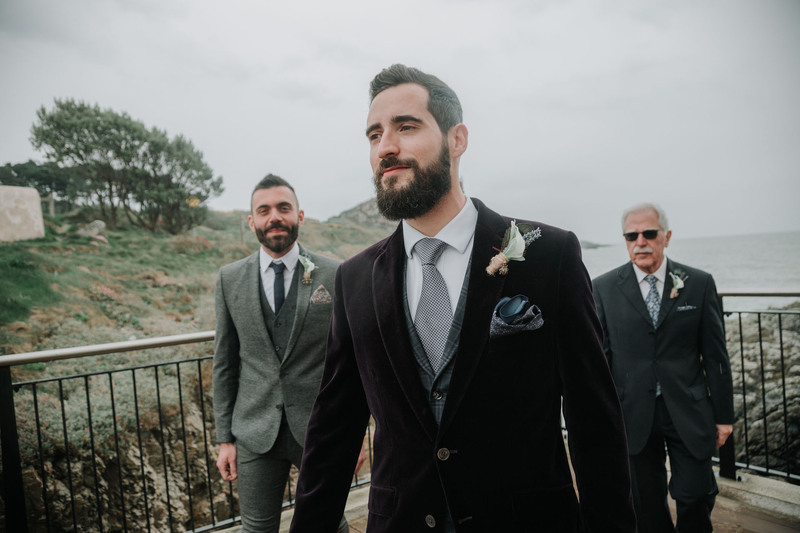 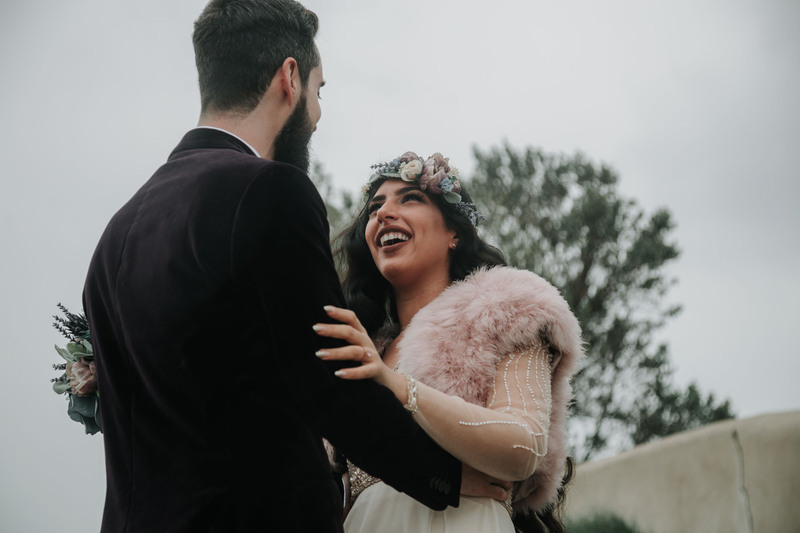 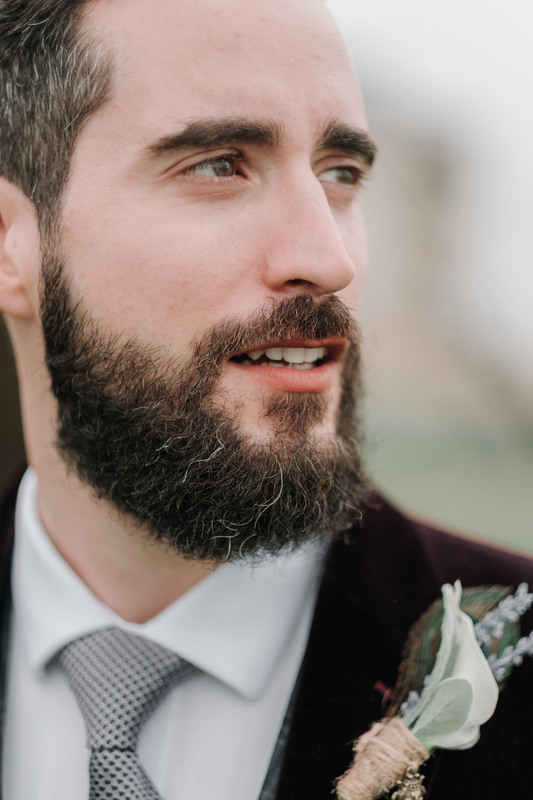 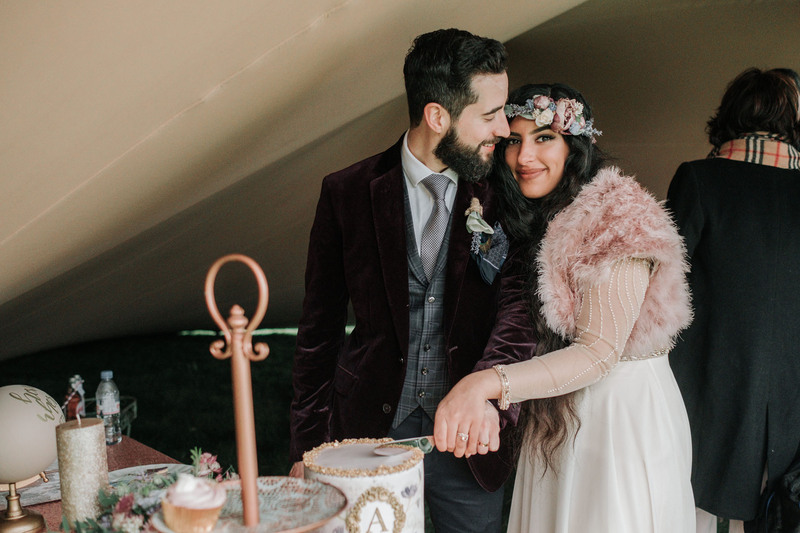 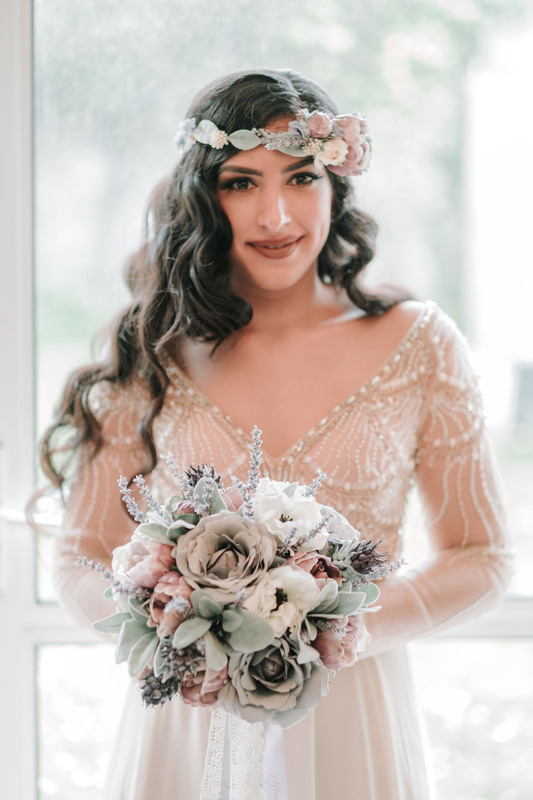 The theme for the first half of the couples wedding was purple, which we saw in a flower crown that Alexandra had on her head and Alessandro’s deep purple velvet coat. 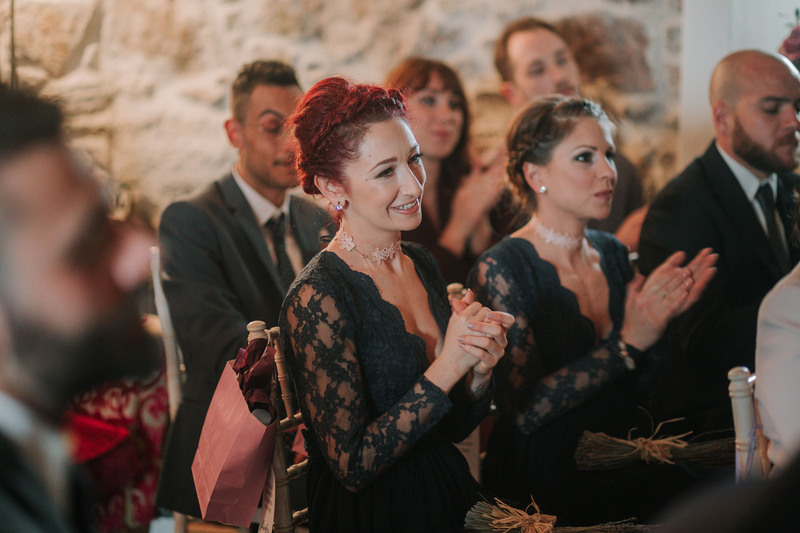 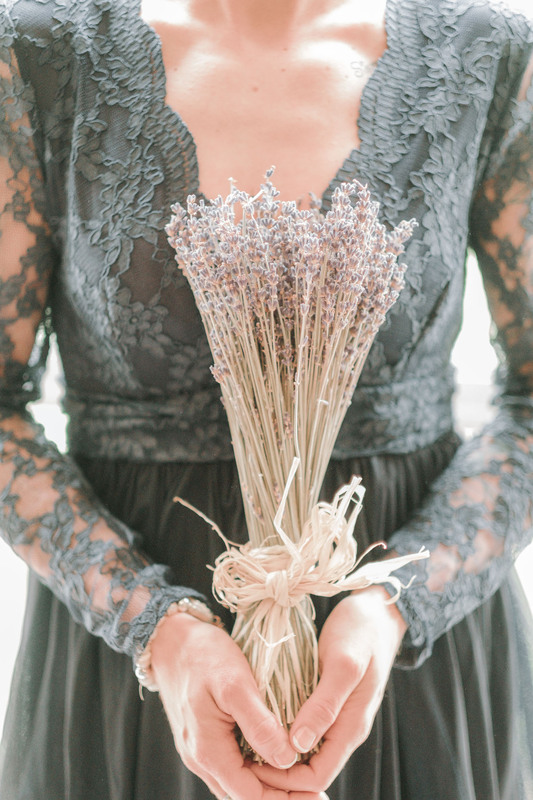 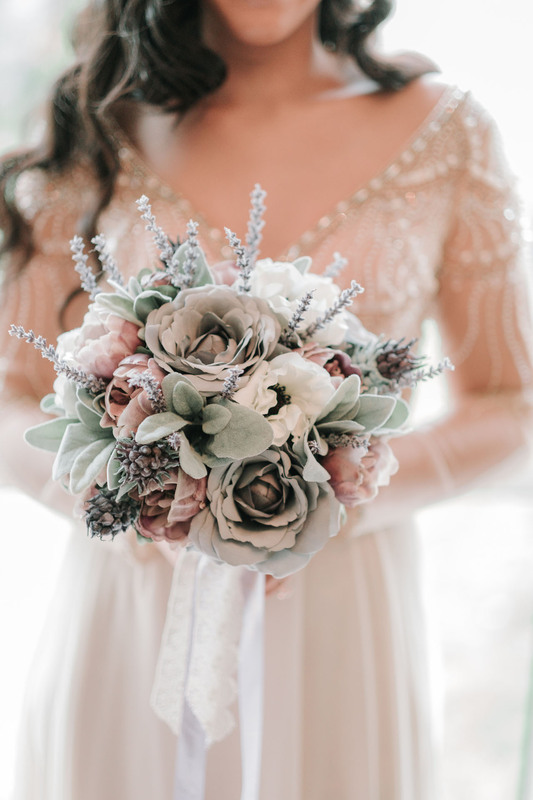 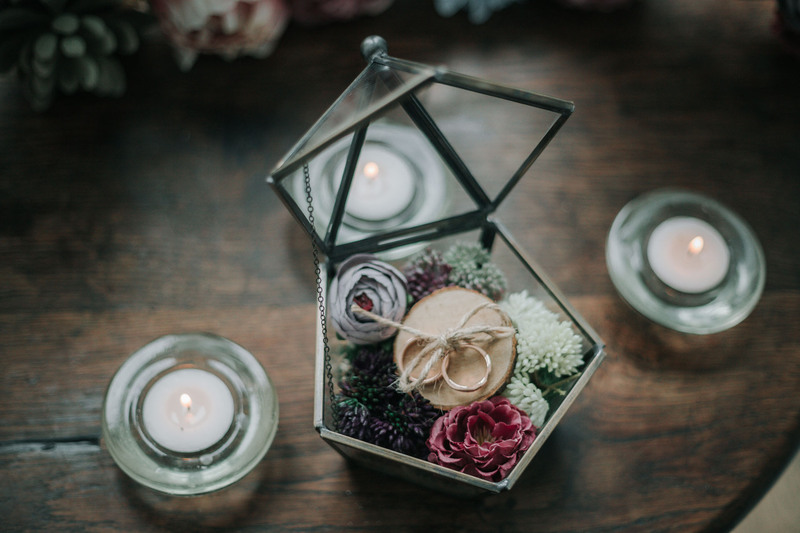 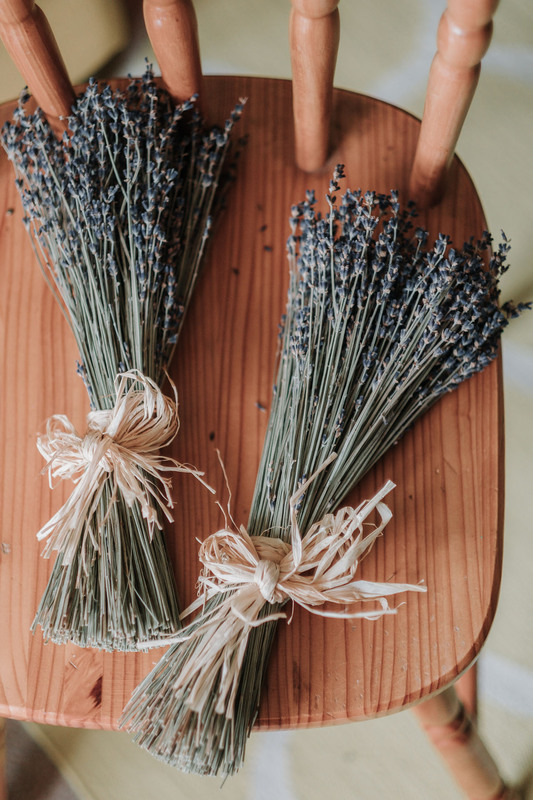 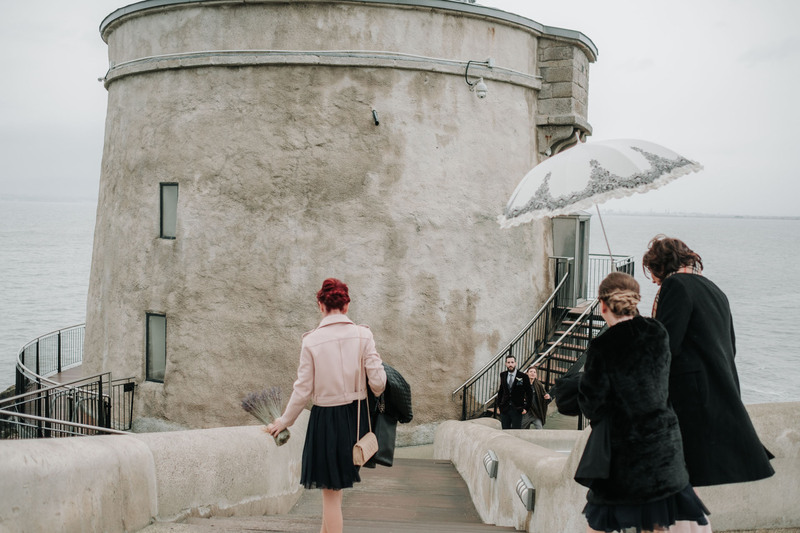 To begin the ceremony, the couple decided to enter the tower together, hand in hand, once their bridesmaids, who wore green laces dresses and carried bouquets of fresh lavender, made their entrance. 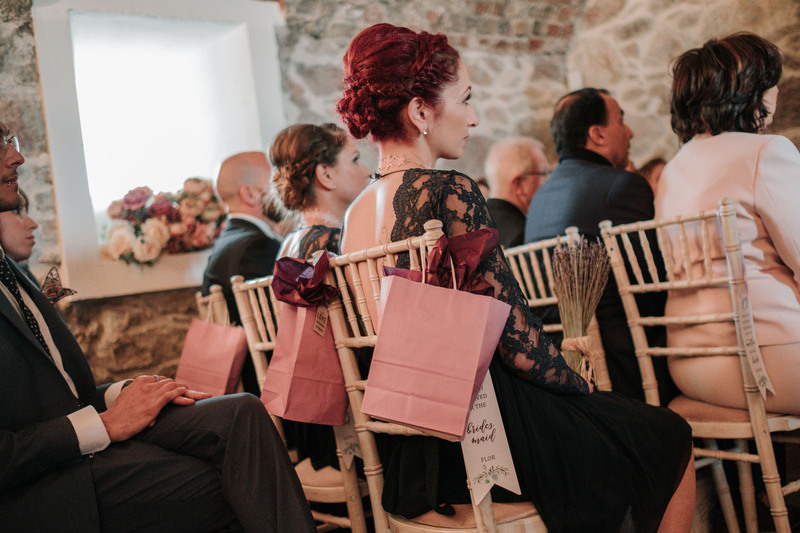 It was an intimate service with no more than 50 guests. 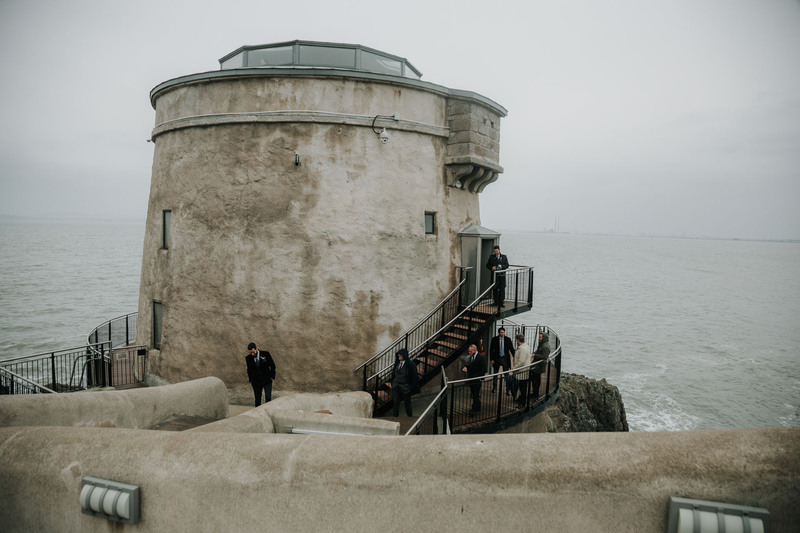 Inside the Martello tower each guest collected a goodie bag from their seats, while a harpist was playing music. 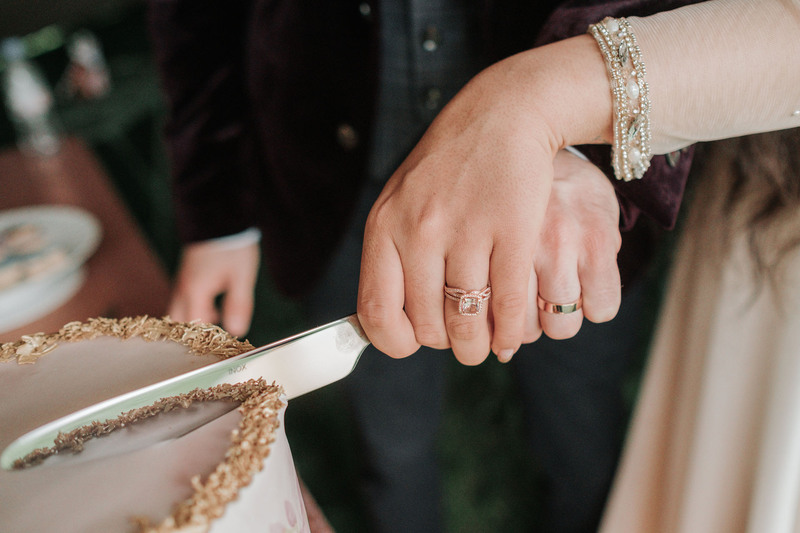 At the top of the aisle, the couple’s wedding bands sat tied to a piece of wood, beautifully waiting in a glass box. 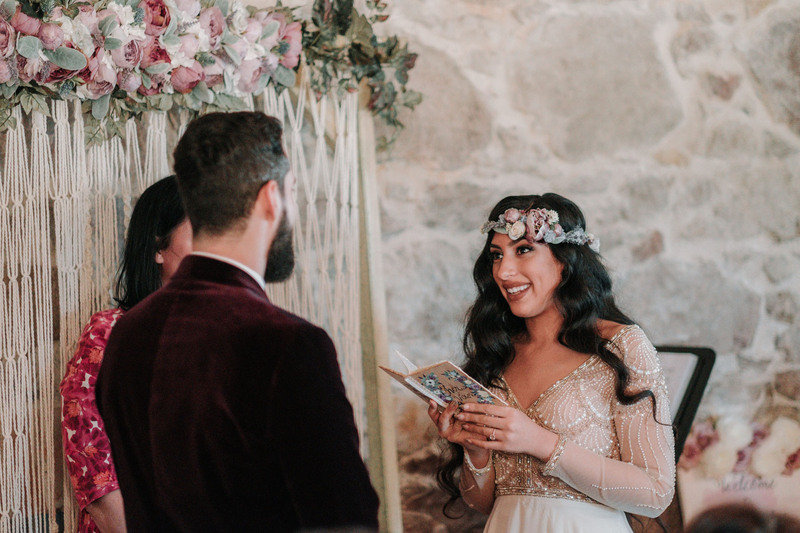 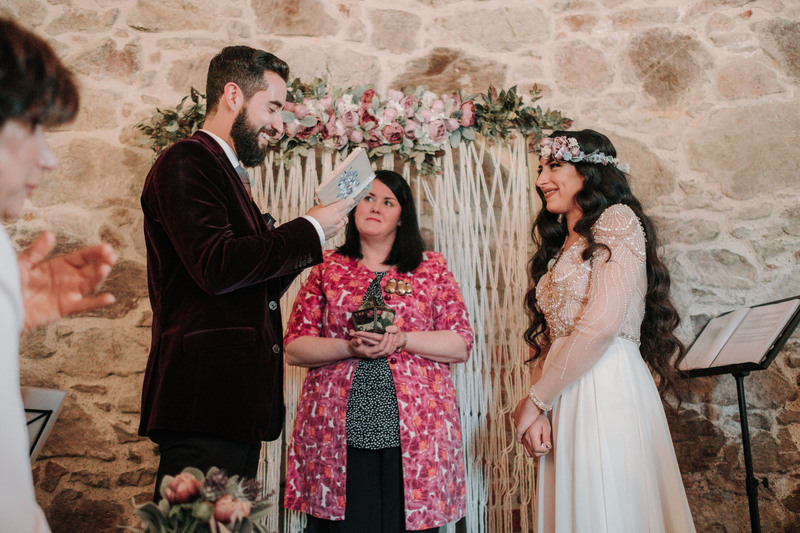 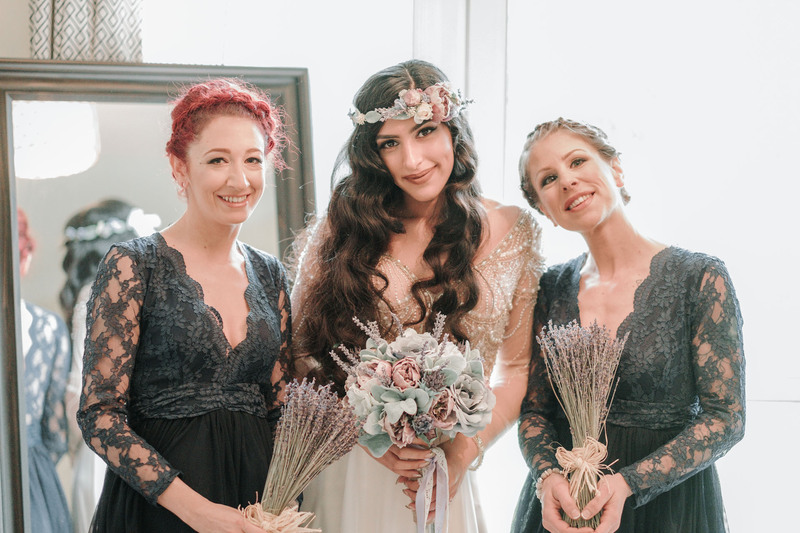 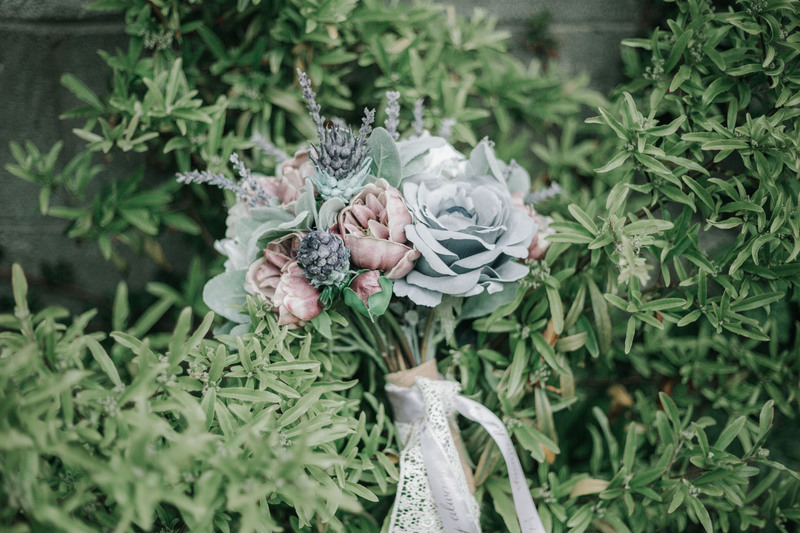 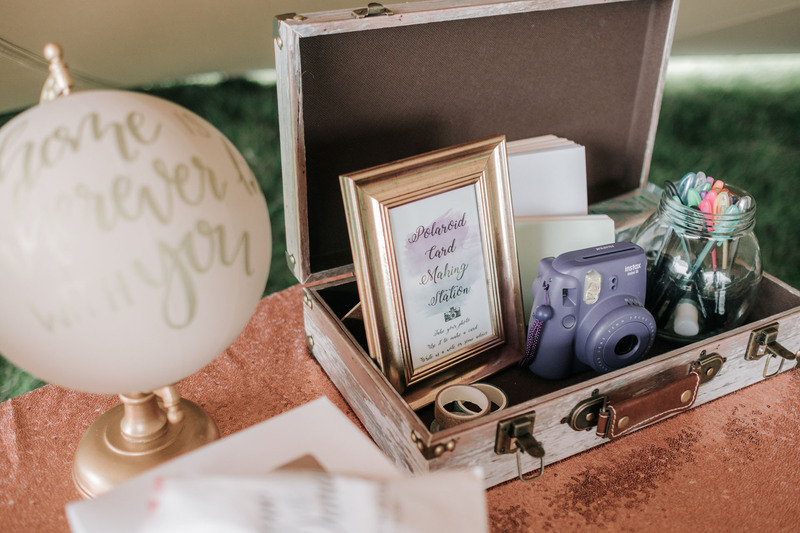 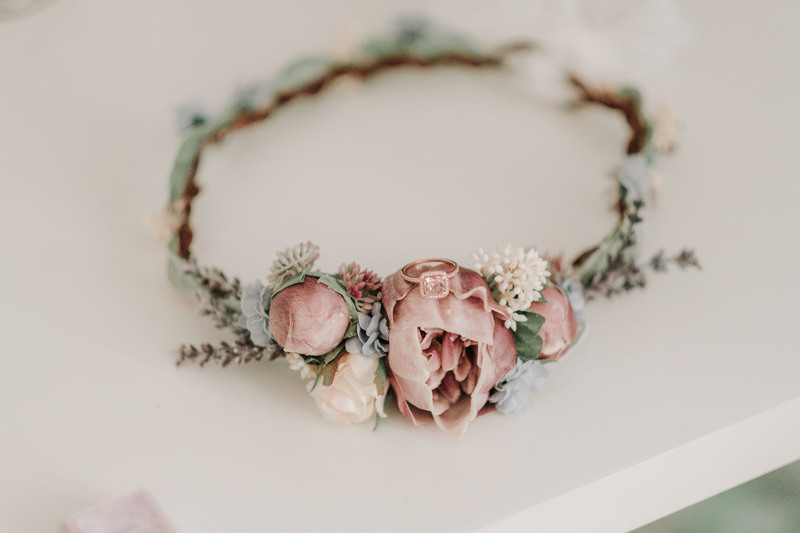 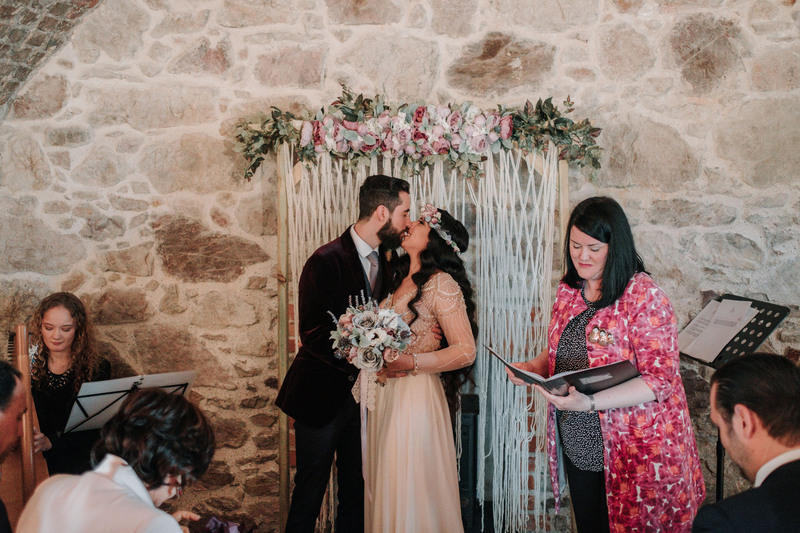 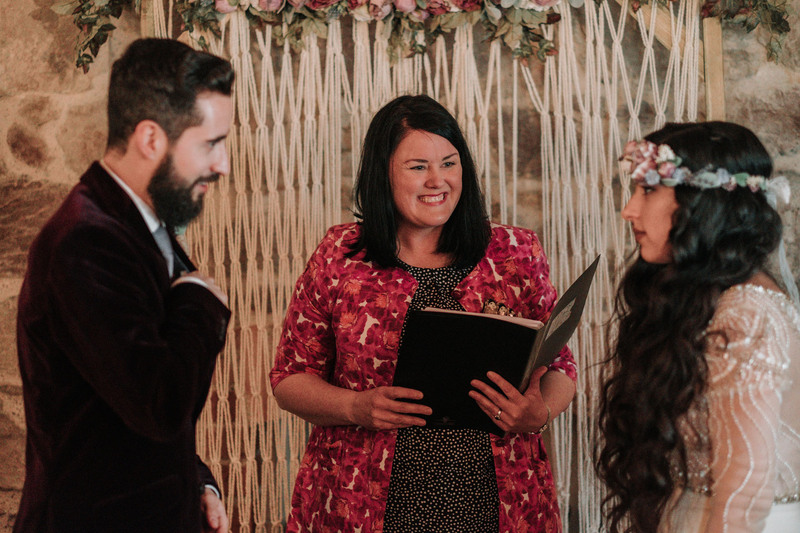 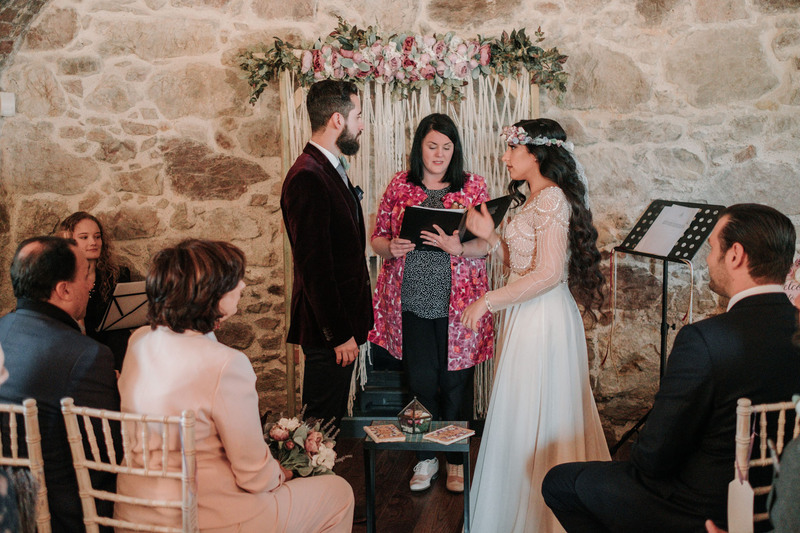 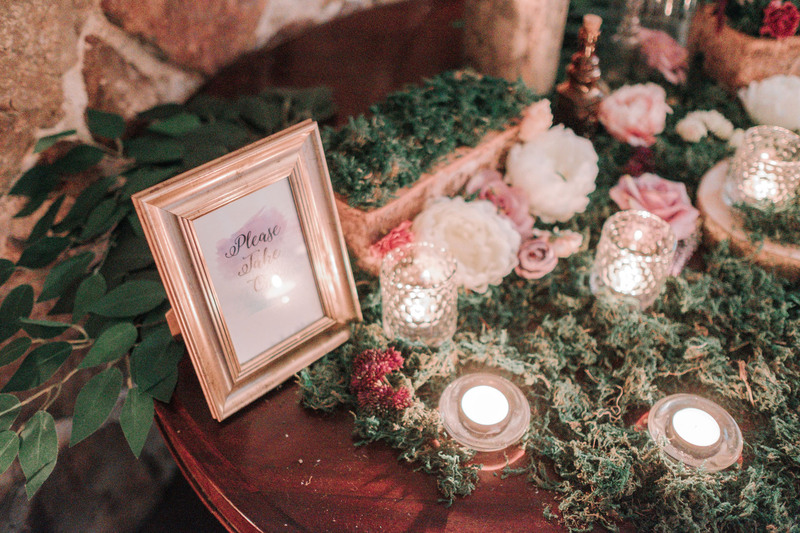 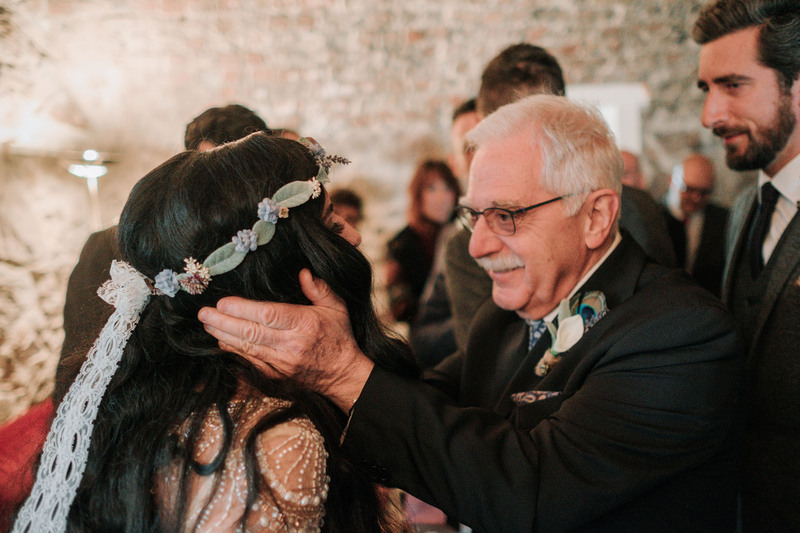 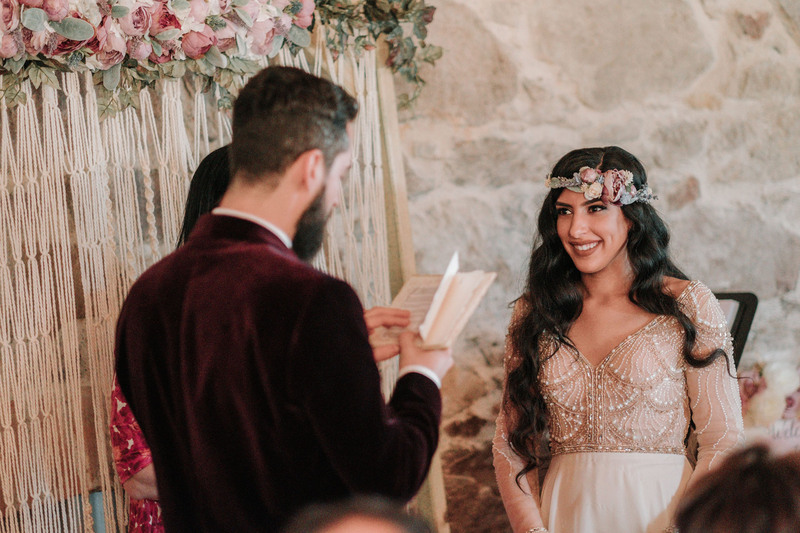 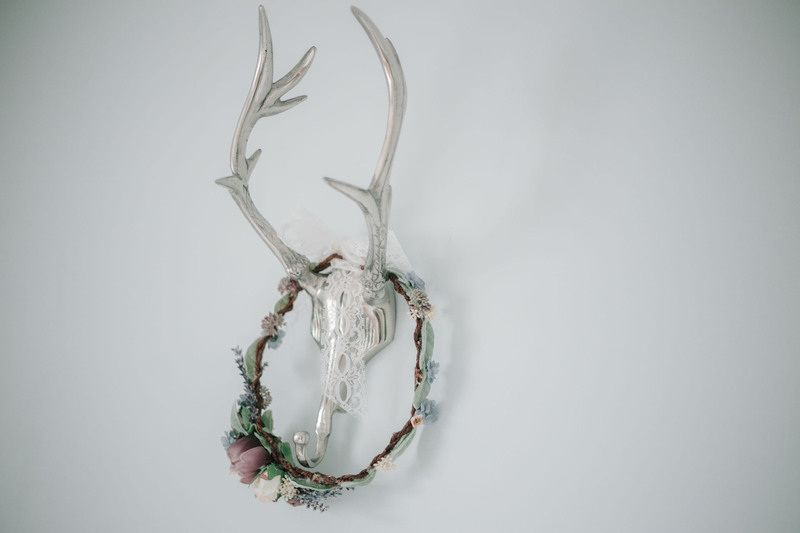 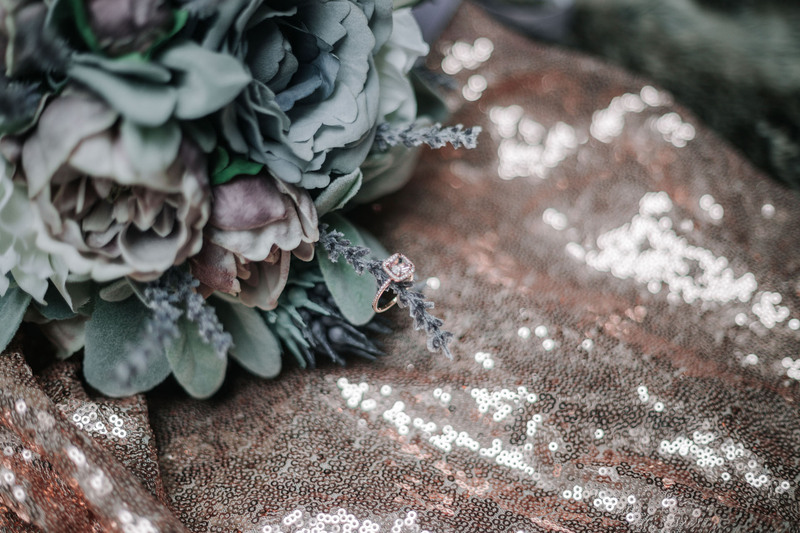 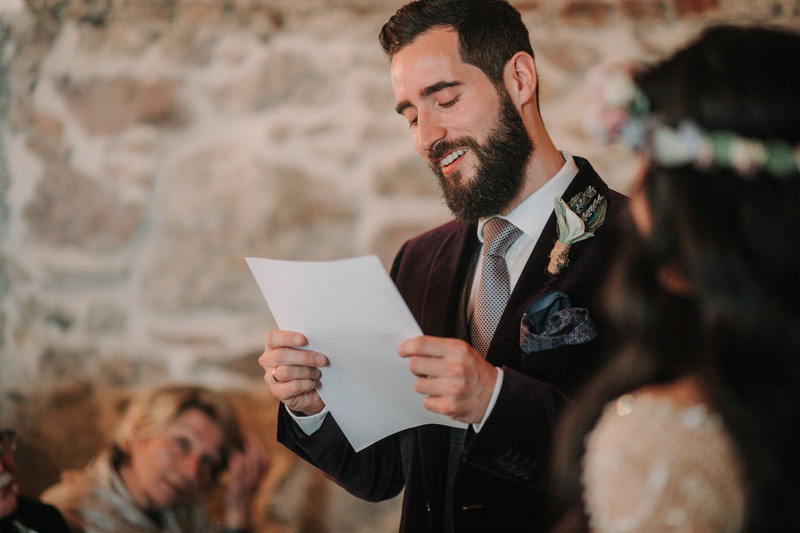 The couple exchanged their personal vows, which they both wrote individually by hand into tiny little books, adorned with purple and green flowers. 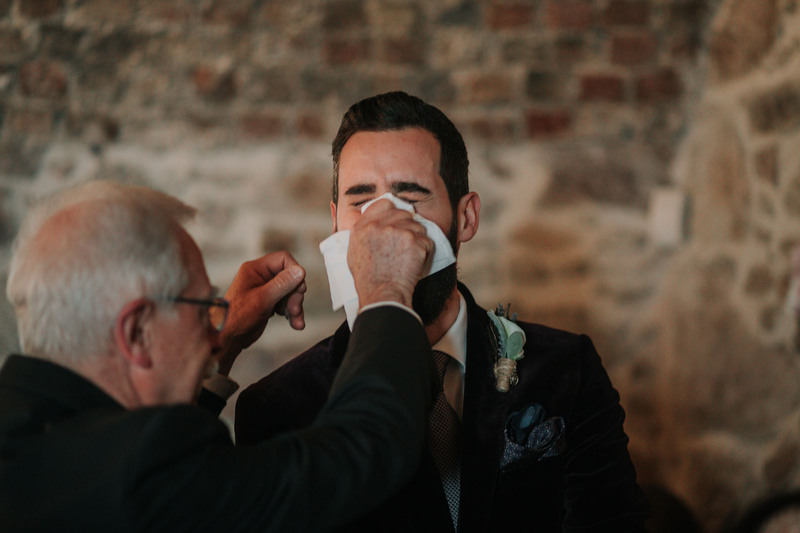 A very emotional Alessandro shed a few tears and a touching moment for everyone was when his father got up with a tissue to wipe his son’s tears away. 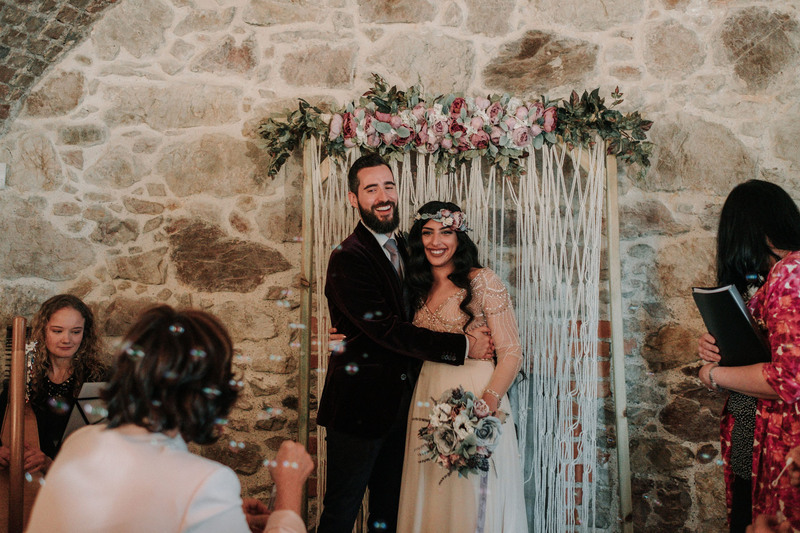 The service concluded with guests blowing bubbles toward them. 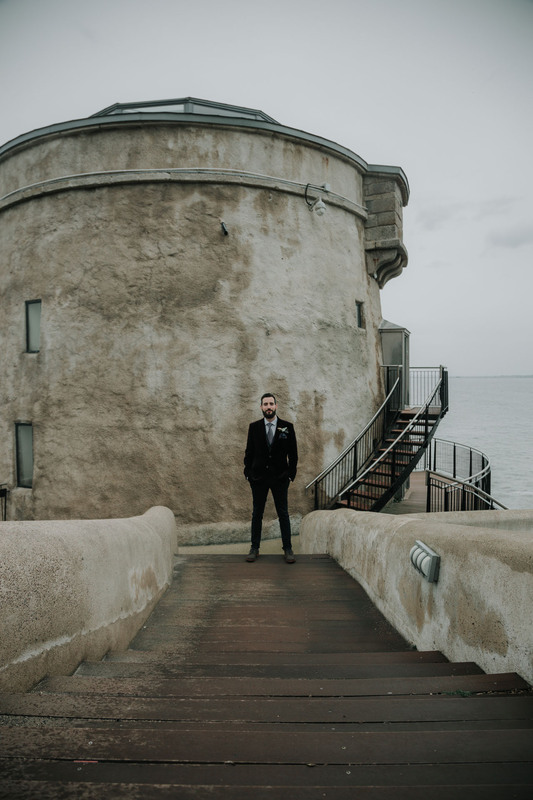 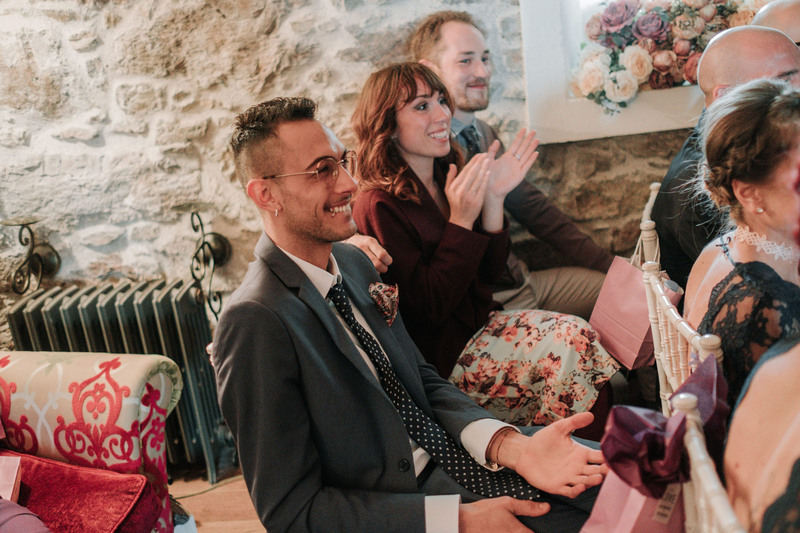 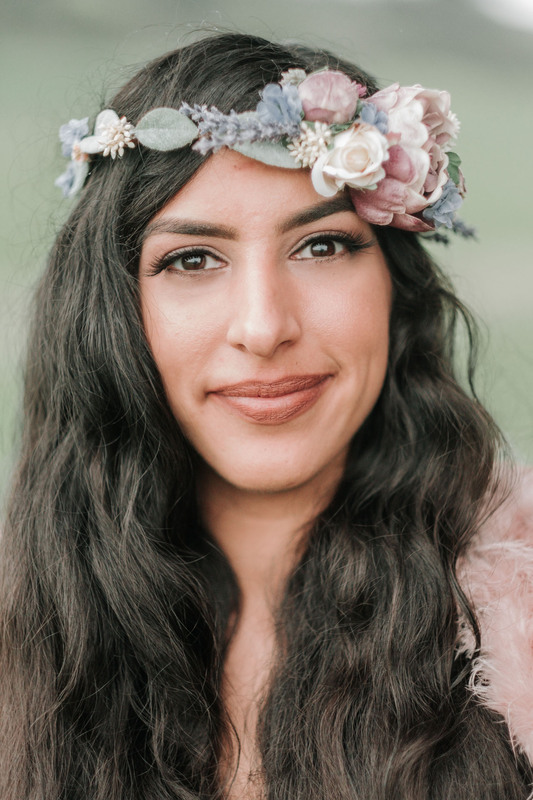 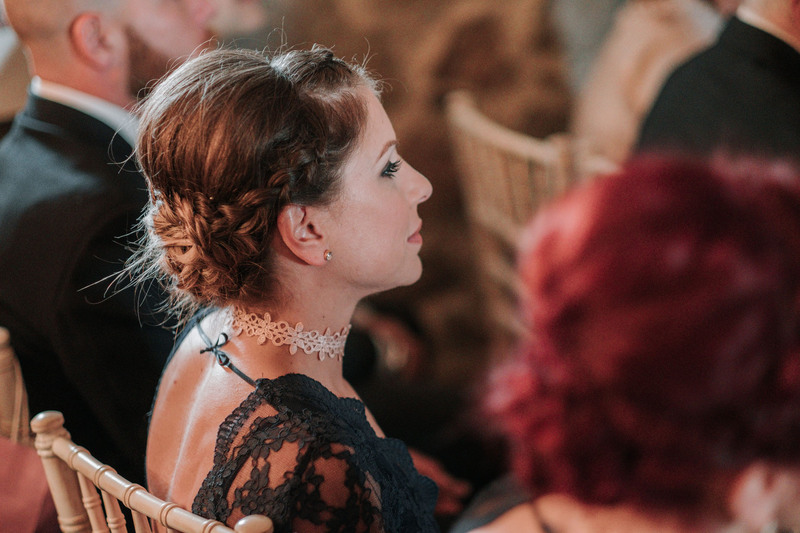 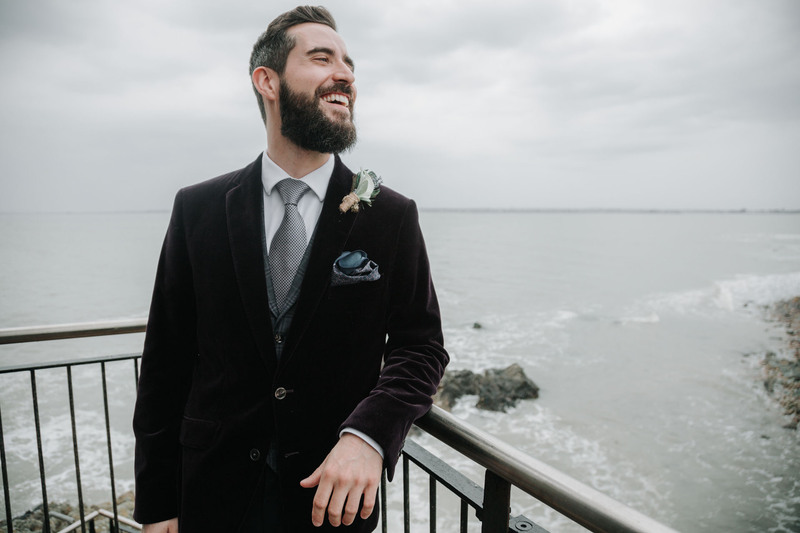 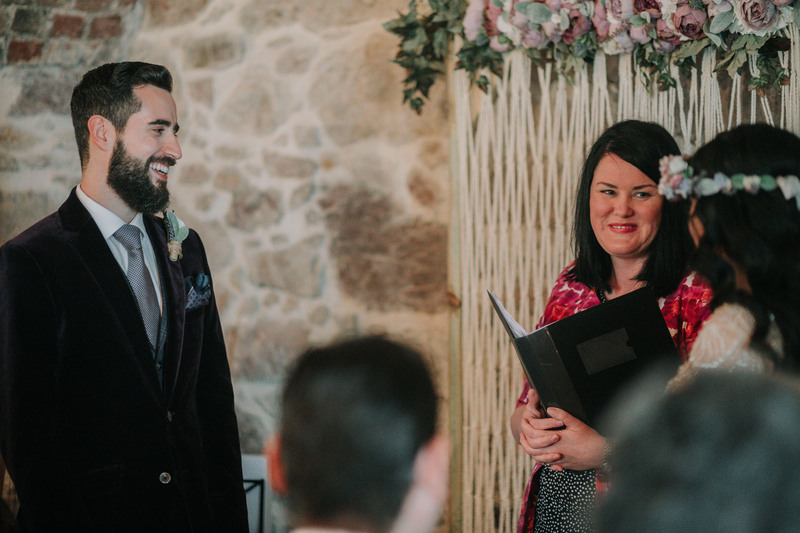 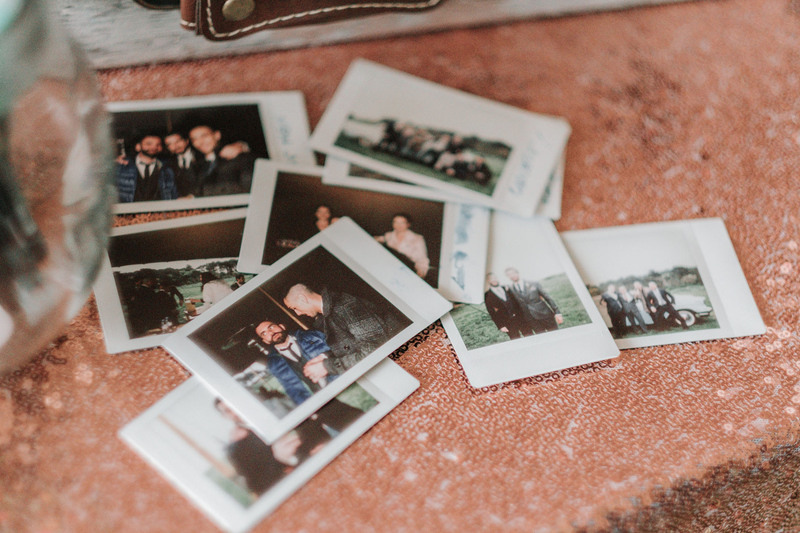 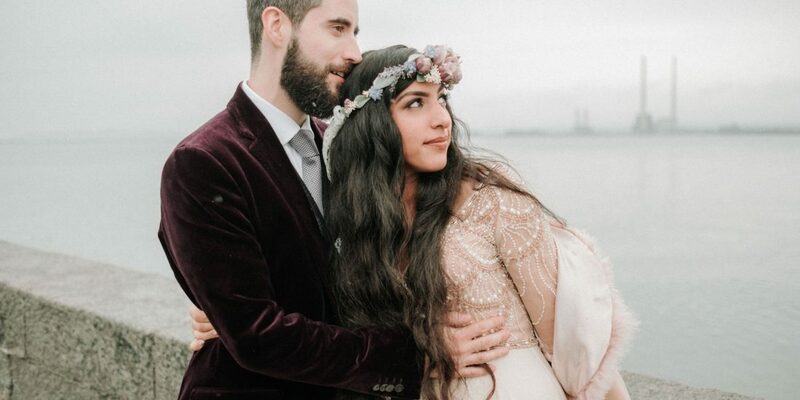 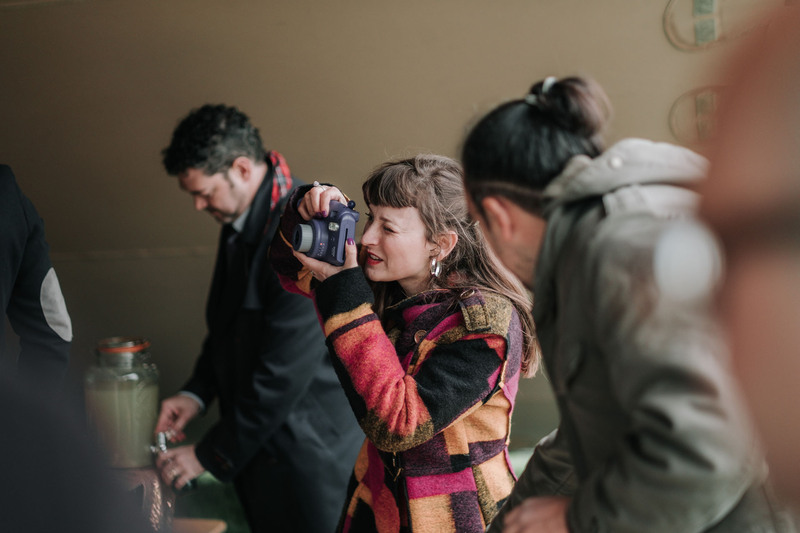 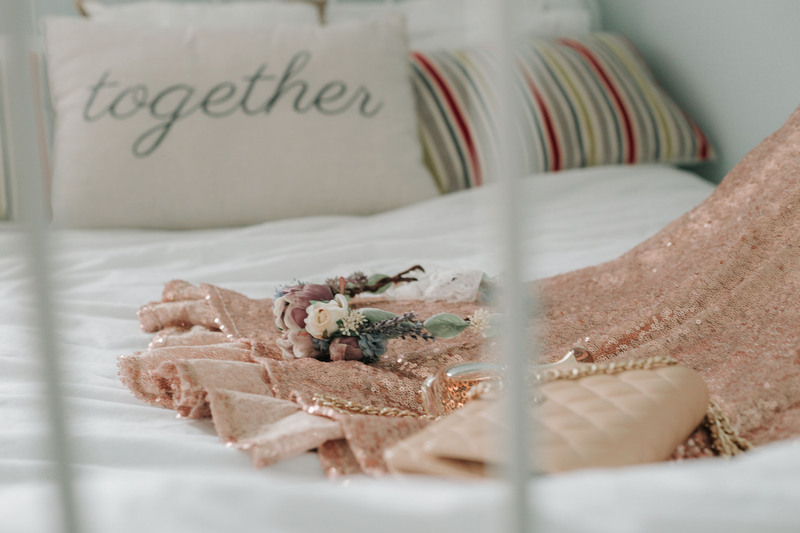 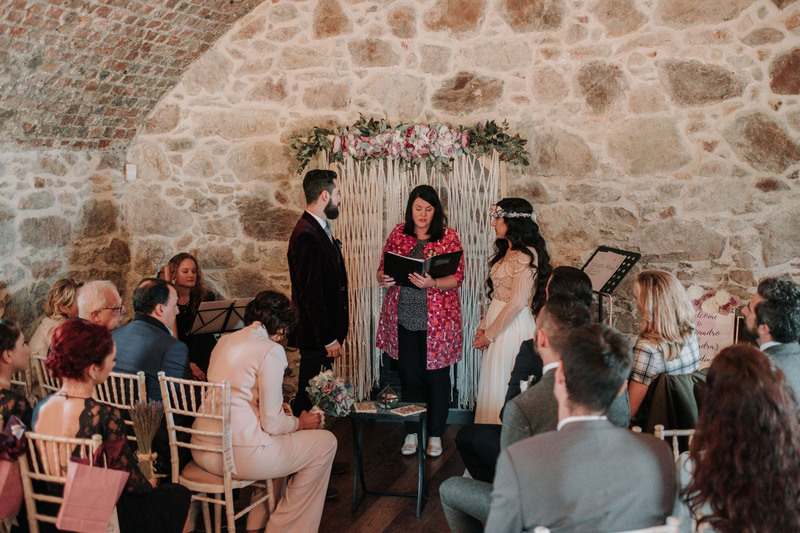 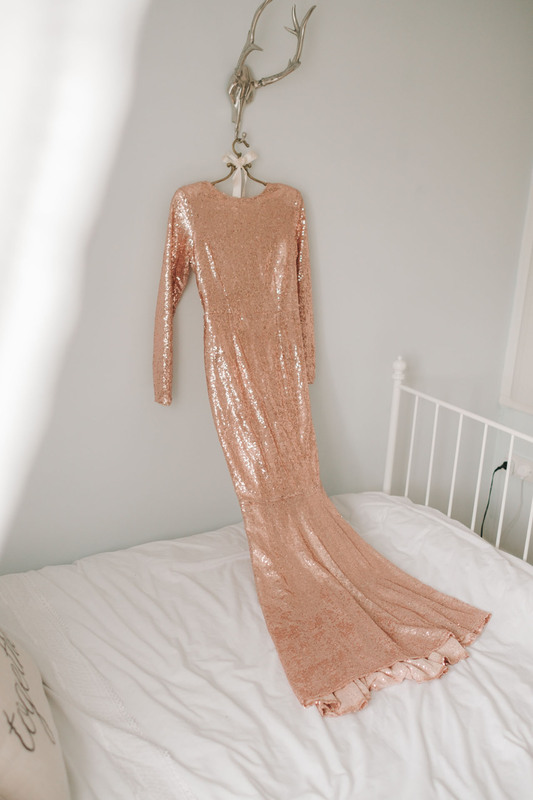 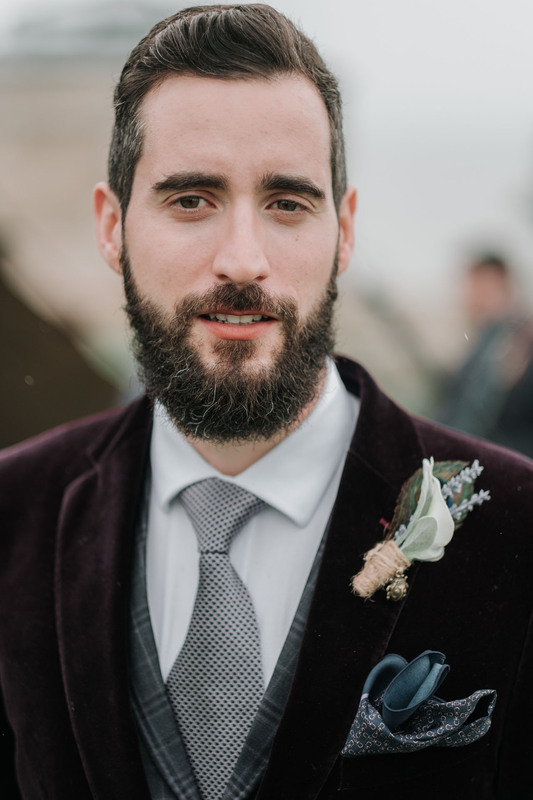 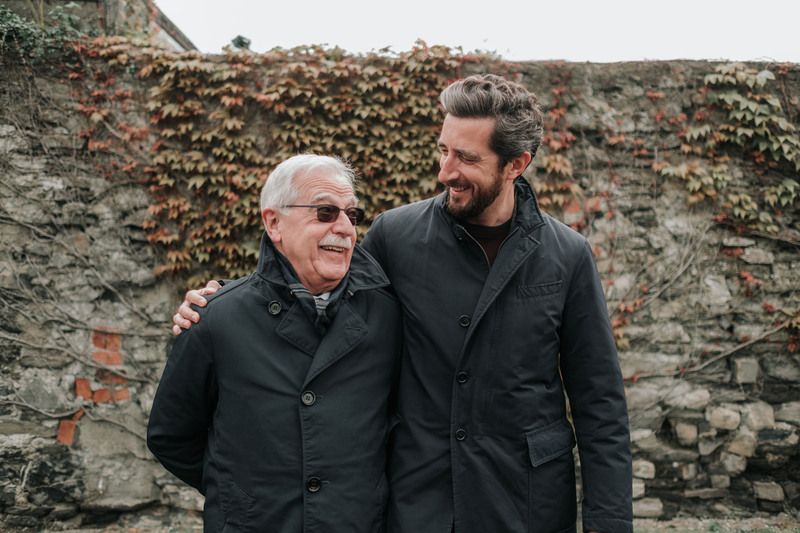 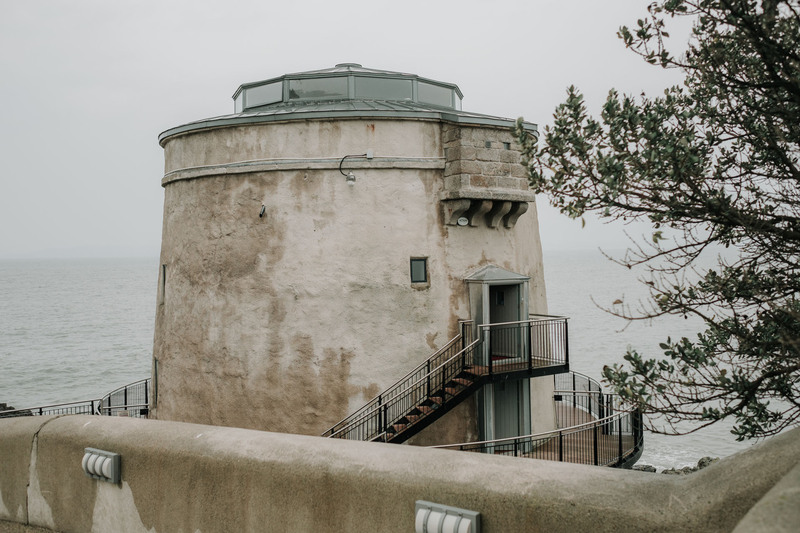 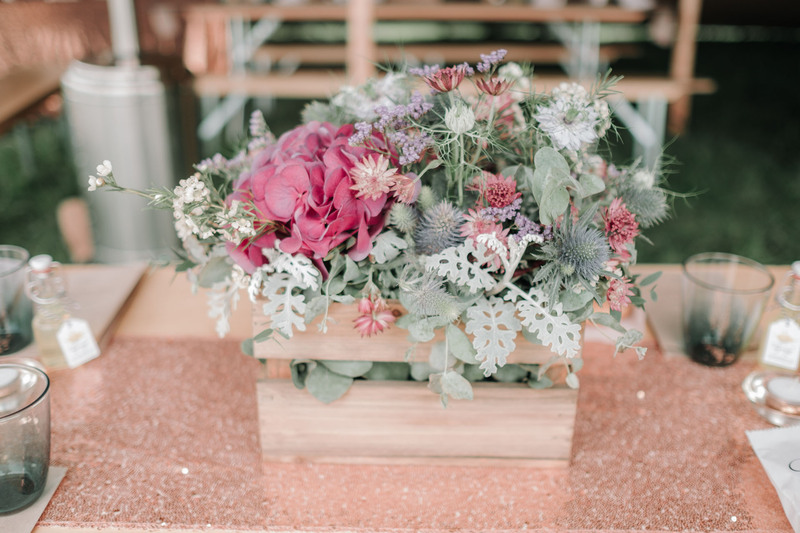 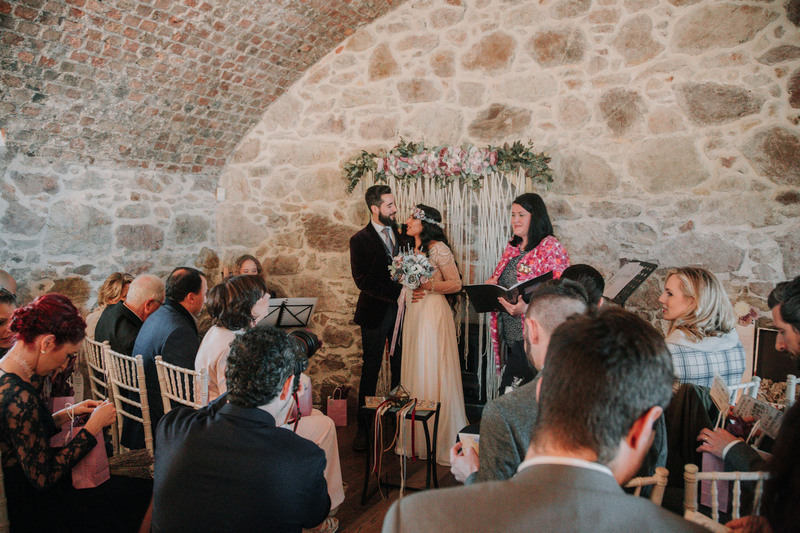 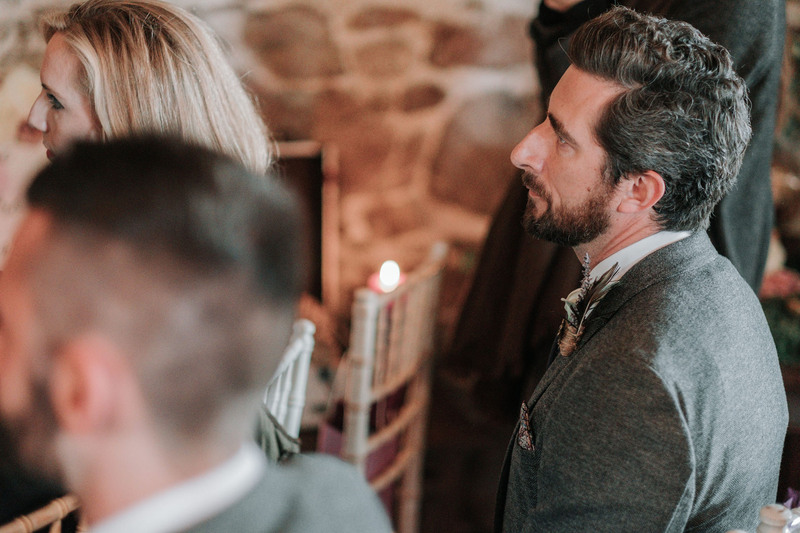 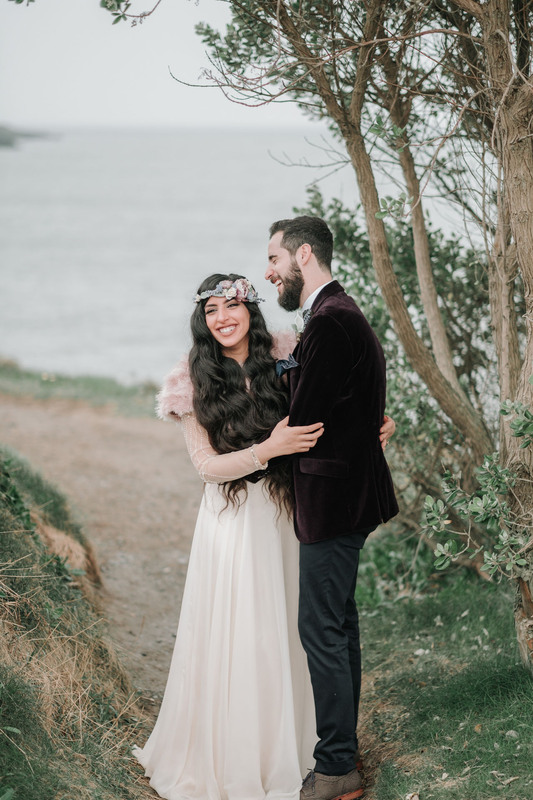 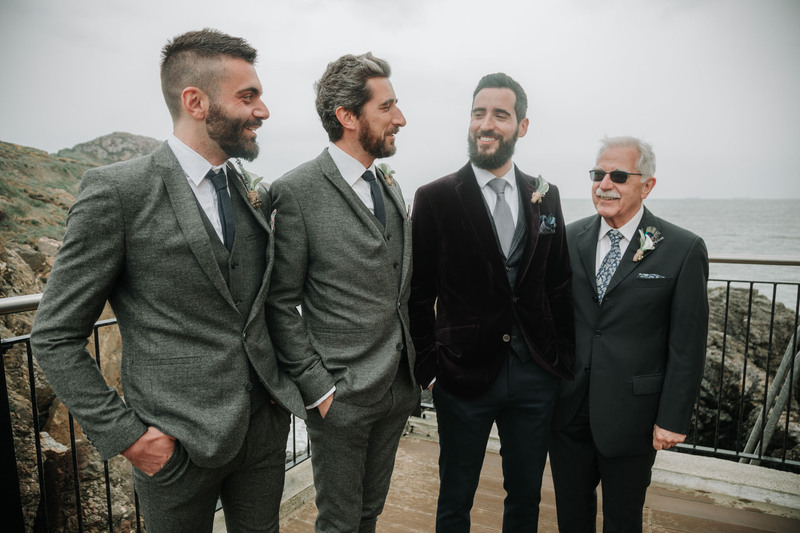 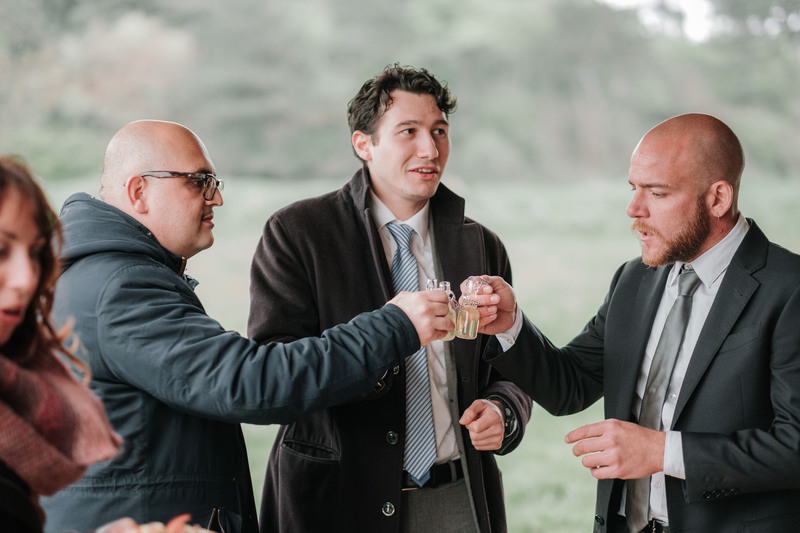 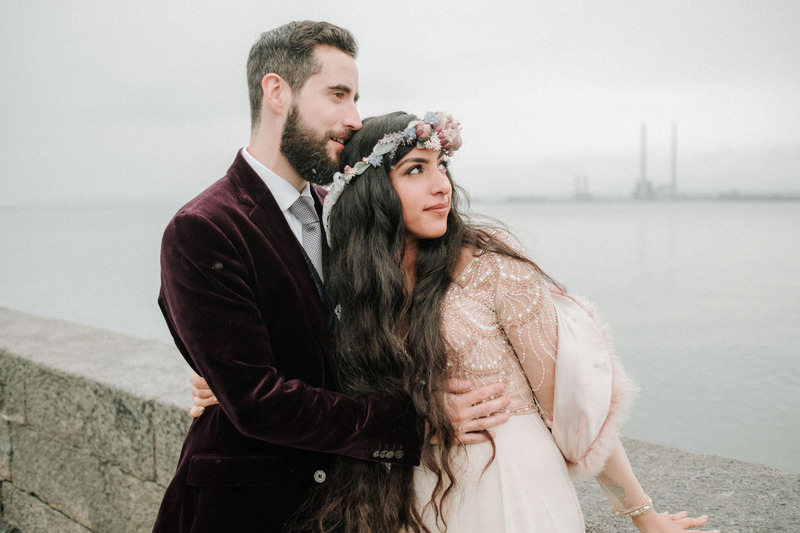 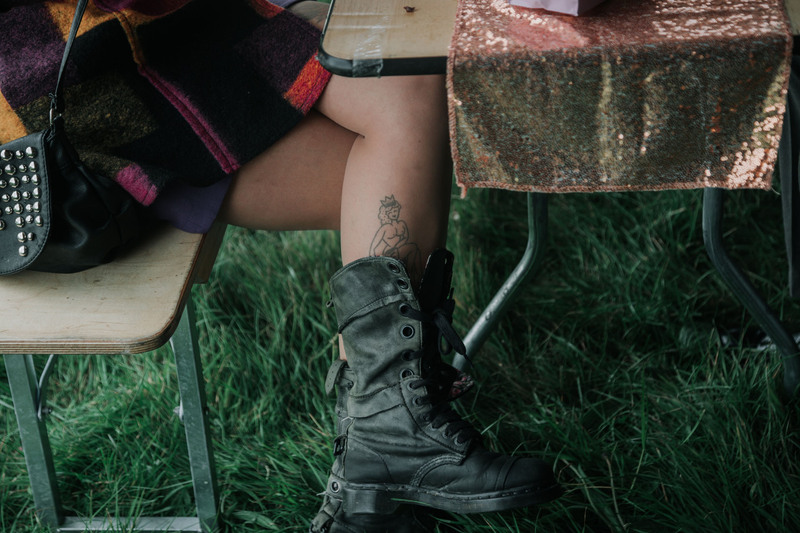 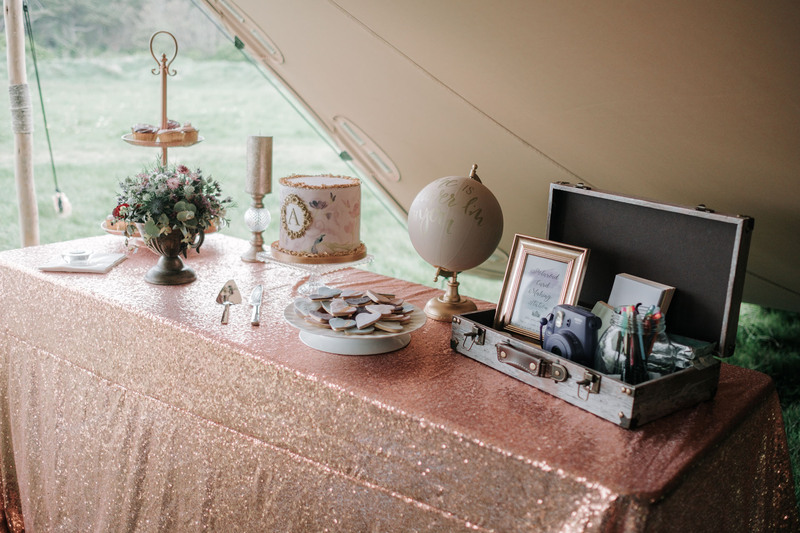 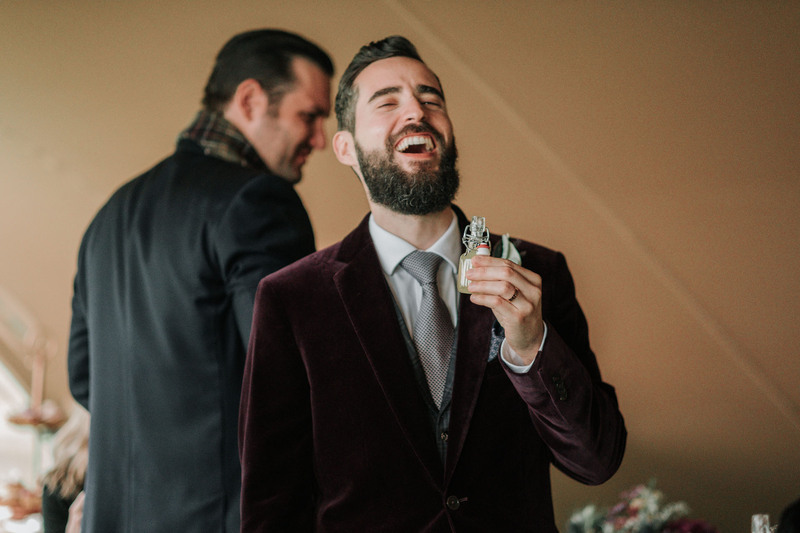 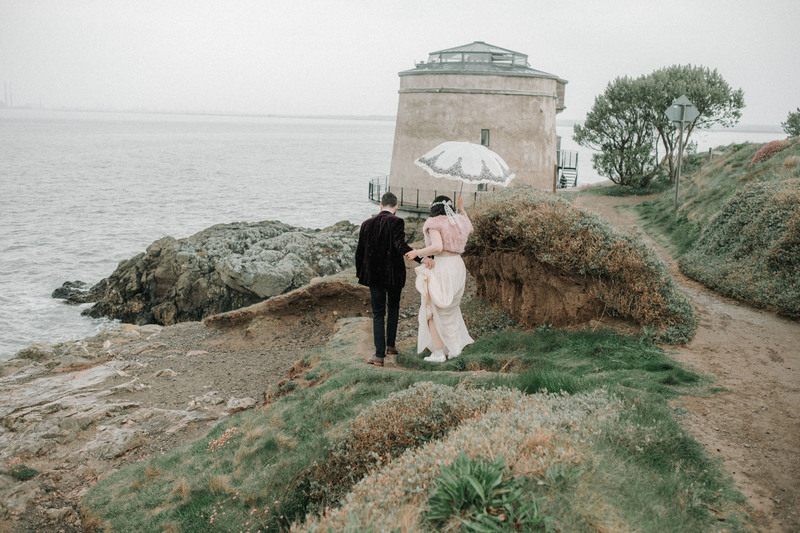 Once their Martello Tower Howth wedding ended, the wedding party and their guests moved outside to a very hip tent that was immaculately set up on Martello Towers adjoining field. 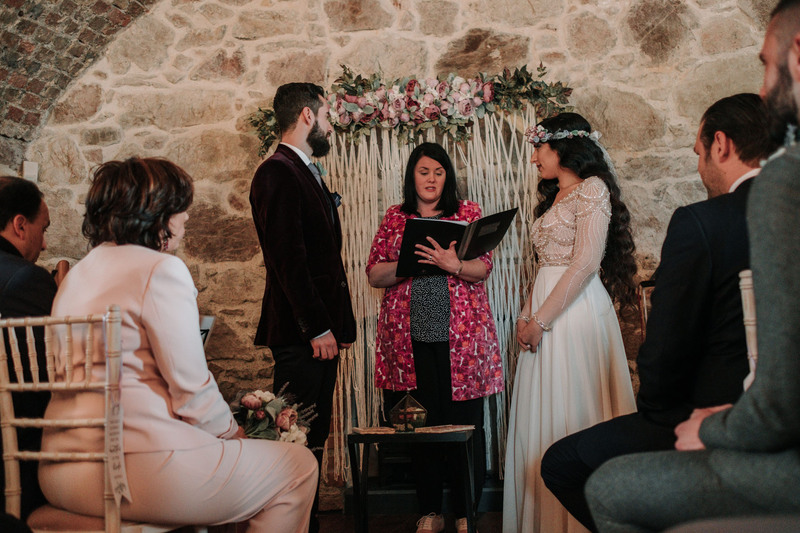 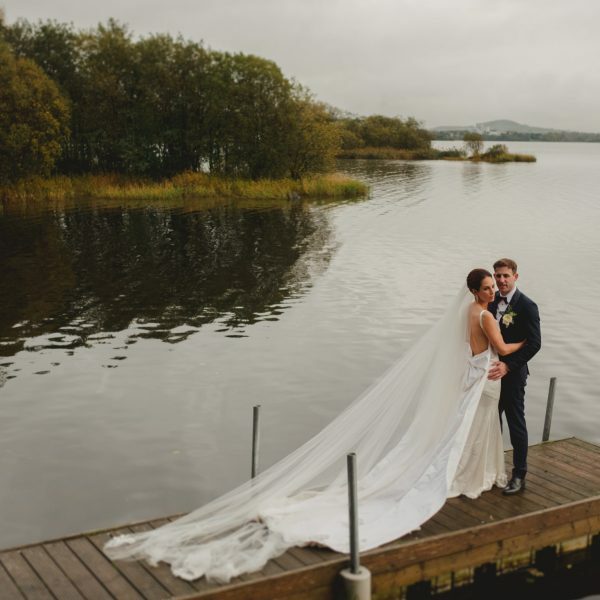 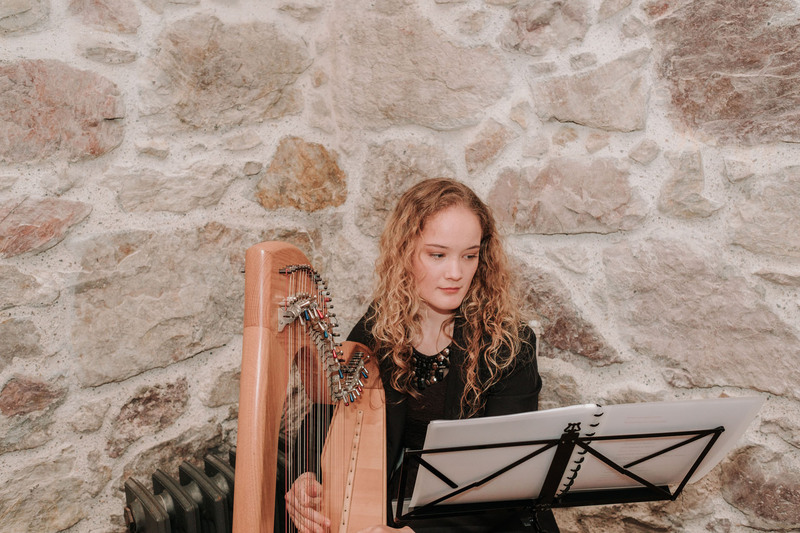 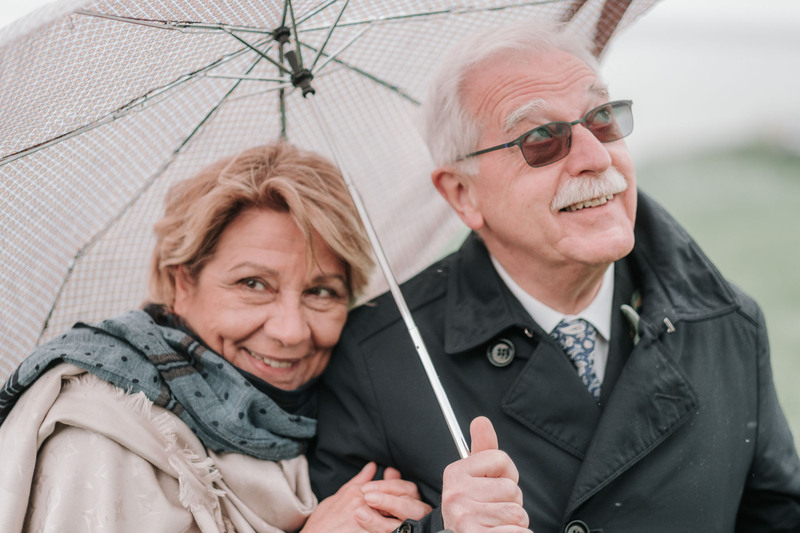 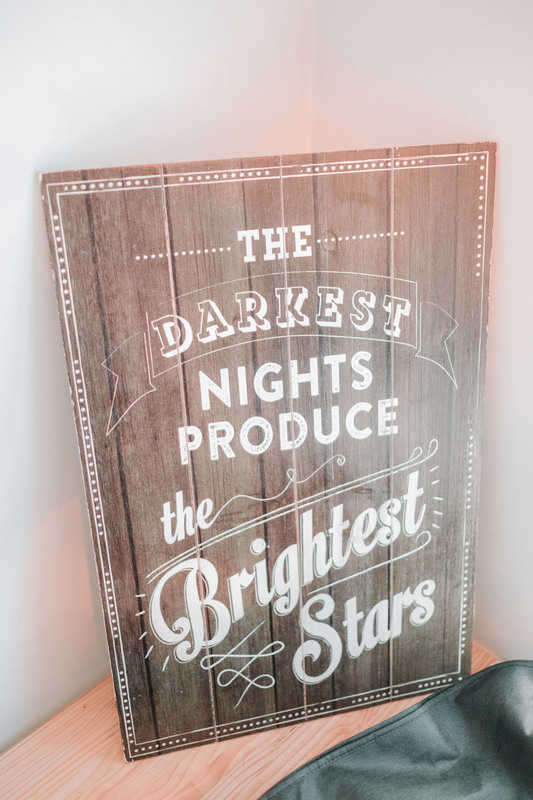 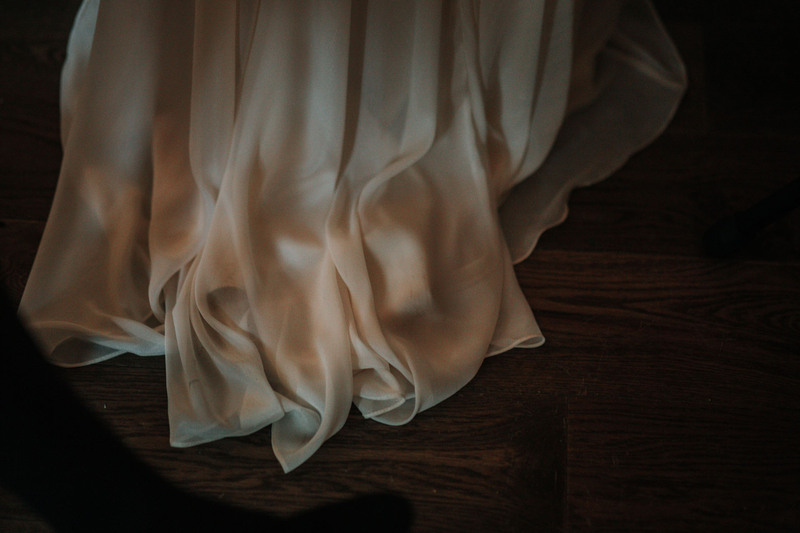 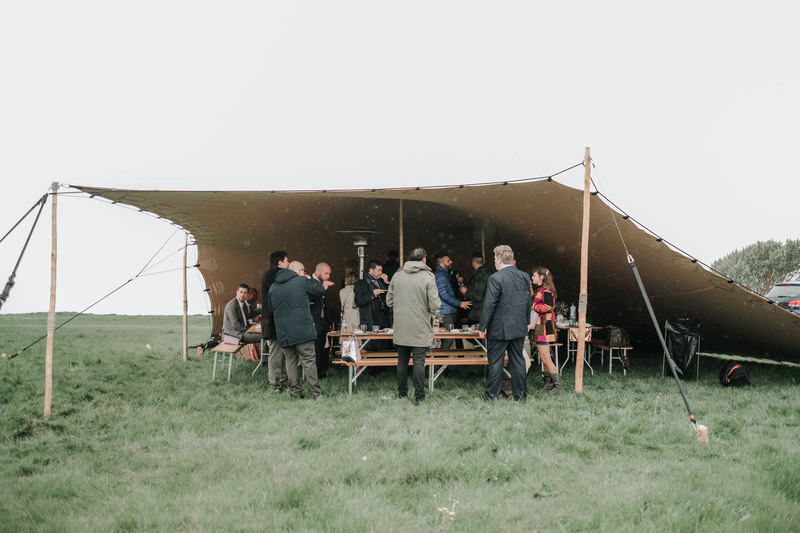 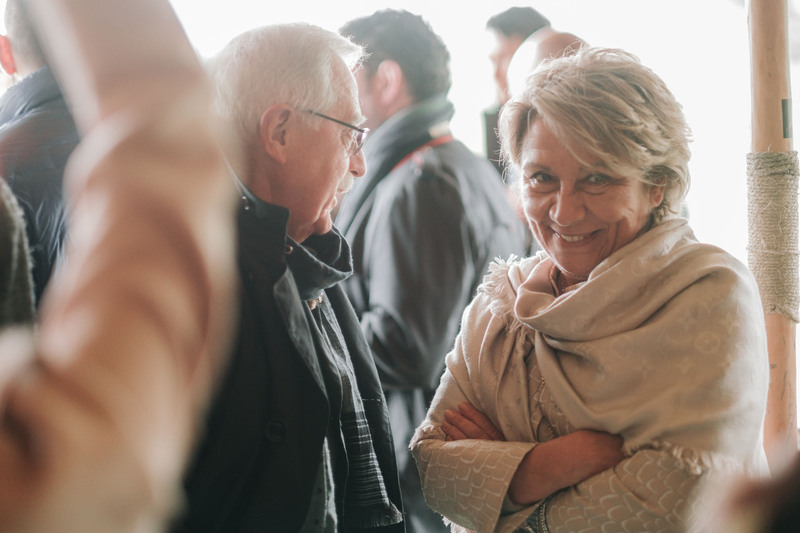 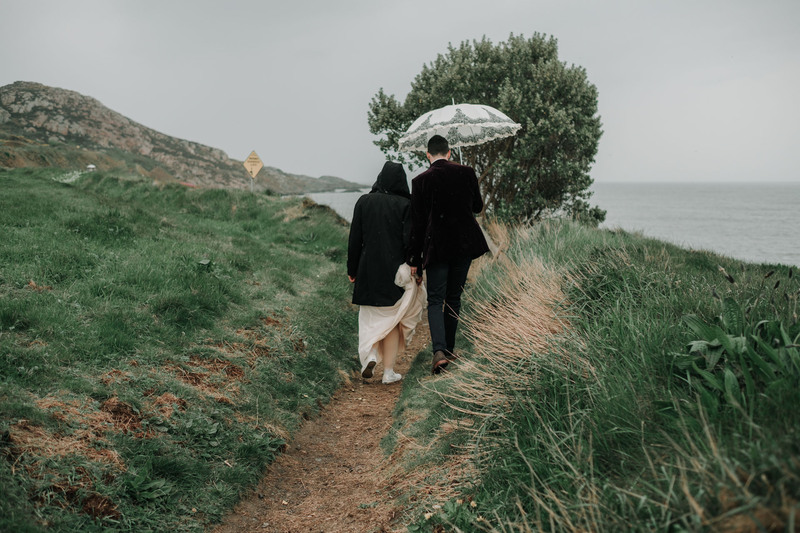 There was some powerful rain and wind along the Irish coast line that day, but it did not dampen the mood of the festivities, as their guests gathered under the large heated tent canopy and began the post vow party. 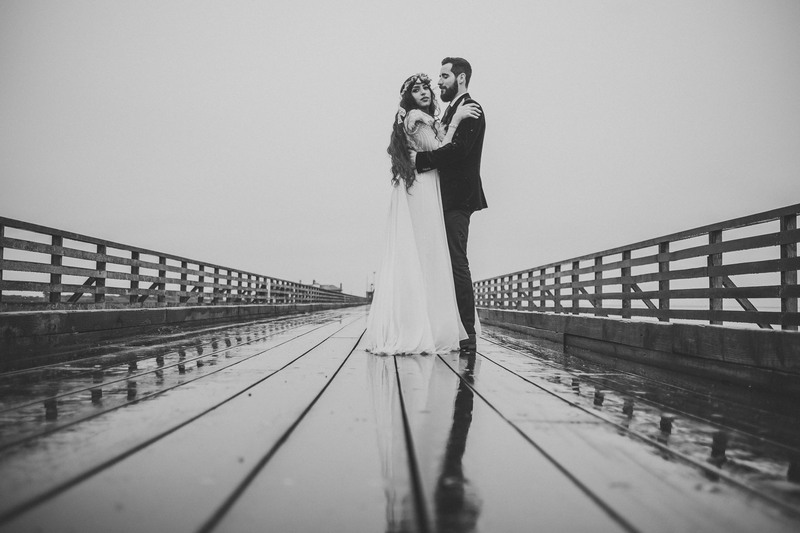 It also goes to show that lovely images can be captured in all conditions. 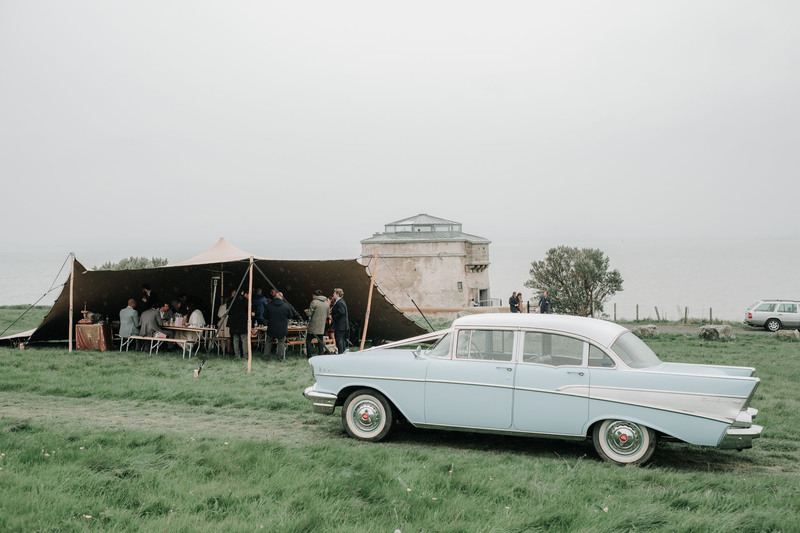 Beside the tent the baby blue convertible Cadillac parked waiting, while under the tent, purples, pale blues and pale greens were again the obvious color of choice for the couples decor. 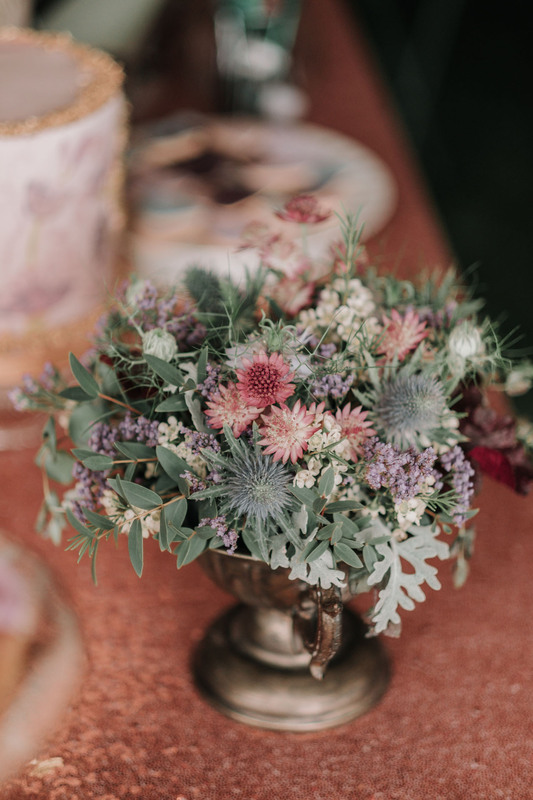 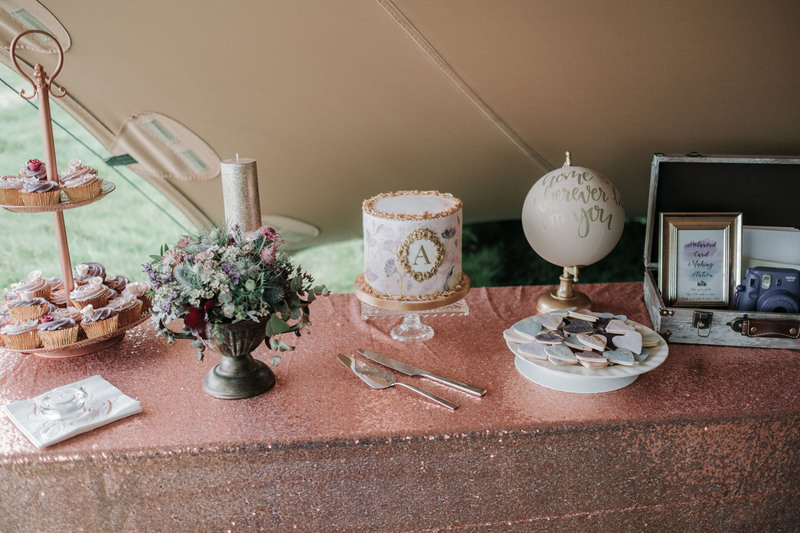 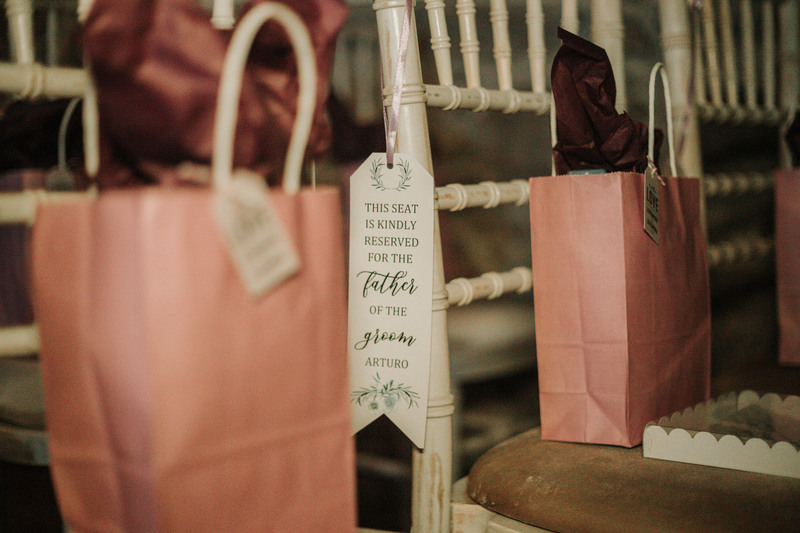 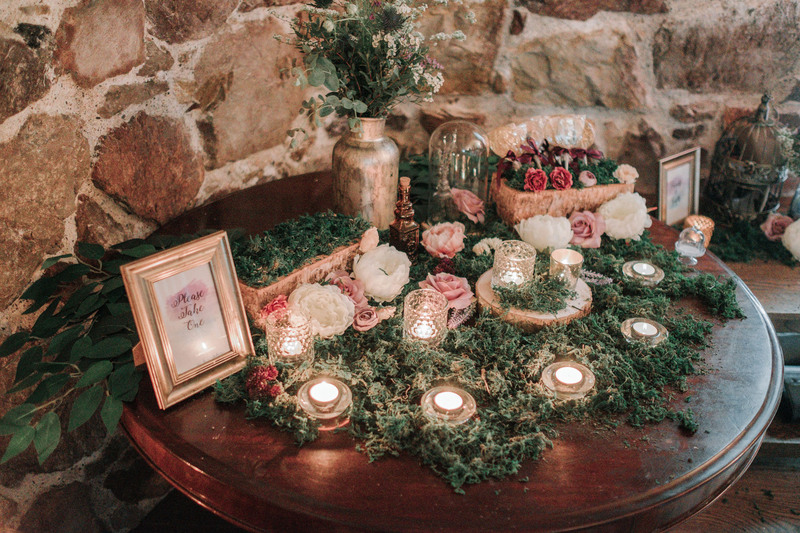 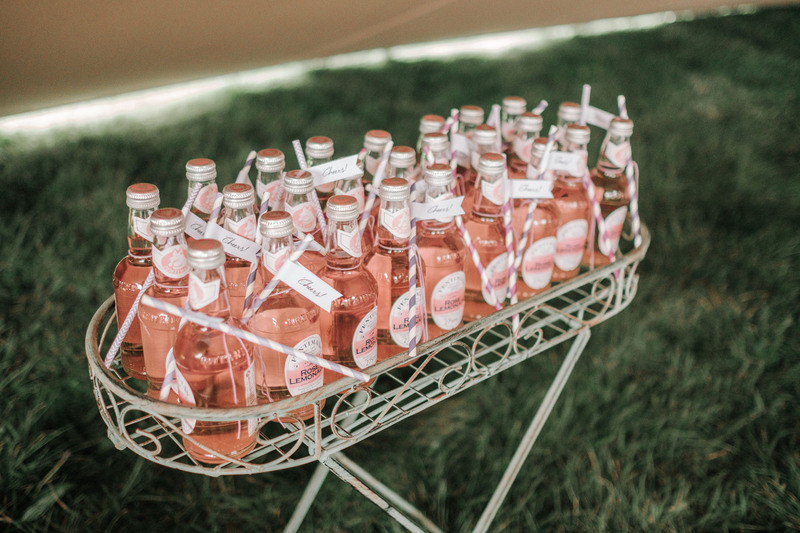 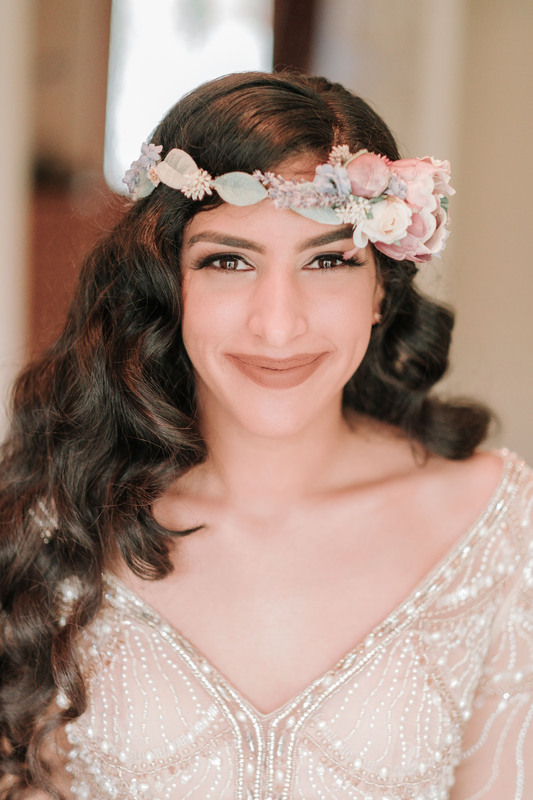 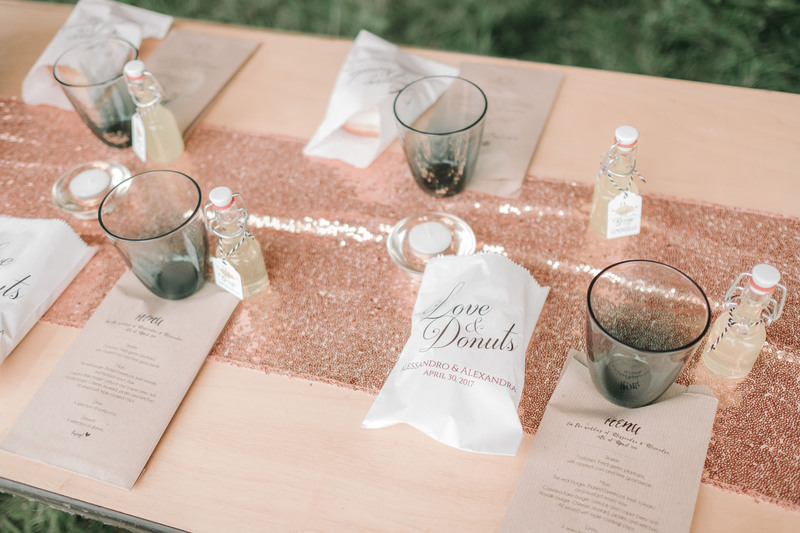 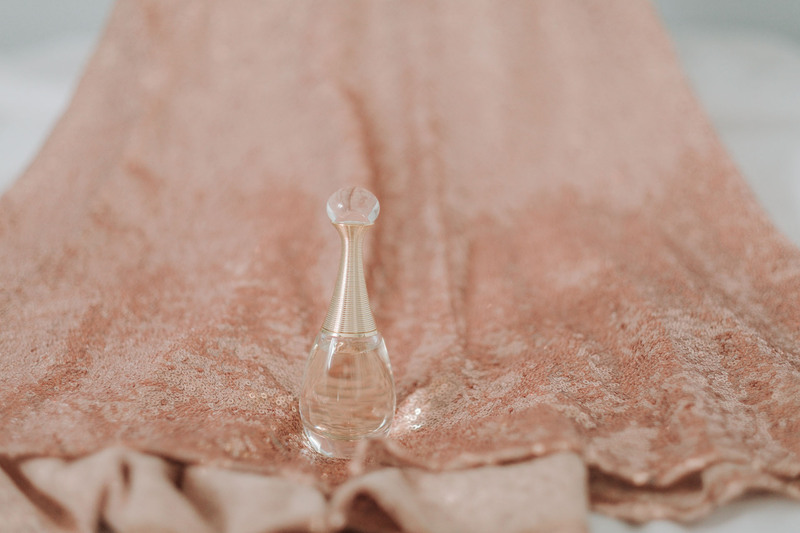 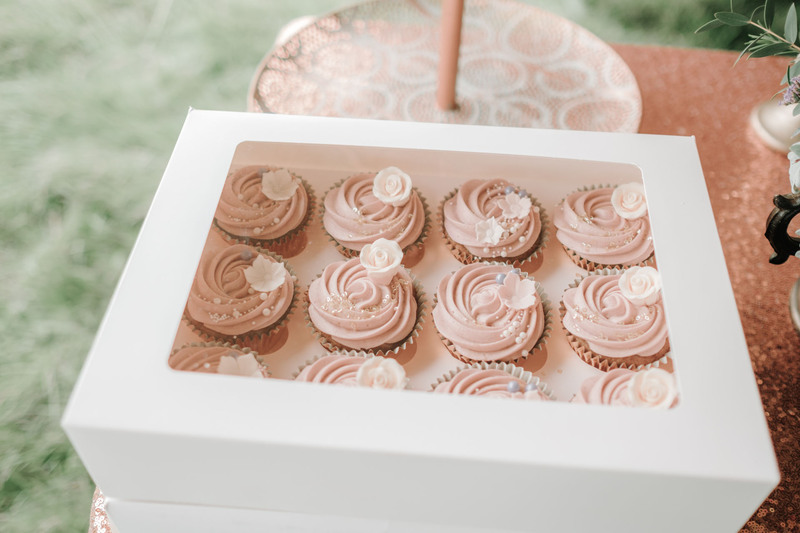 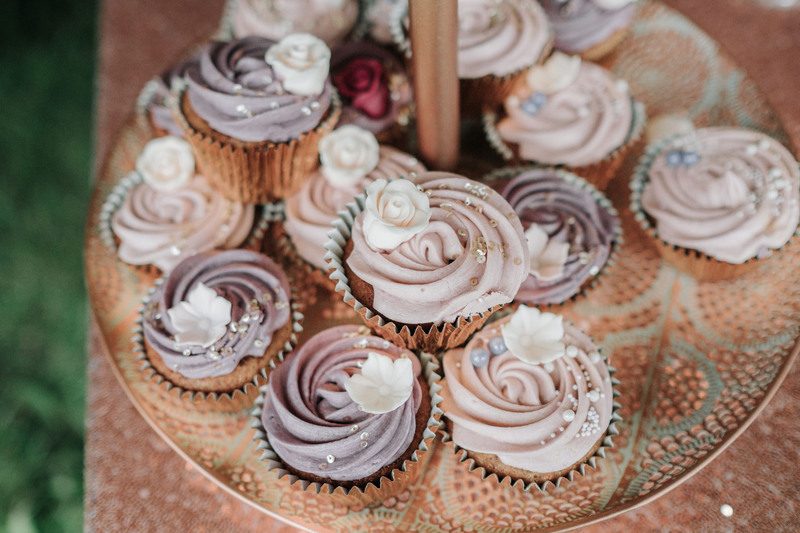 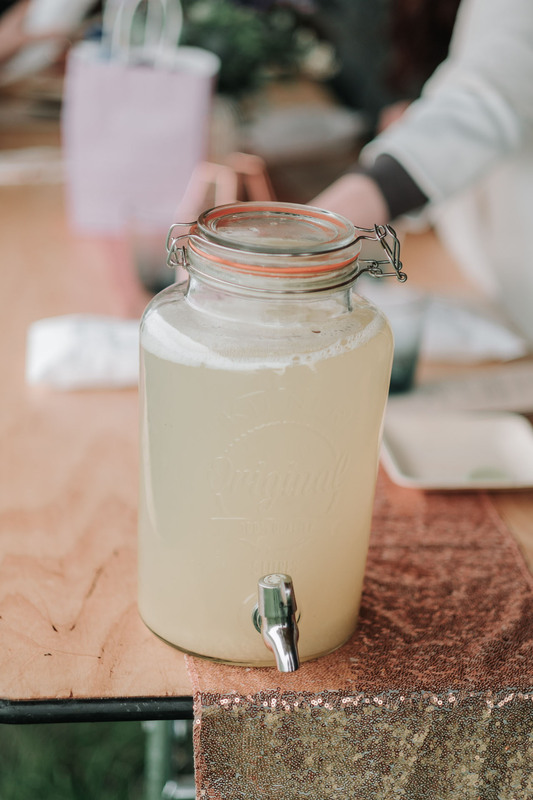 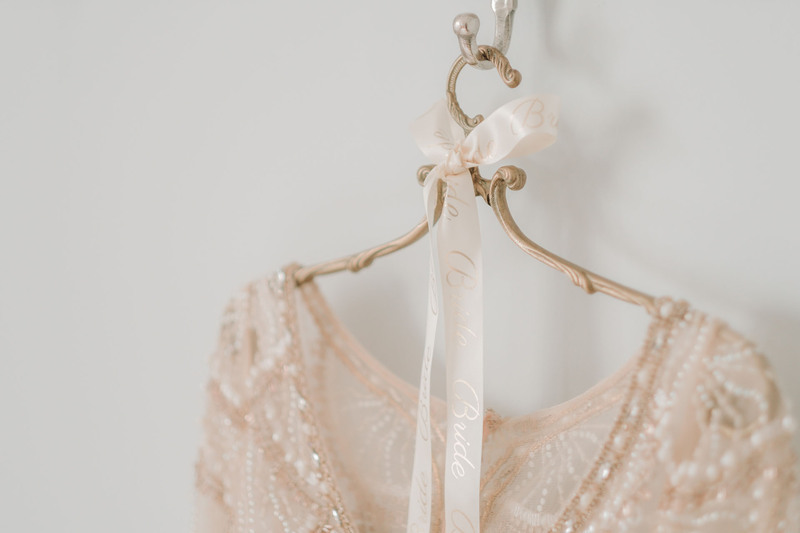 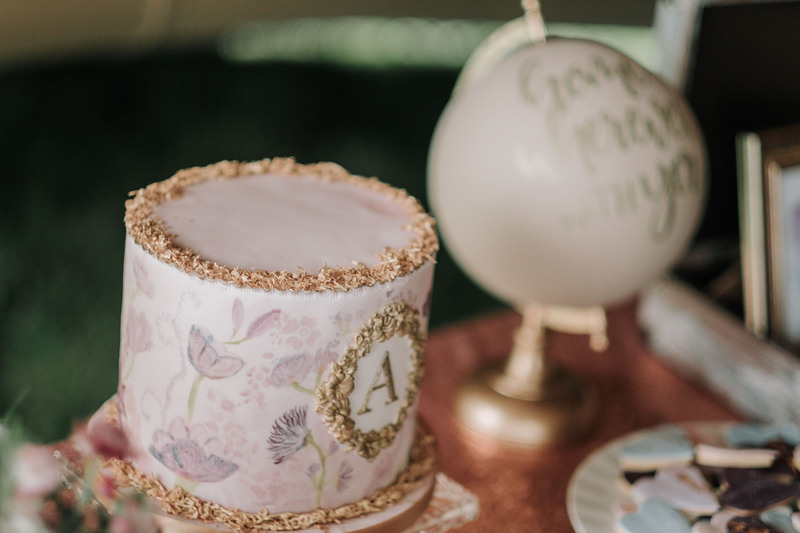 Everything from stunning bouquets on the tables, decorated cookies, muffins, wedding cake, small lemoncello bottles at each place setting and a metal buggy carrying pink lemonade bottles with matching straws, had their place. 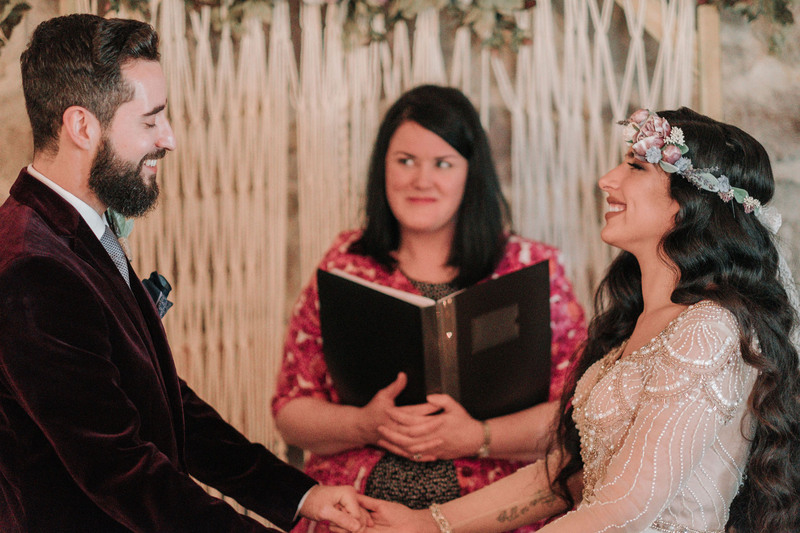 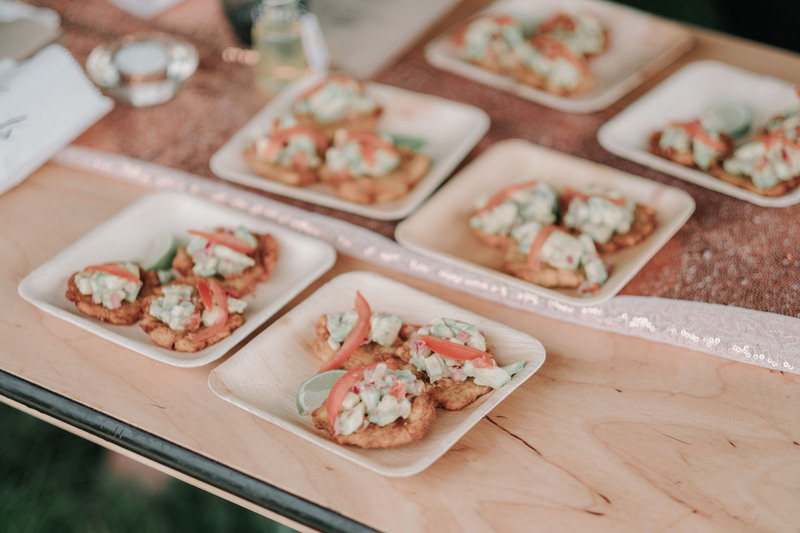 The couple and their guests dined on catering of mini burgers and falafel sandwiches, while congratulations were exchanged. 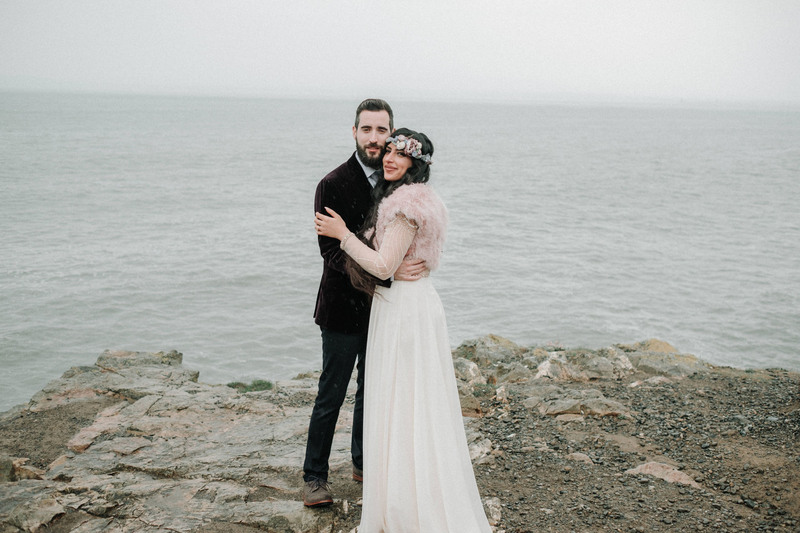 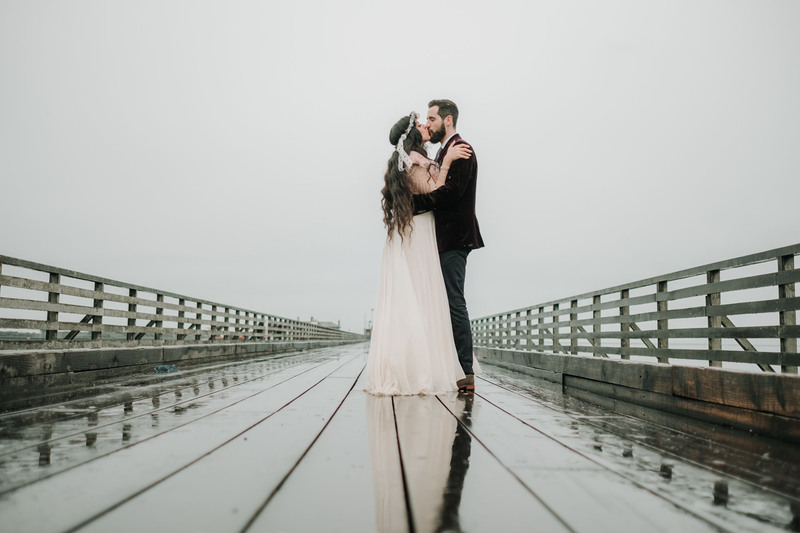 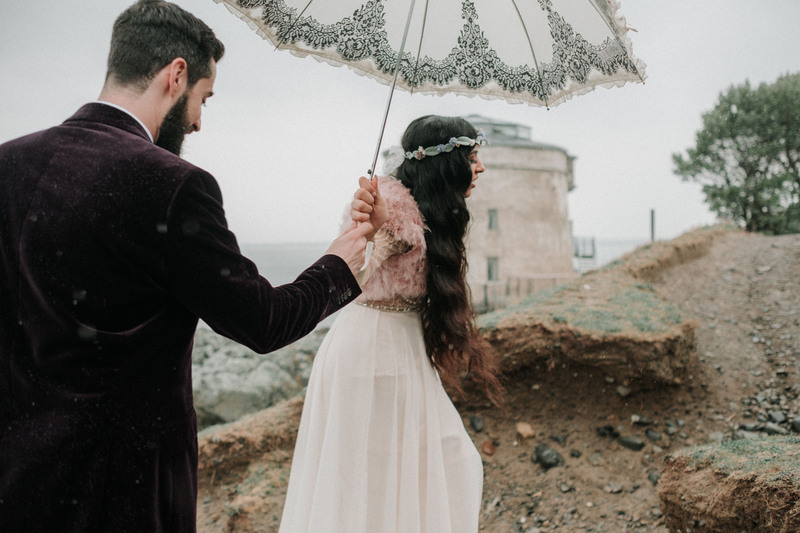 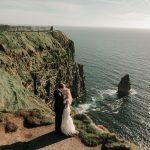 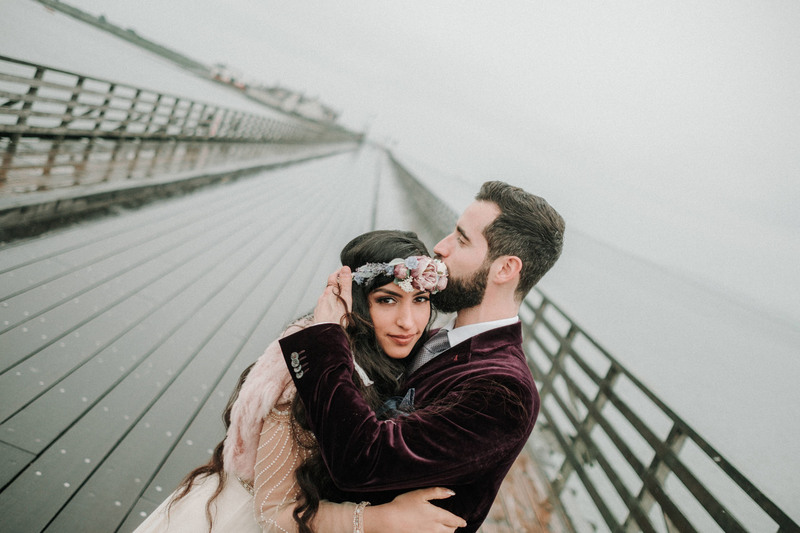 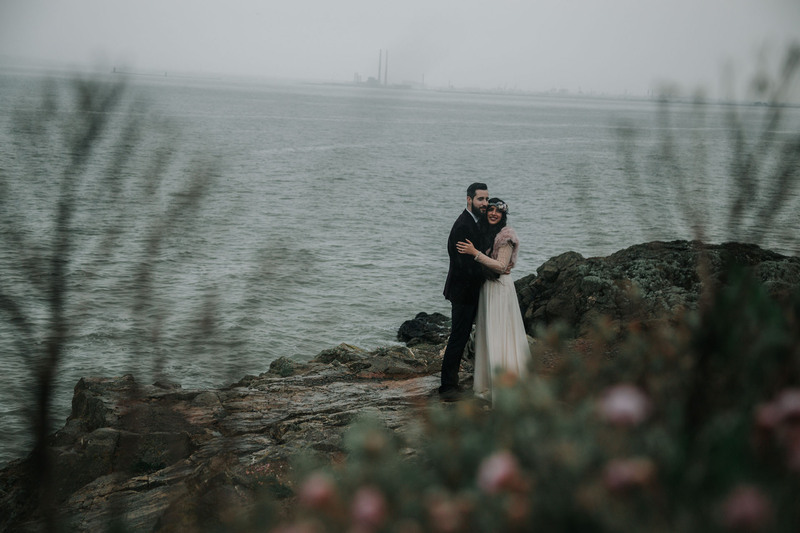 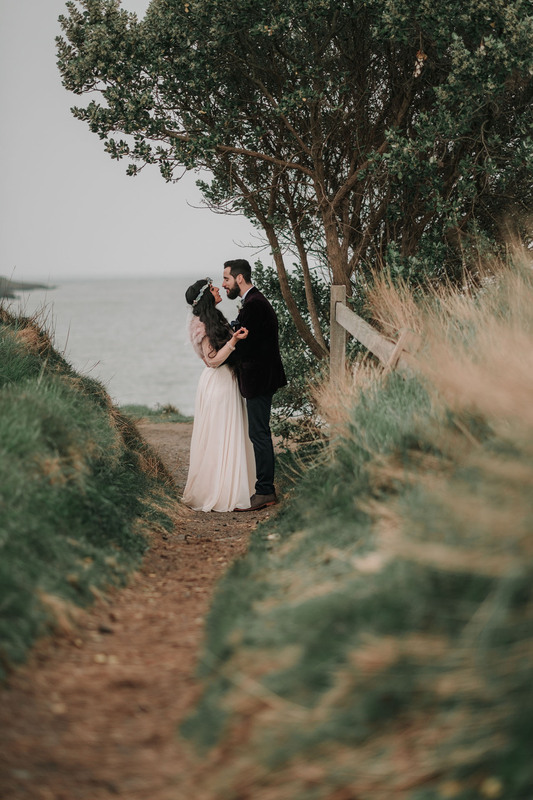 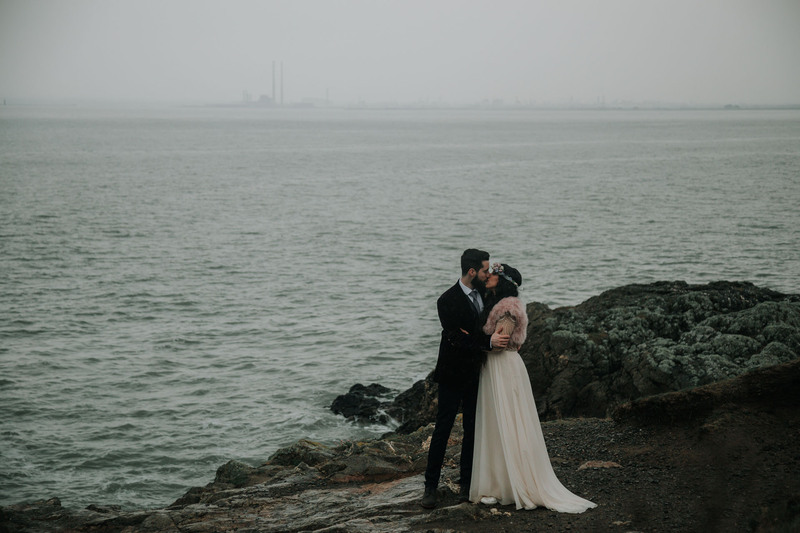 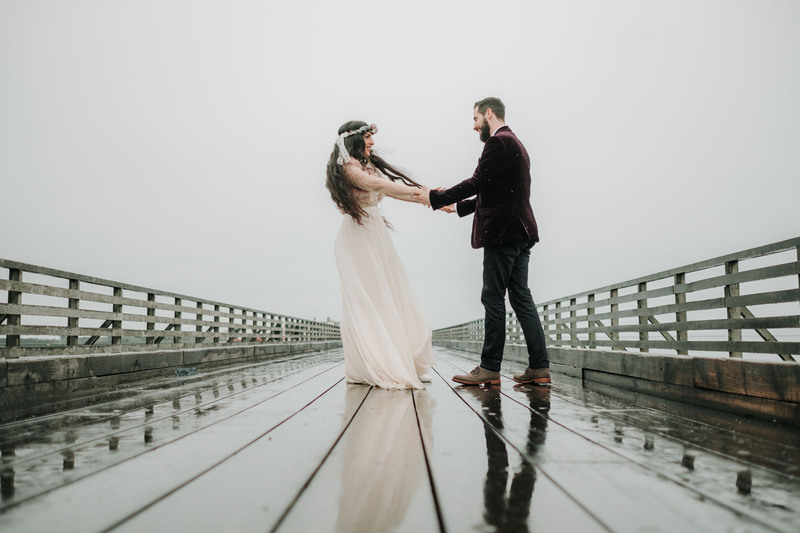 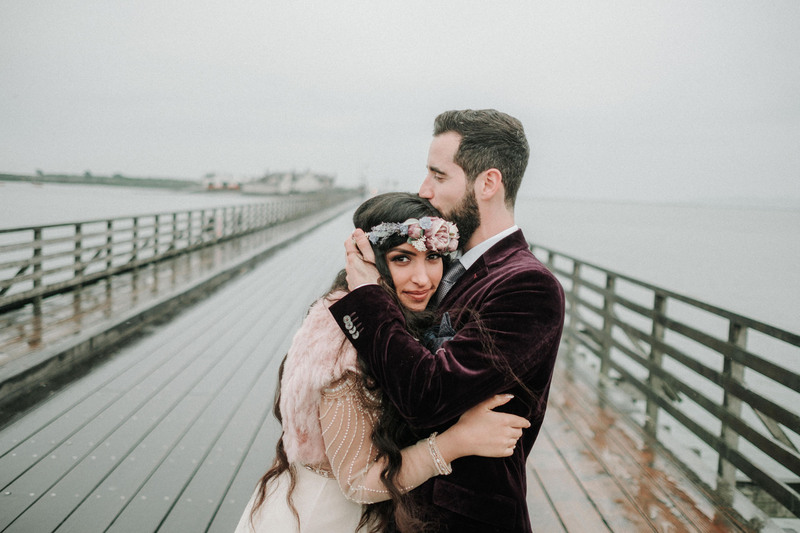 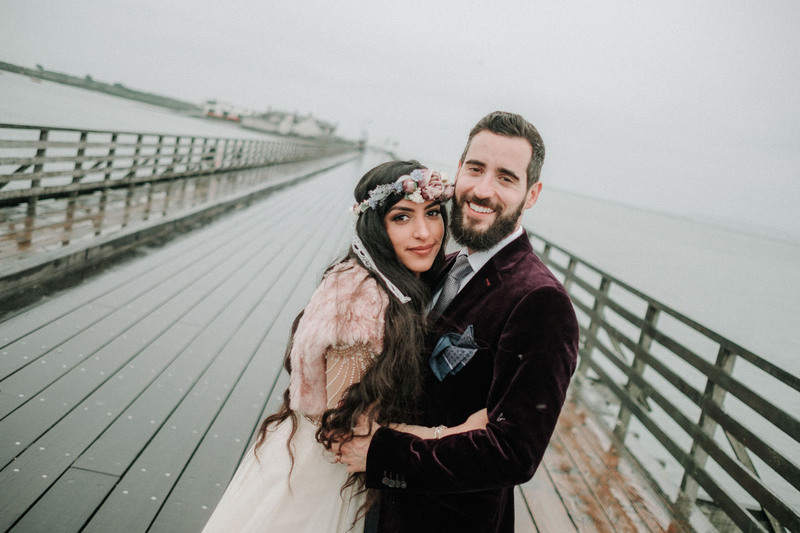 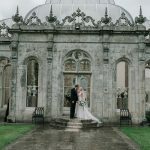 We took some time out with the newly married Alexandra and Alessandro, for some bridal portraits along the cliffs, under umbrellas in the rain, with Dublin’s pool beg chimney’s sitting prominently in the distance across the ocean. 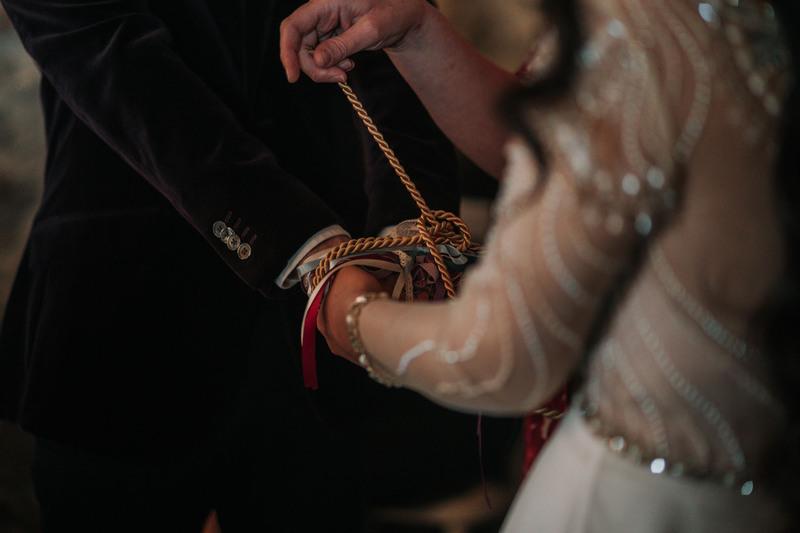 What a fantastic day of celebrations and it was only the beginning. 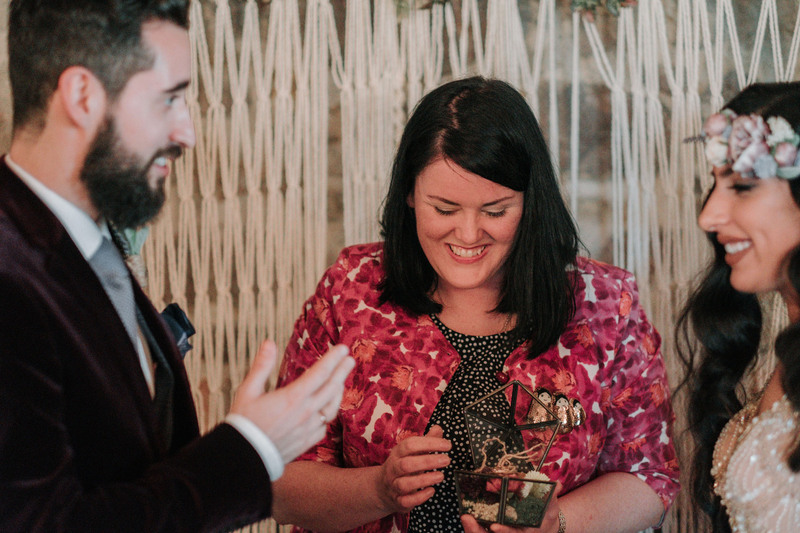 Stay tuned for part 2 when we all made our way to the Liquor Rooms, in Dublin’s City Center, to hit the dance floor. 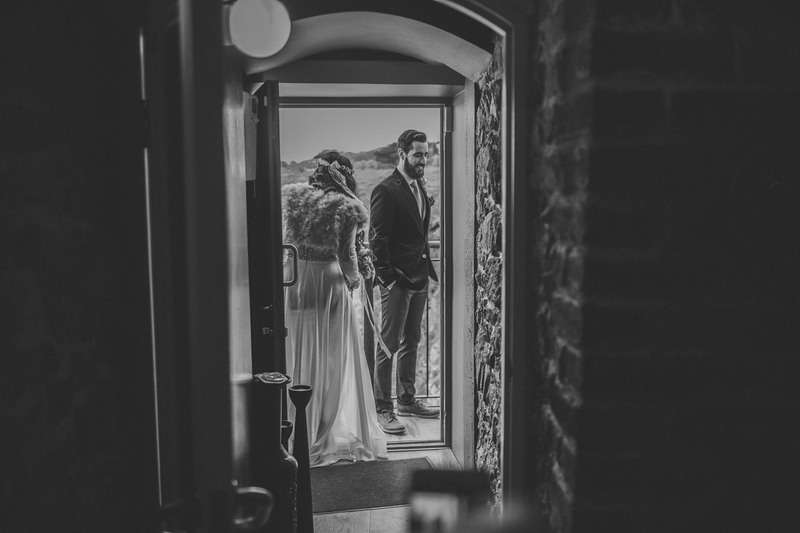 Alessandro is also an excellent photographer in his own right and his work can be seen here.